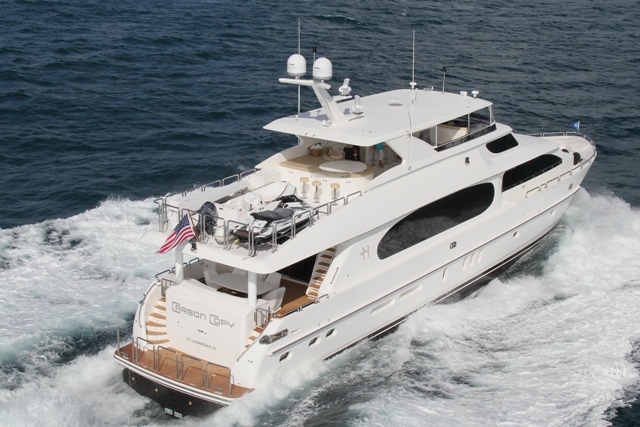 Launched in 2014, superyacht CARBON COPY is a beautiful vessel, built by the well-known US shipyard, Hargrave Custom Yachts. 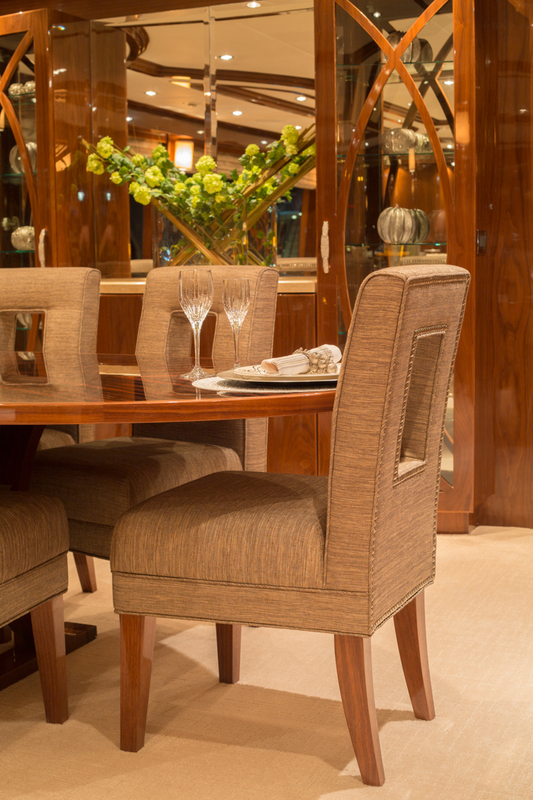 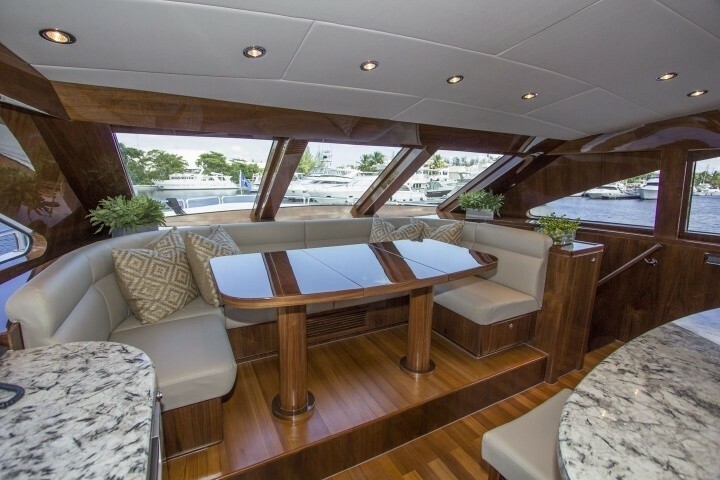 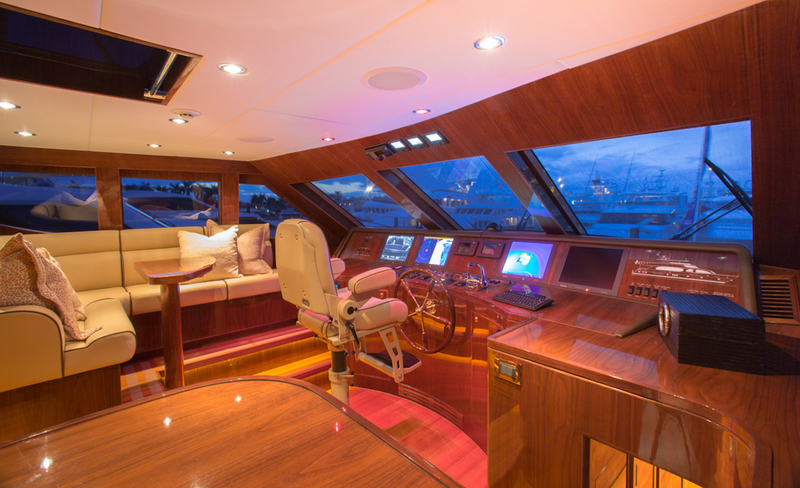 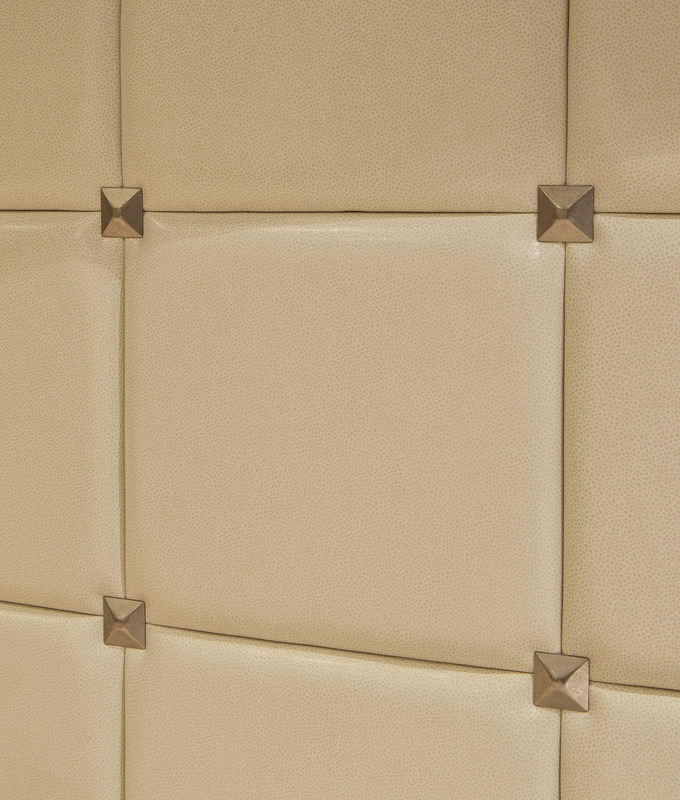 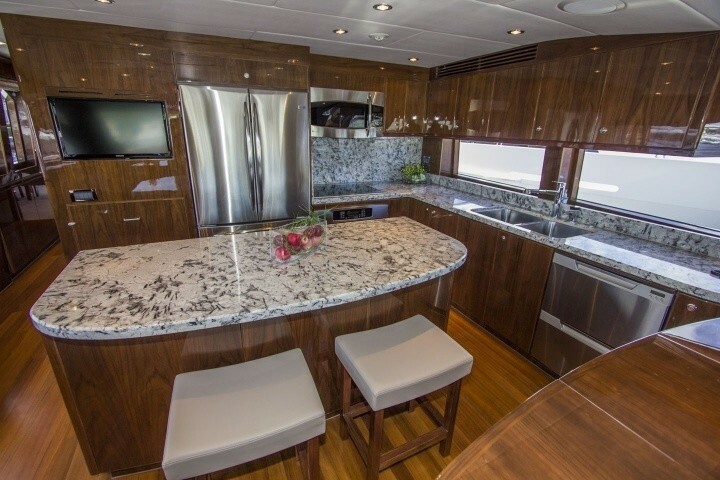 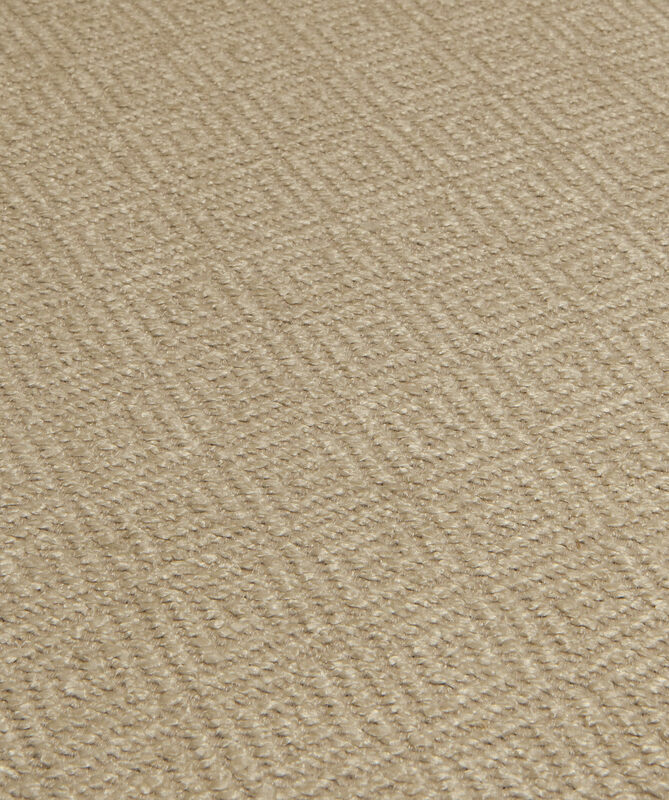 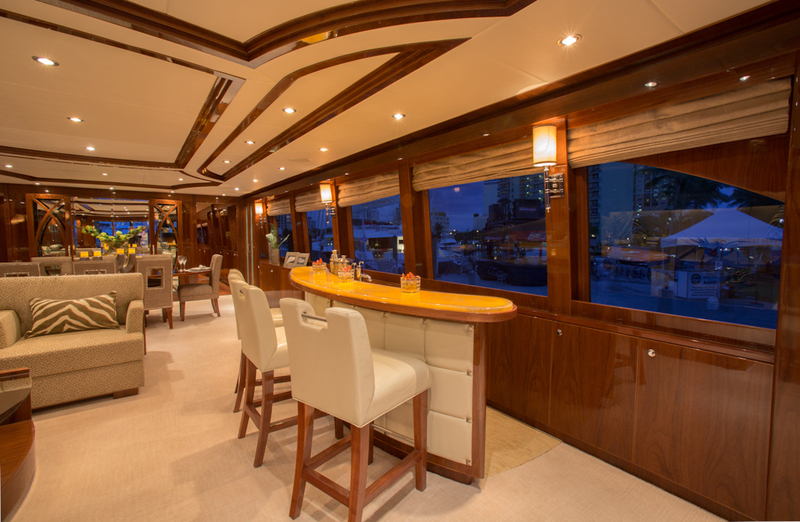 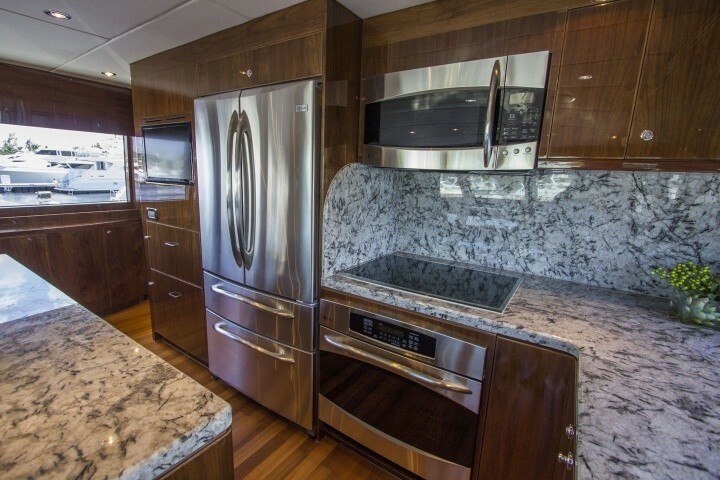 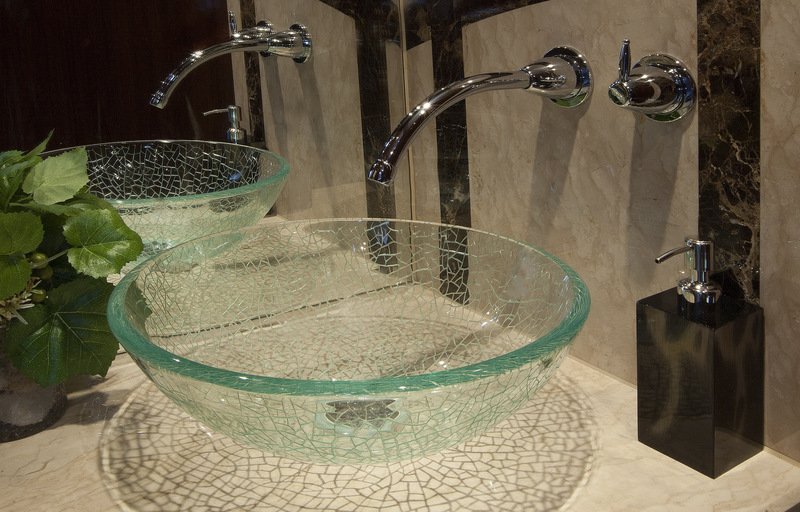 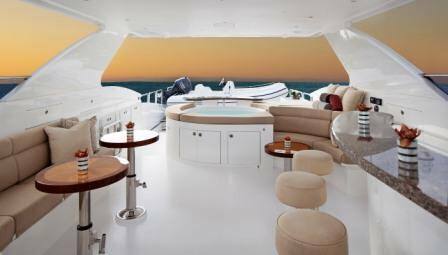 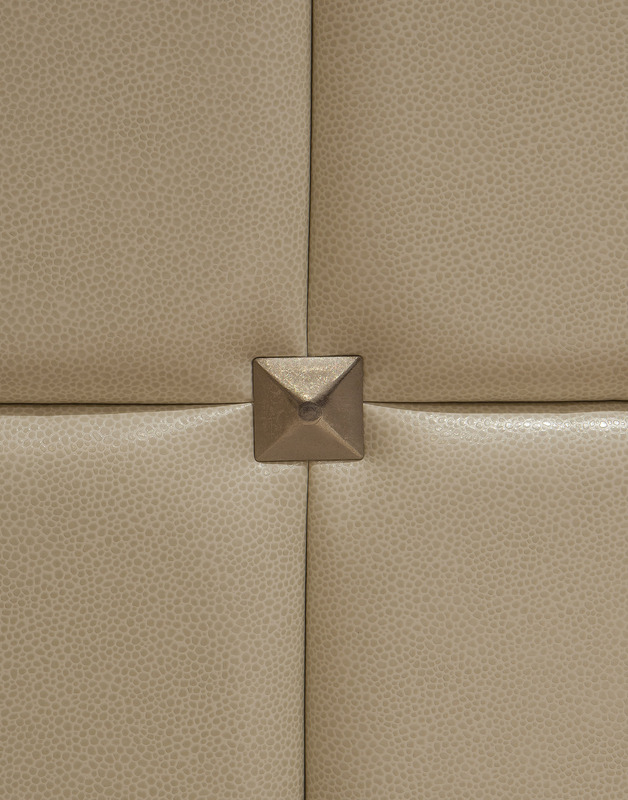 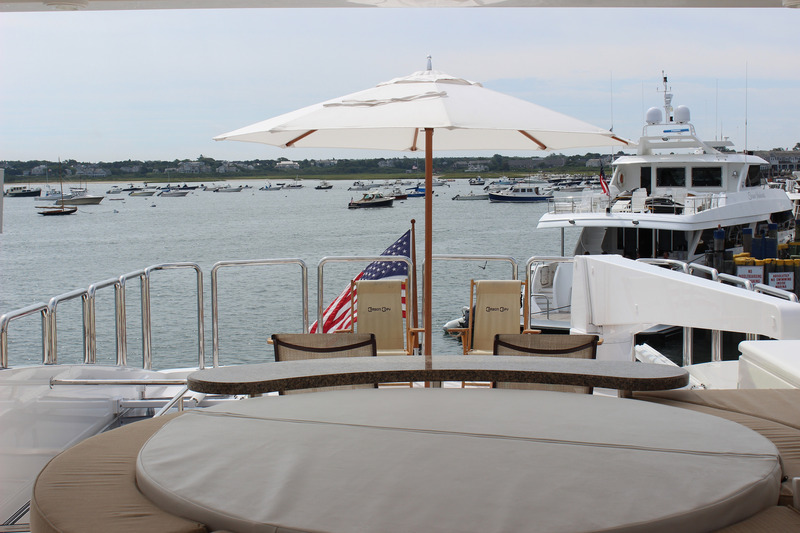 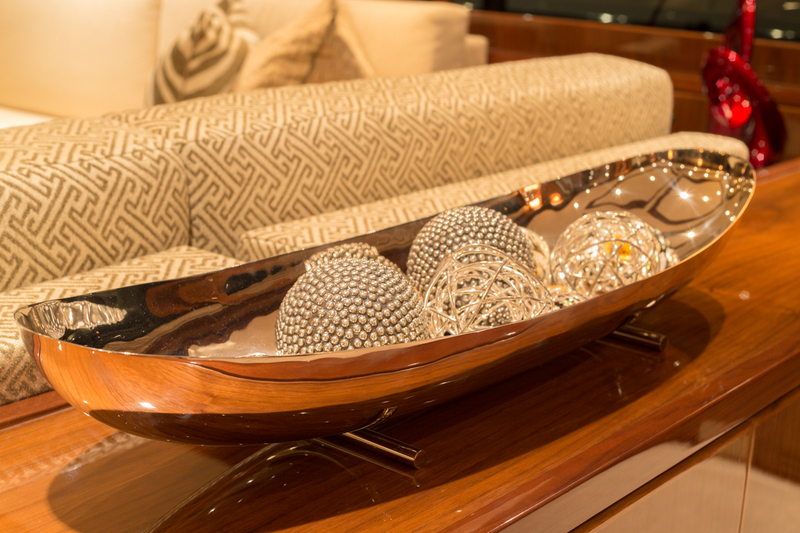 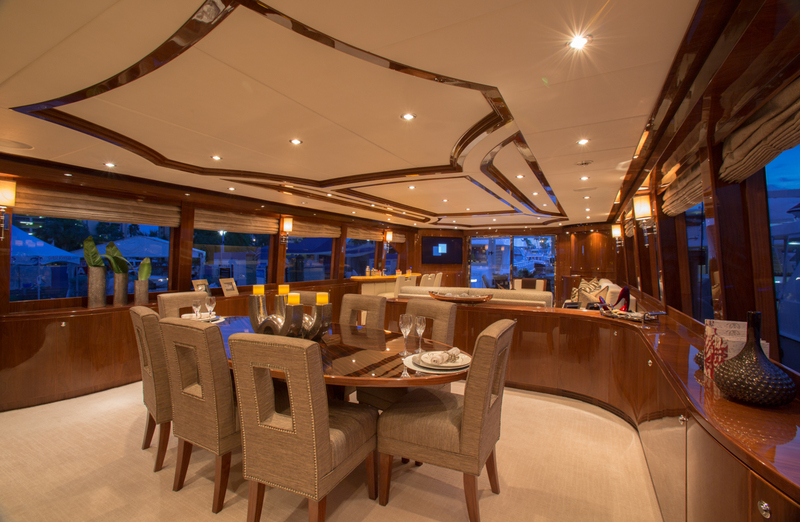 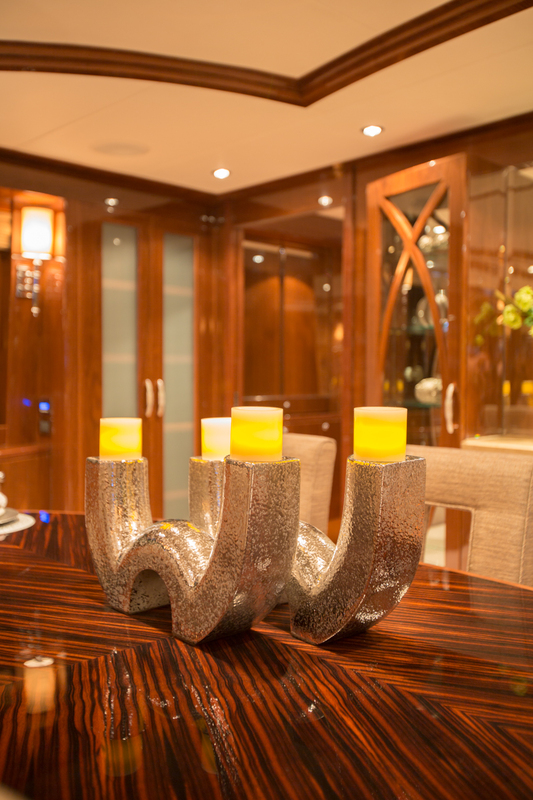 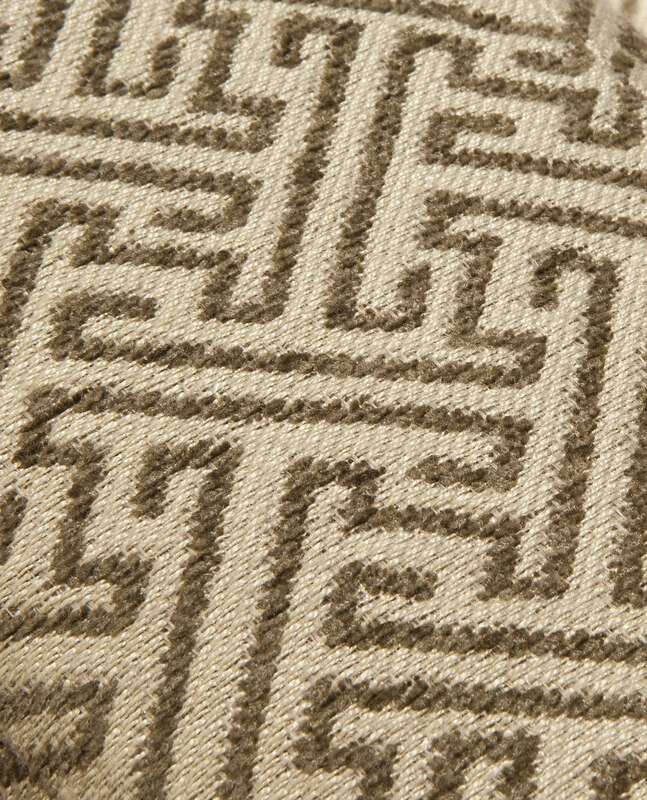 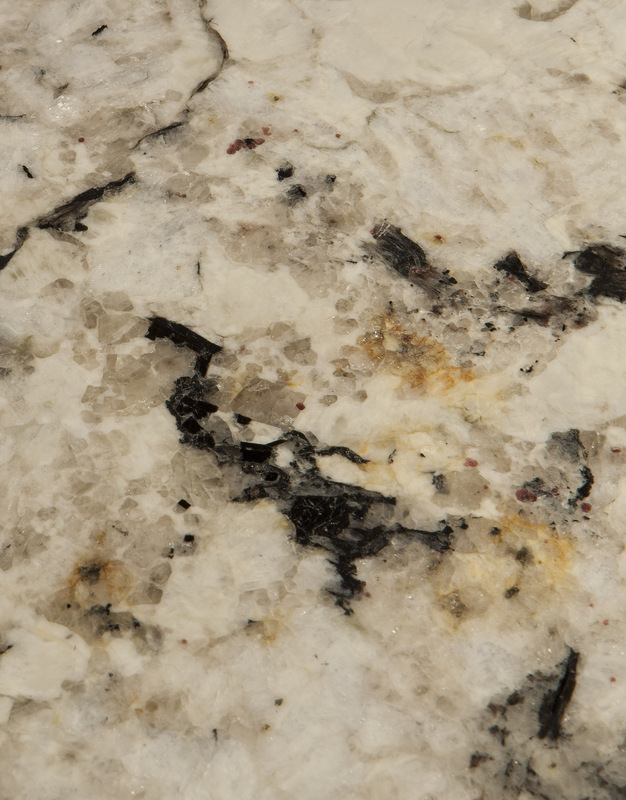 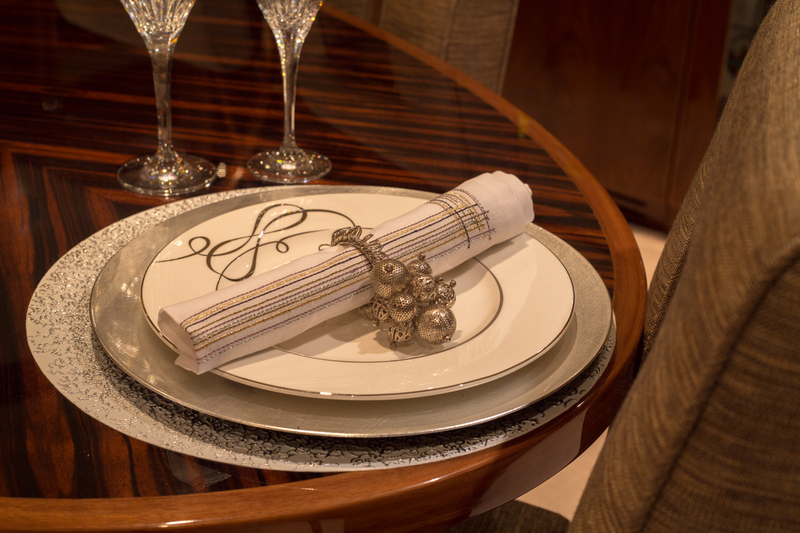 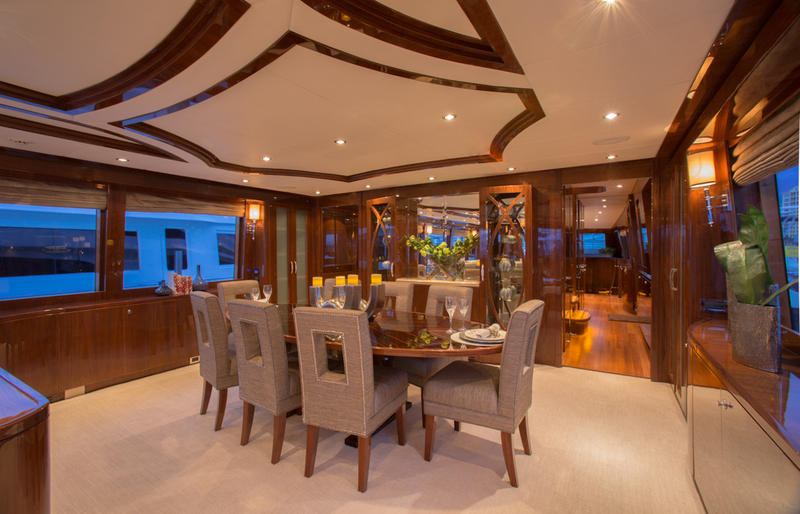 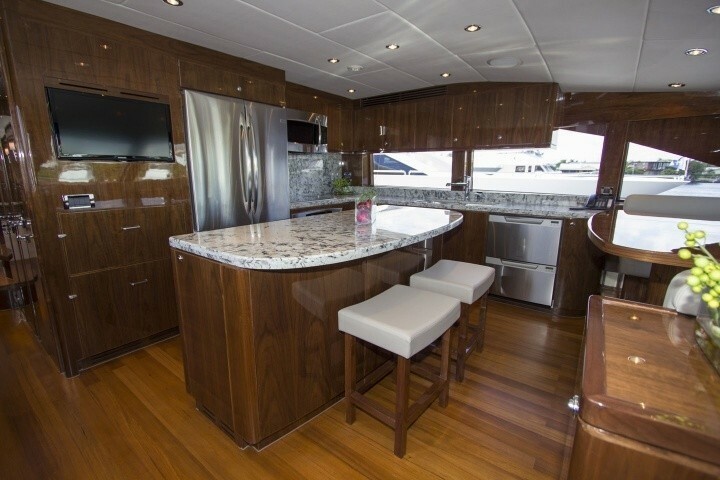 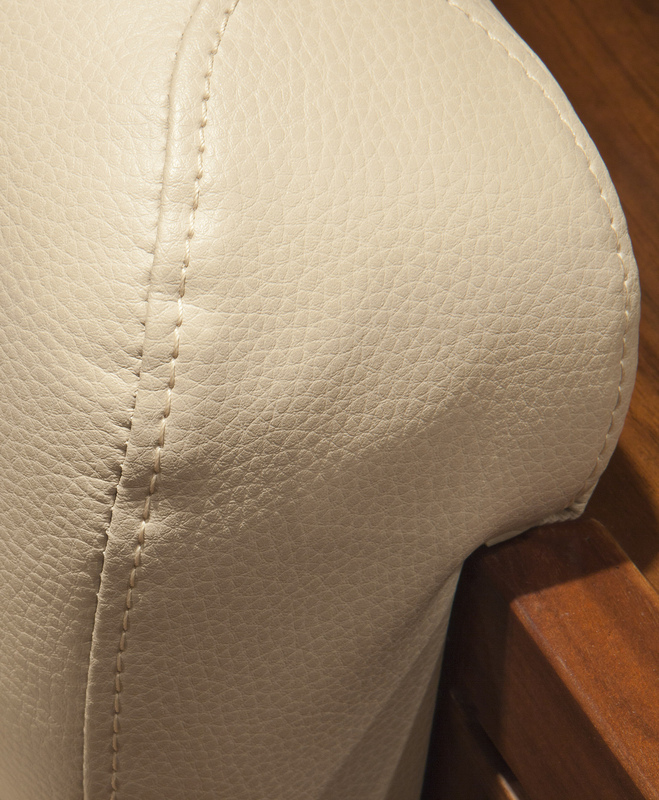 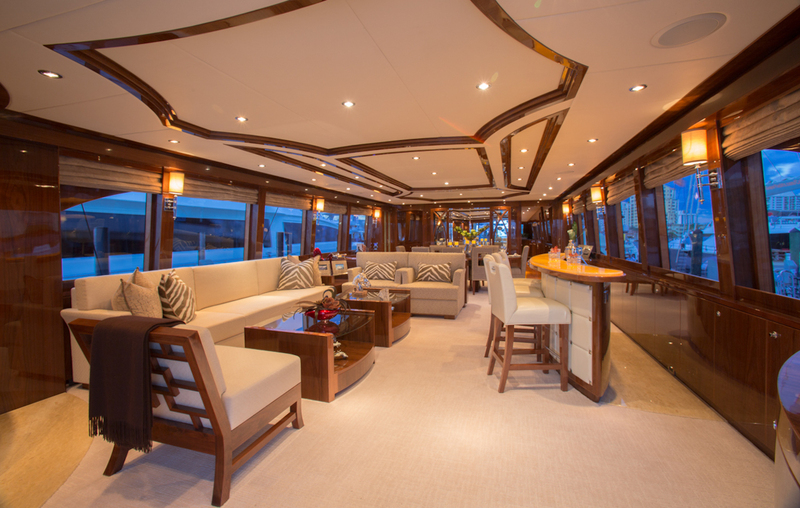 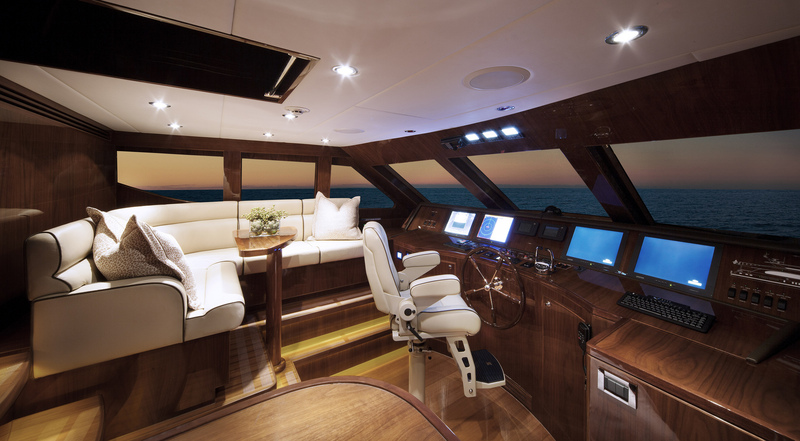 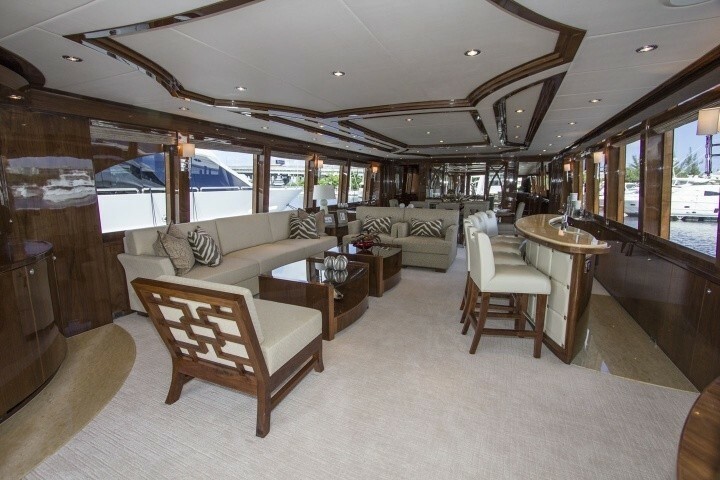 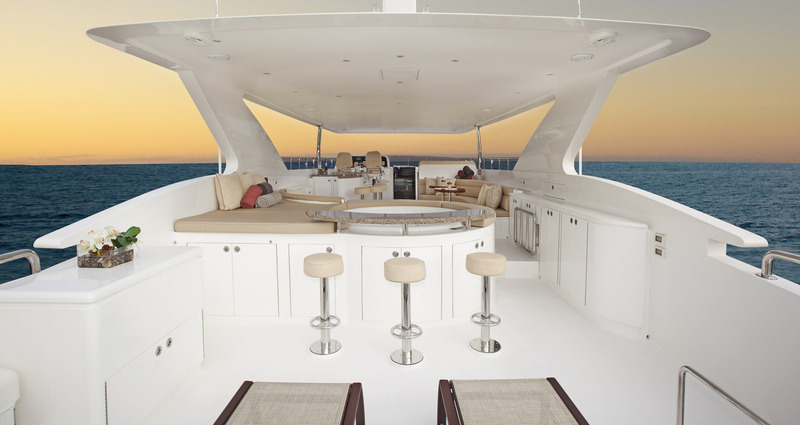 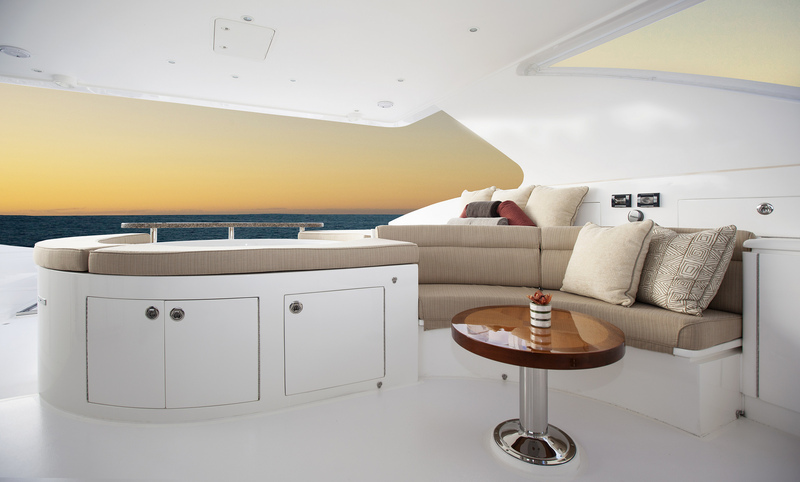 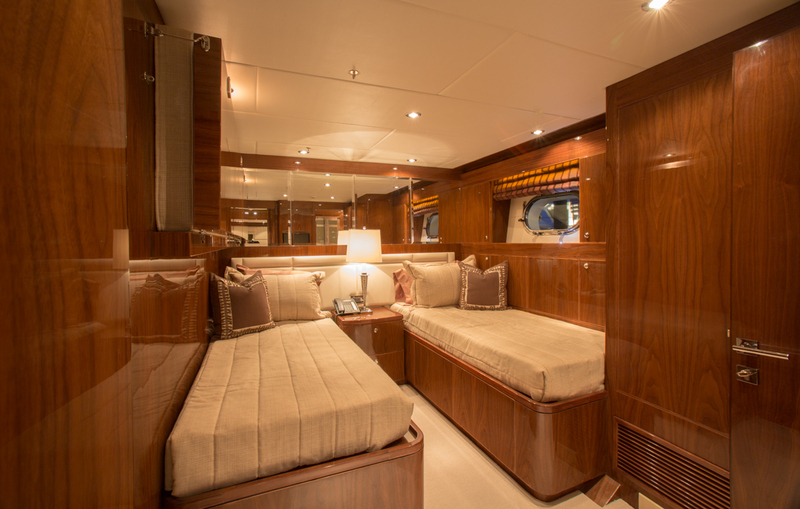 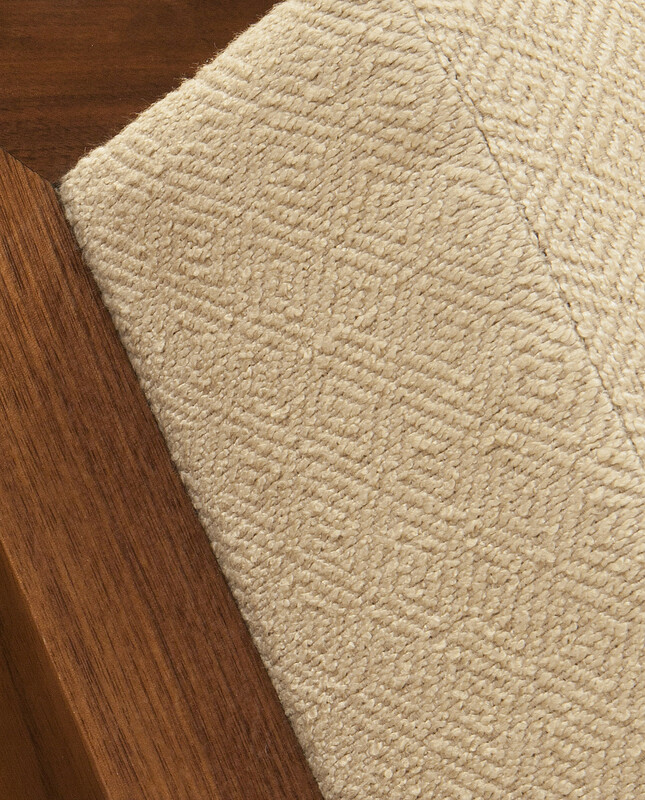 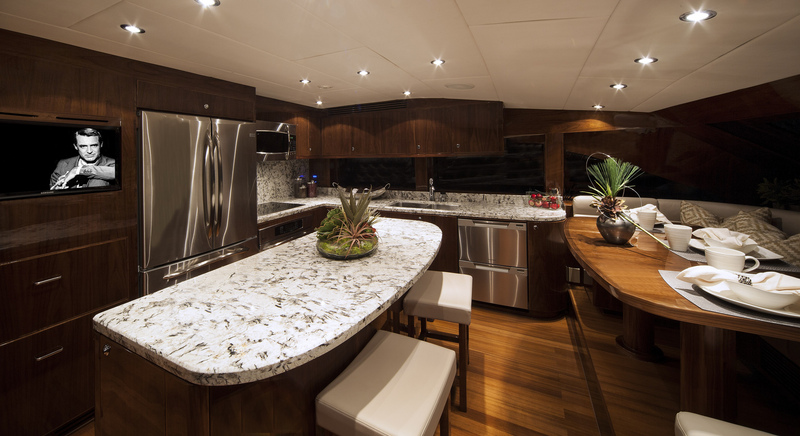 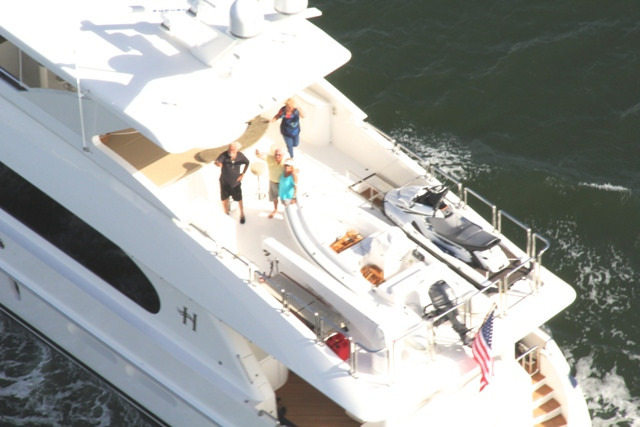 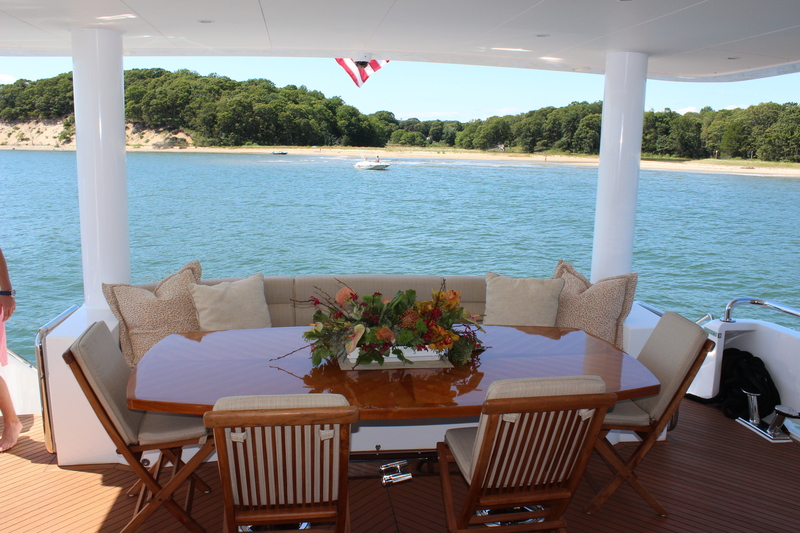 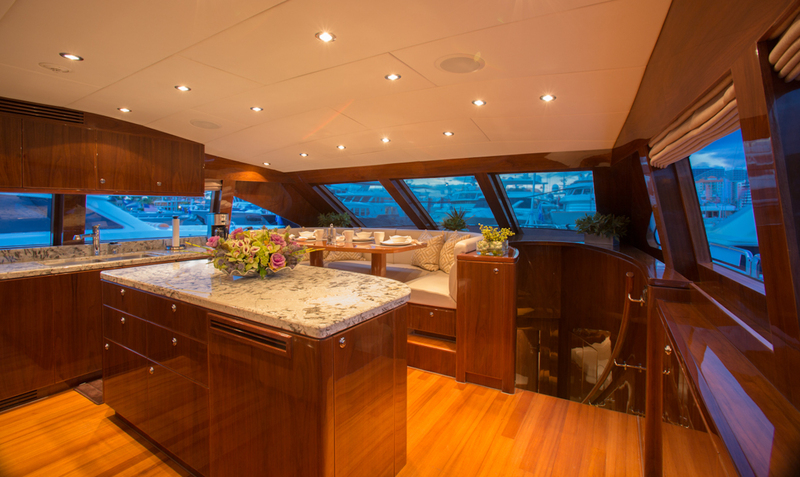 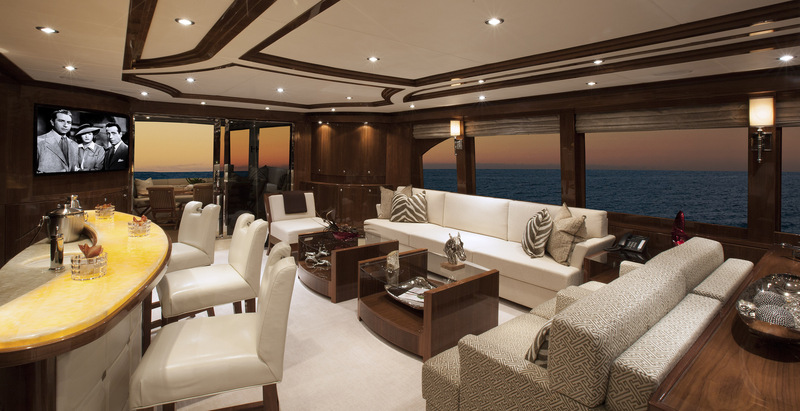 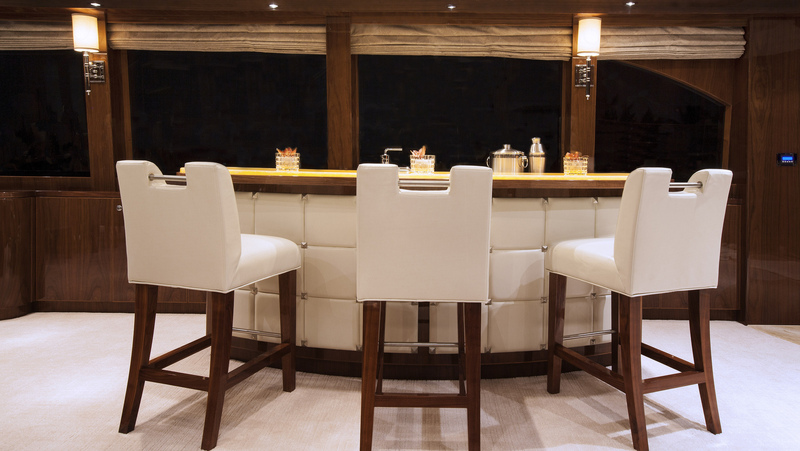 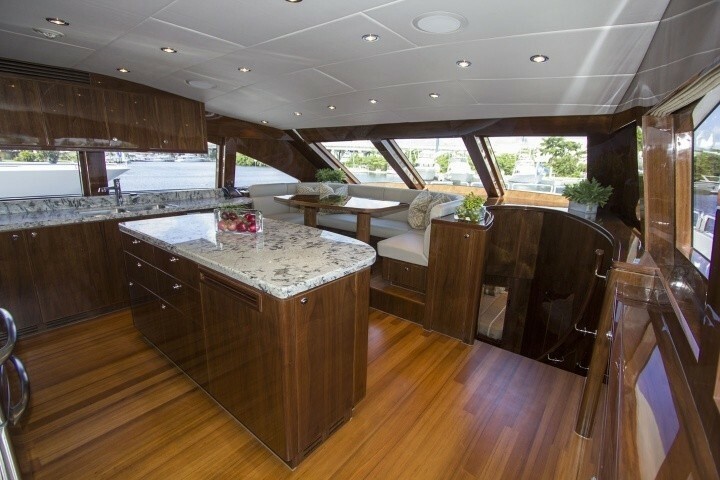 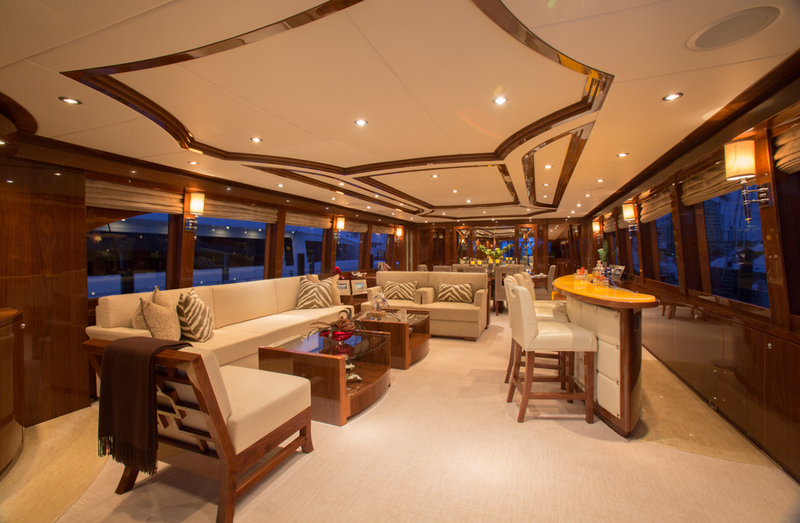 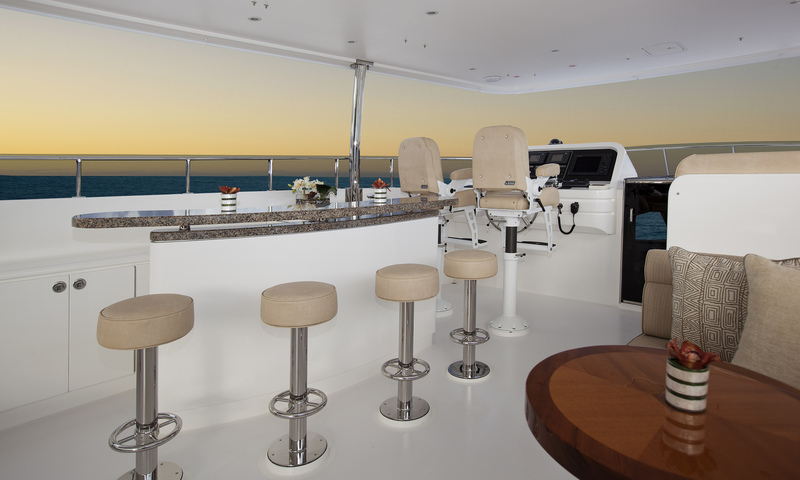 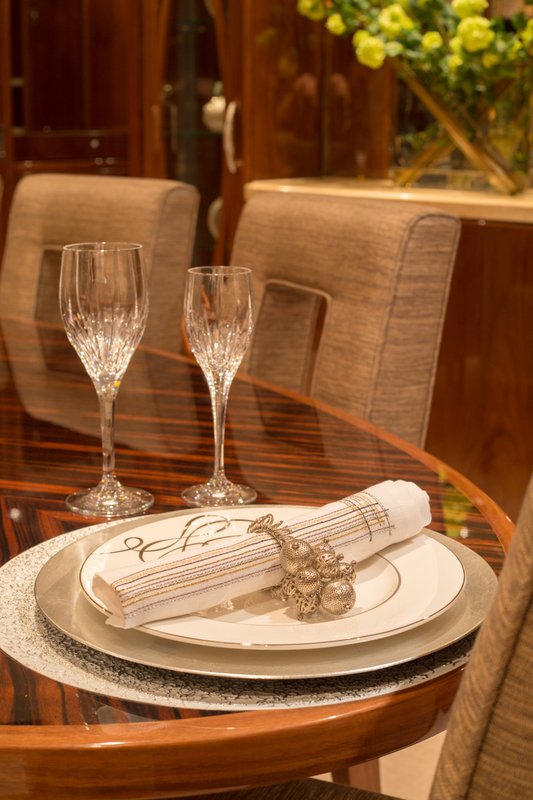 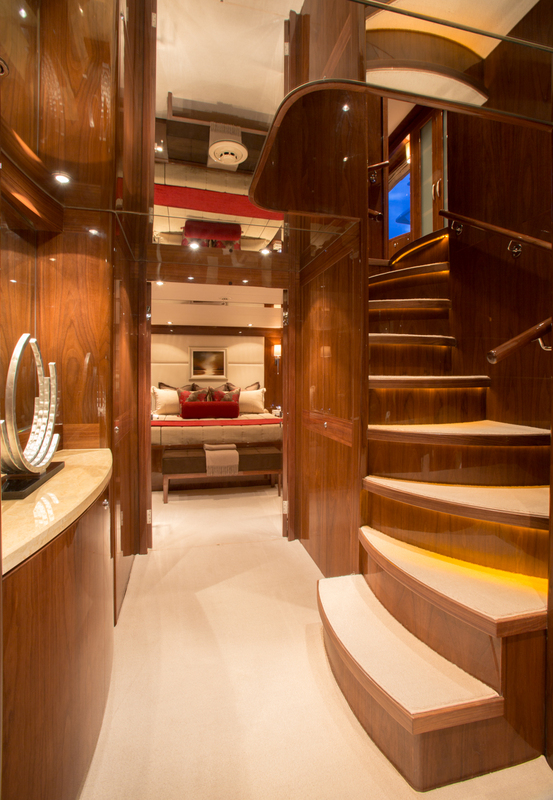 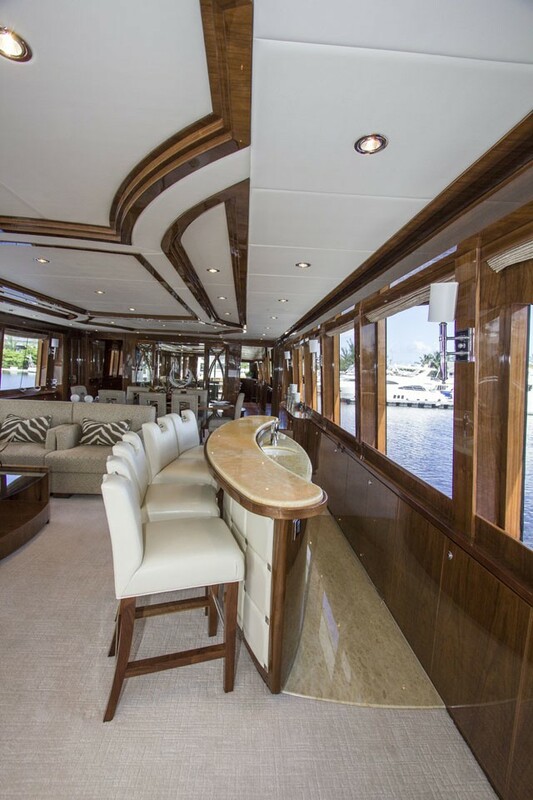 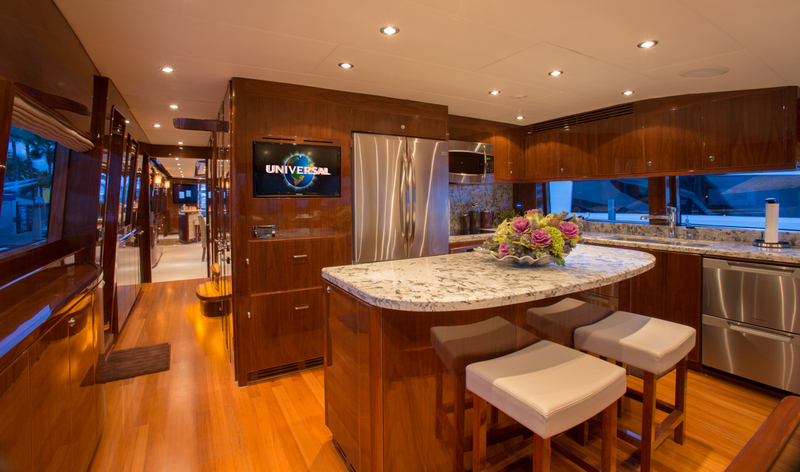 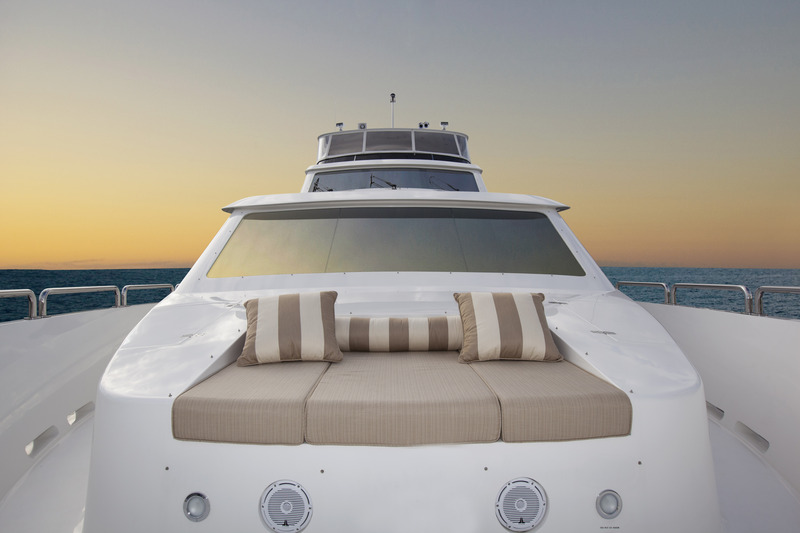 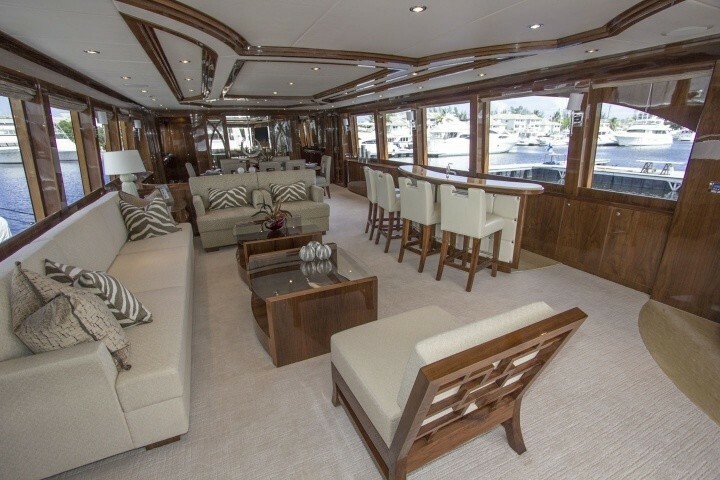 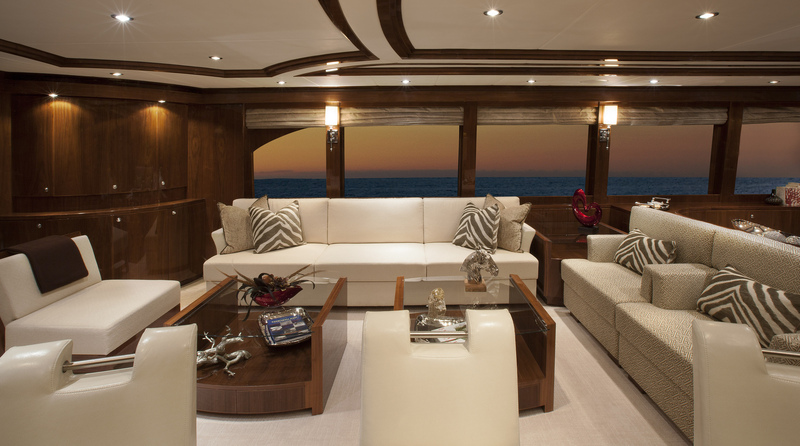 She features lovely custom interiors, created by Yacht Interiors by Shelley. 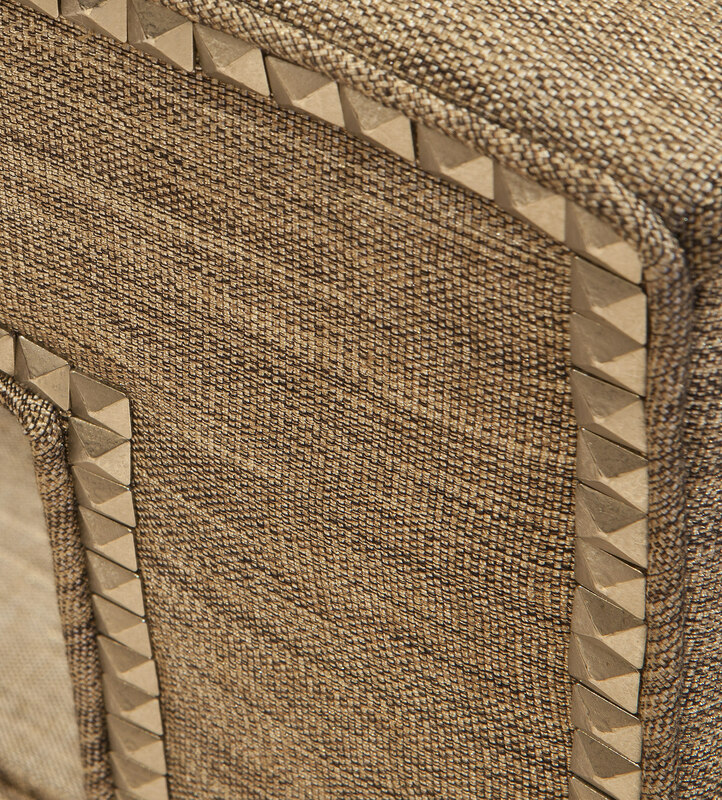 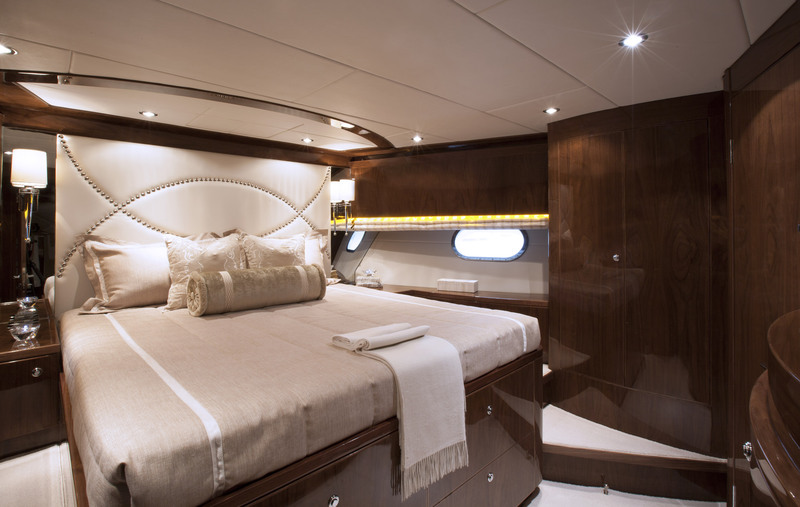 She features an elegant neutral interior décor, plush furnishings and soft lighting. 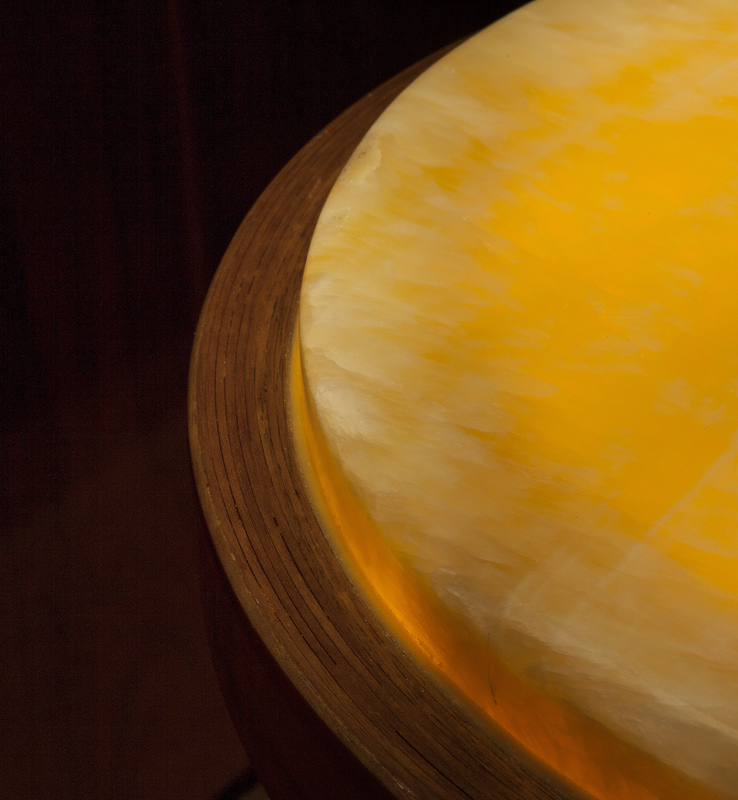 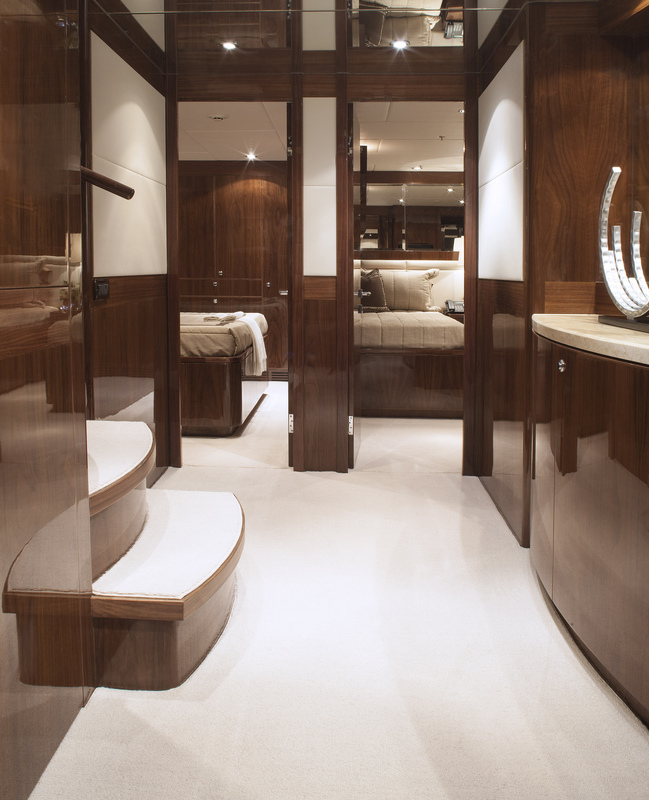 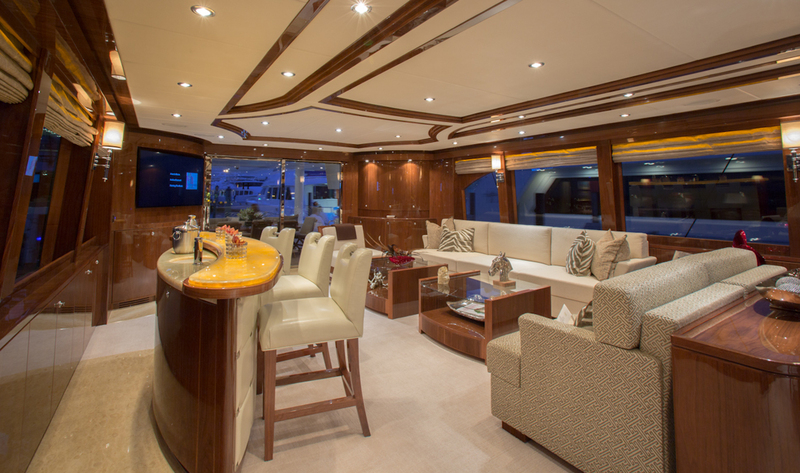 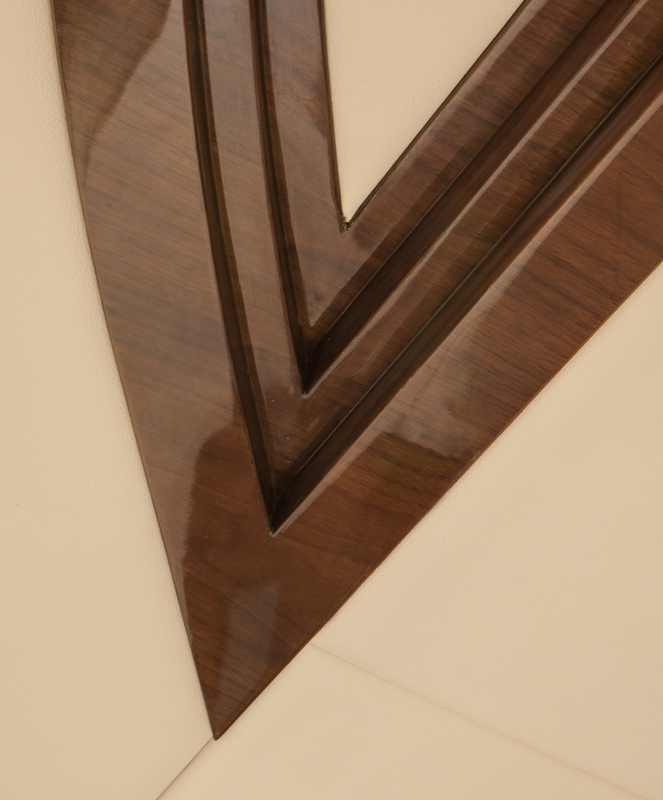 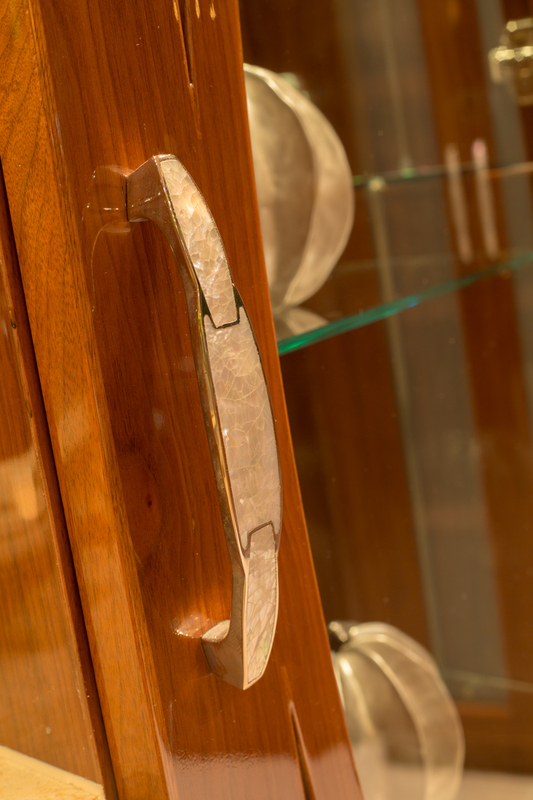 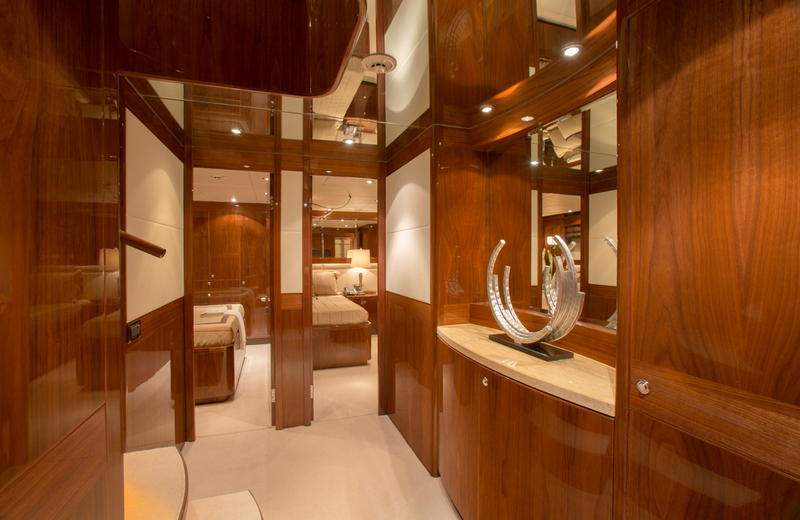 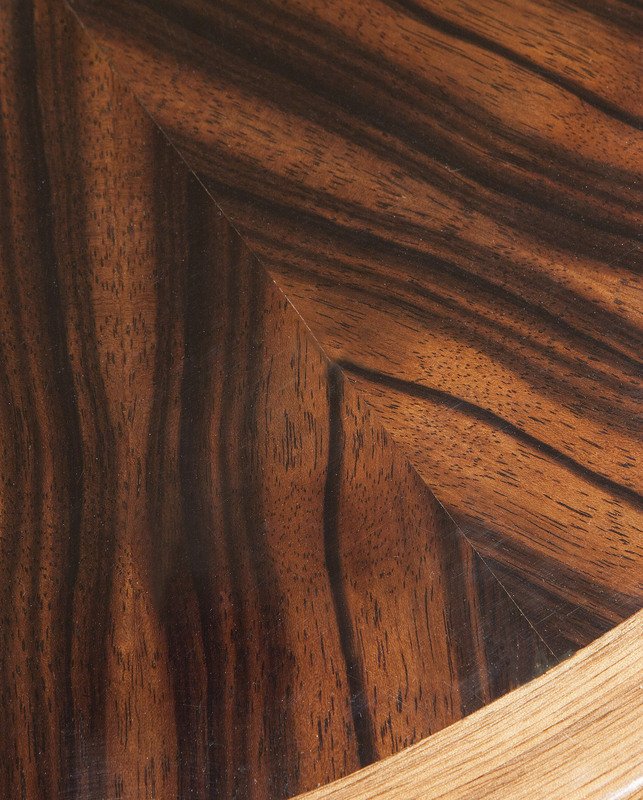 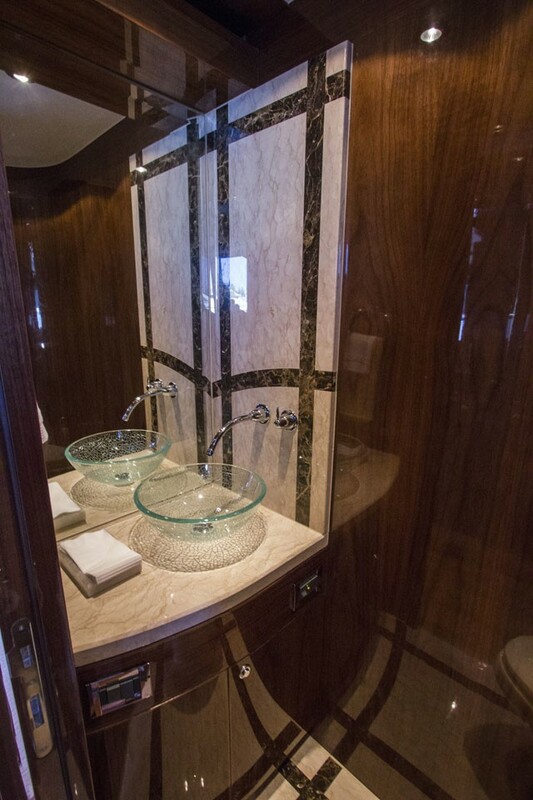 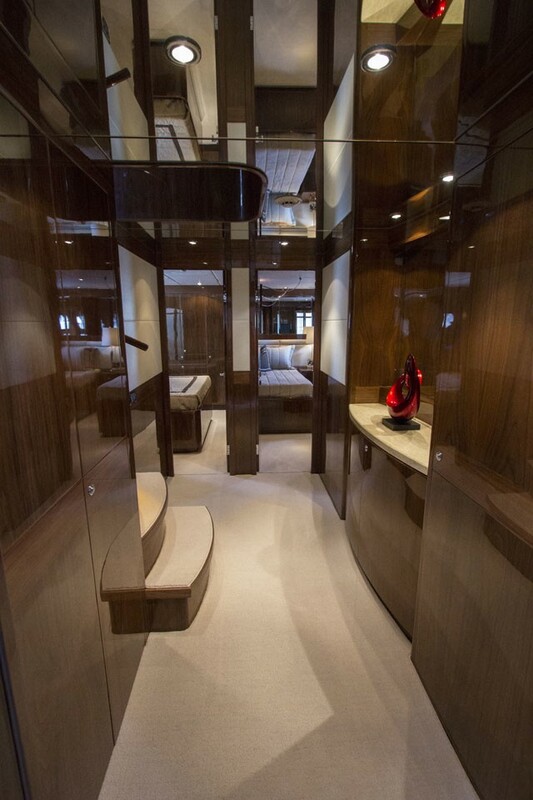 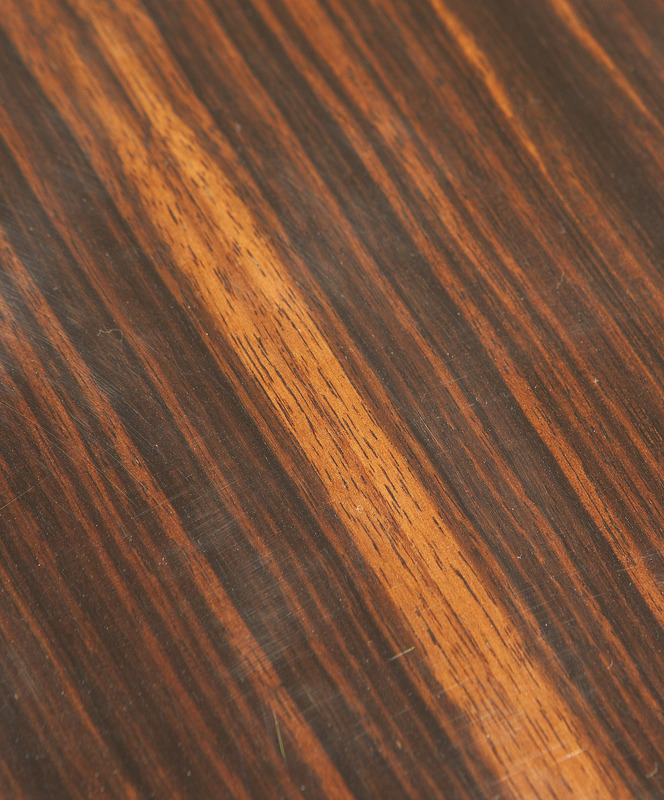 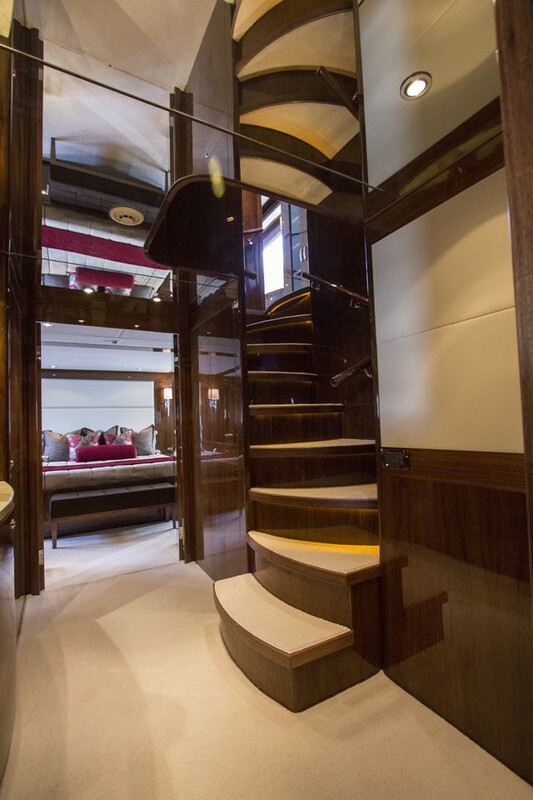 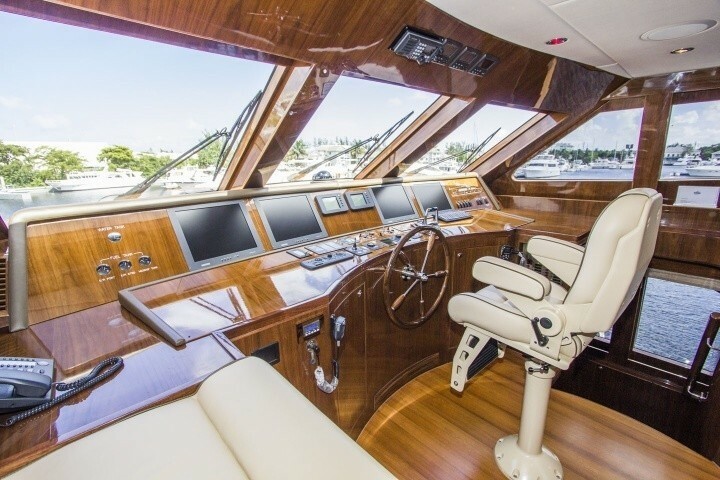 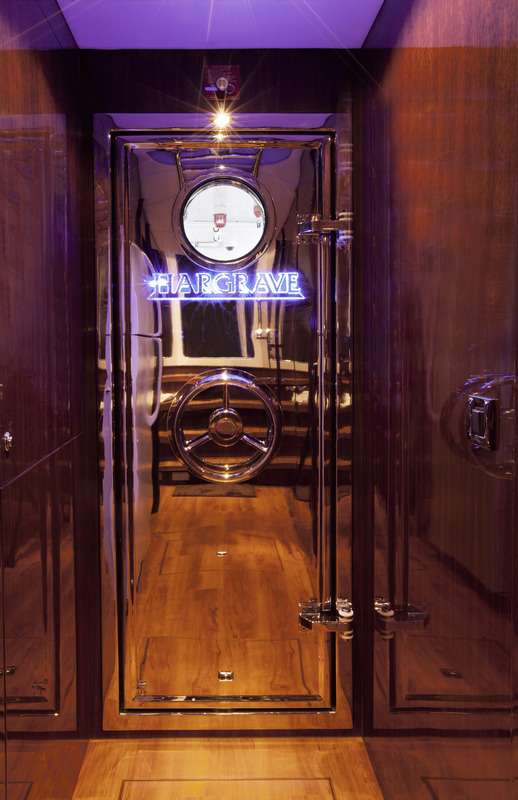 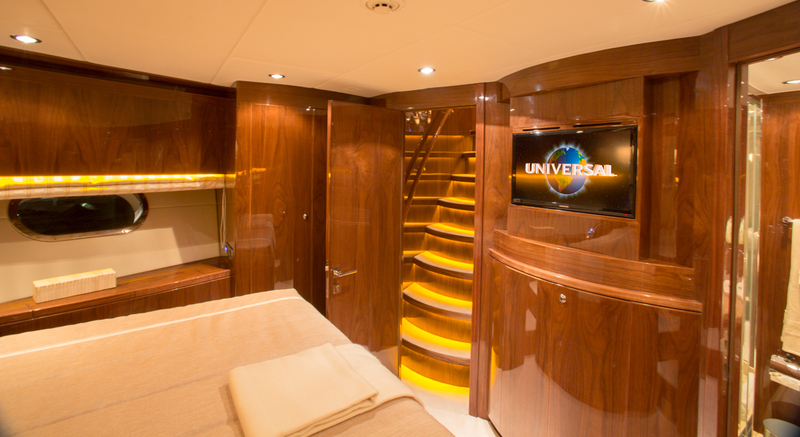 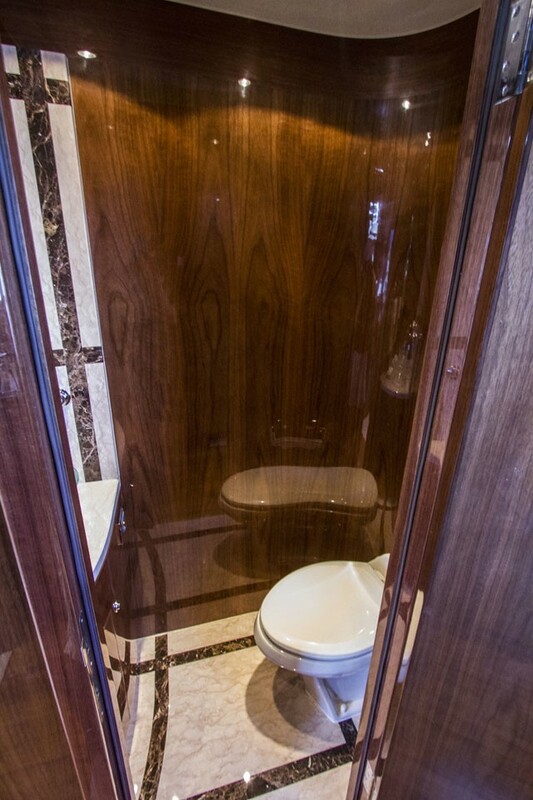 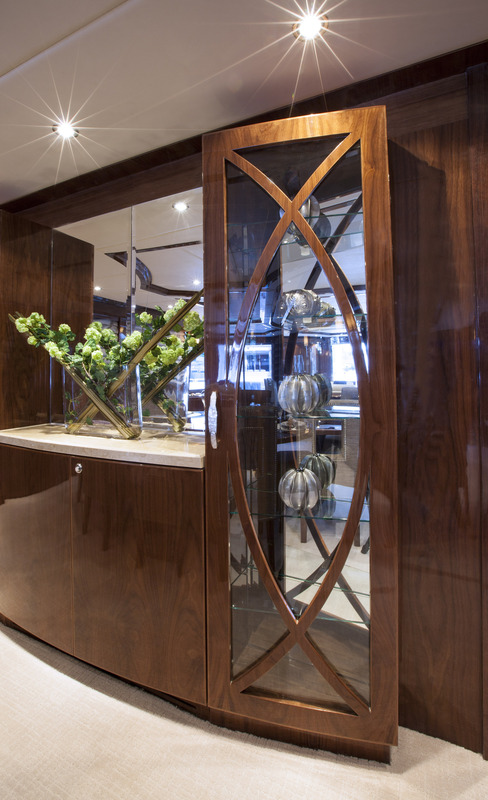 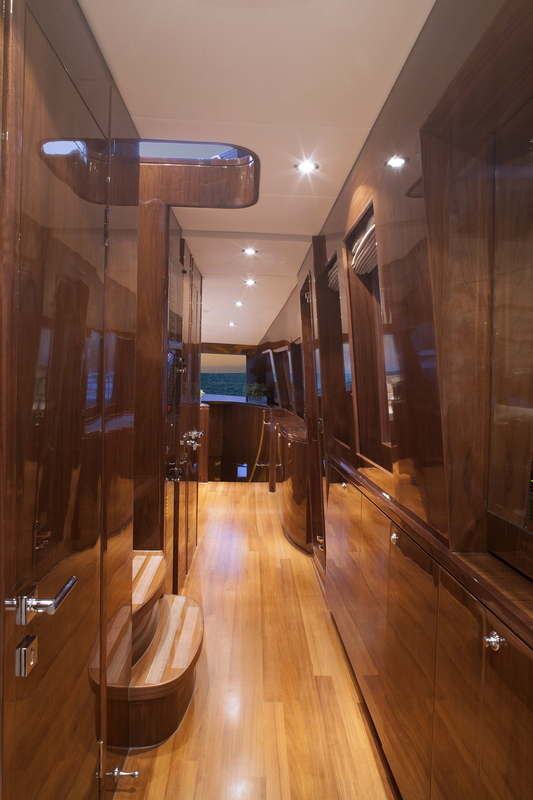 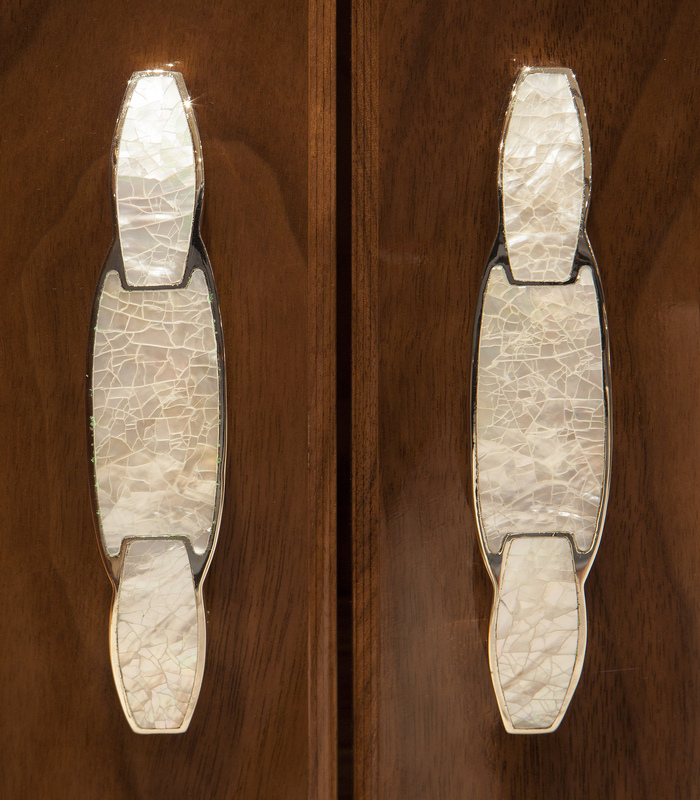 Bespoke walnut woods with intricate inlays throughout, fine marbles and a fantastic electronics package create the ultimate luxury charter yacht. 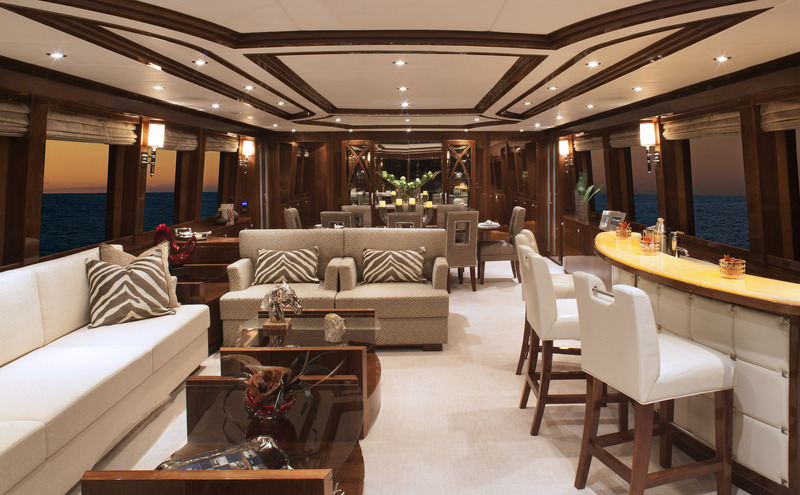 The main salon offers a generous lounge with sofa, occasional chairs, coffee tables, wet bar and full entertainment systems. 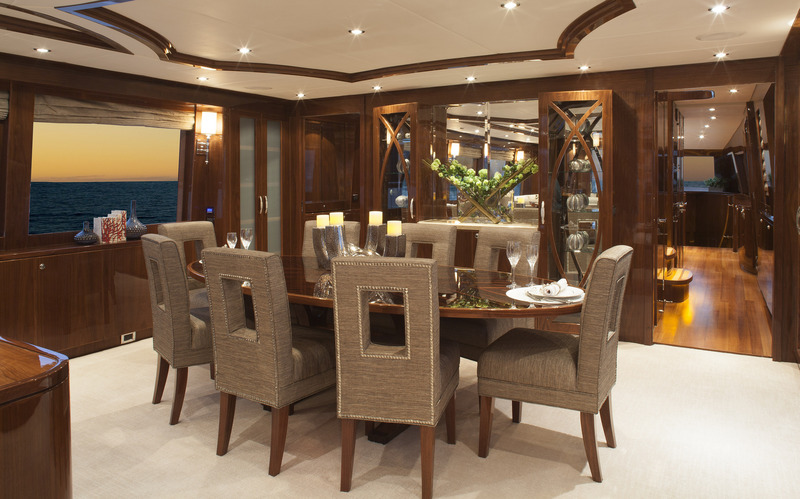 Forward of the salon in an open plan, is the formal dining table. 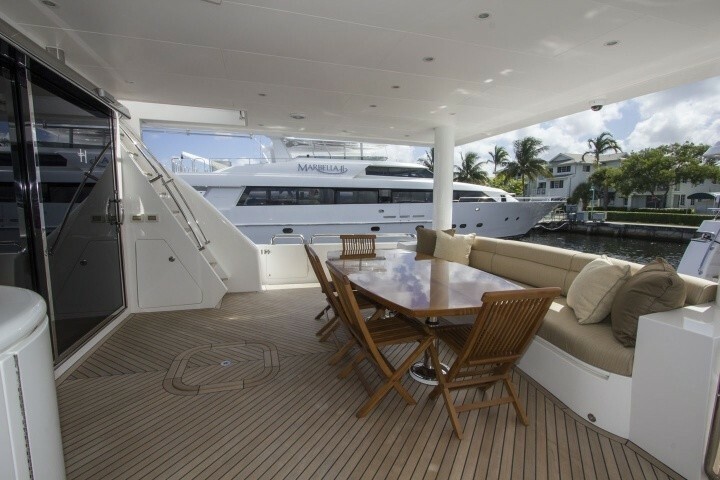 Surrounding panoramic windows allow ample natural light and fabulous views. 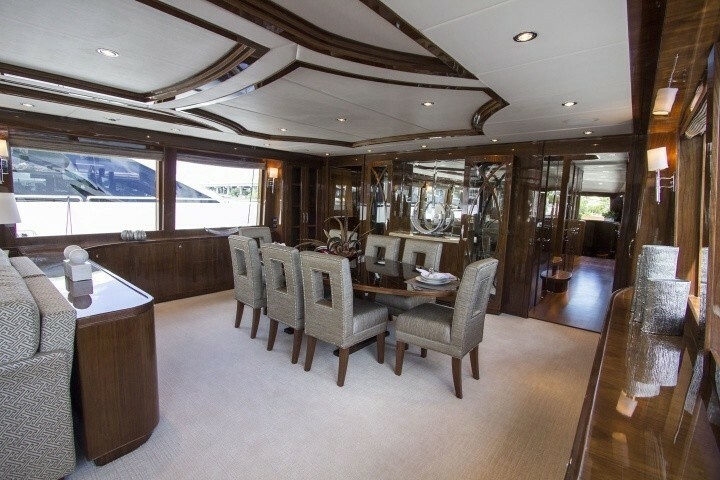 A foyer to starboard passes steps to the upper bridge deck, and onto a full beam country style galley, offering an additional more casual dining space. 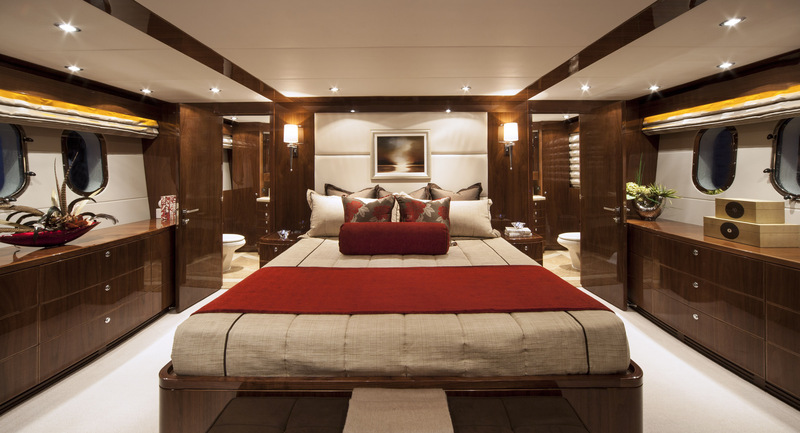 Below decks, this luxury yacht provides elegant and comfortable accommodation to up to 8 charter guests in 4 well-appointed staterooms, including a full beam master suite and completely private VIP suite forward. 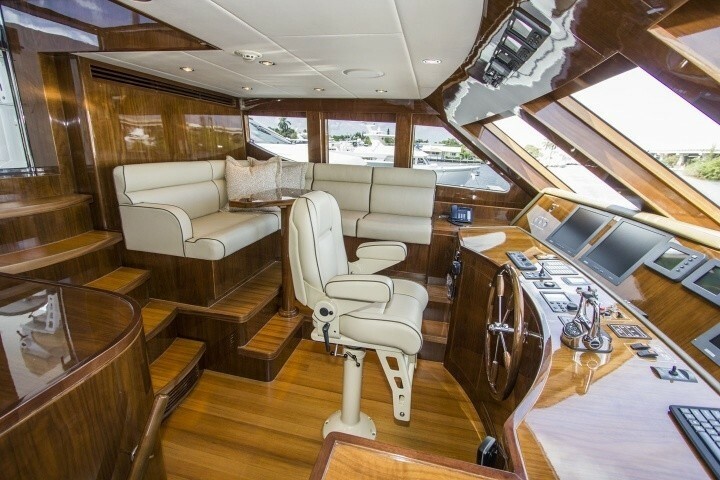 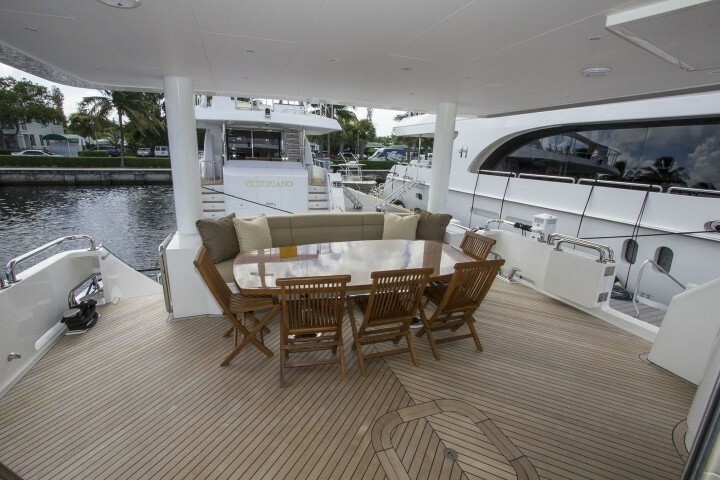 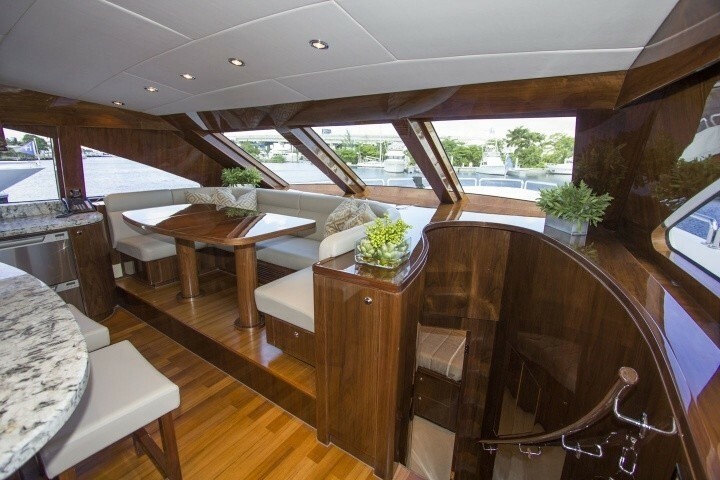 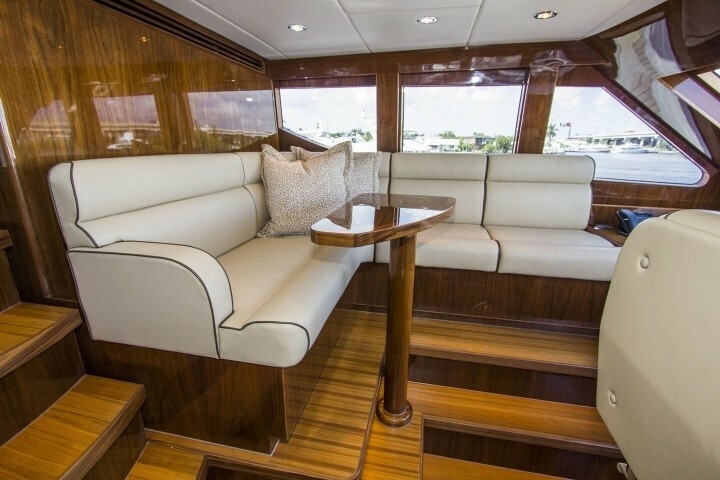 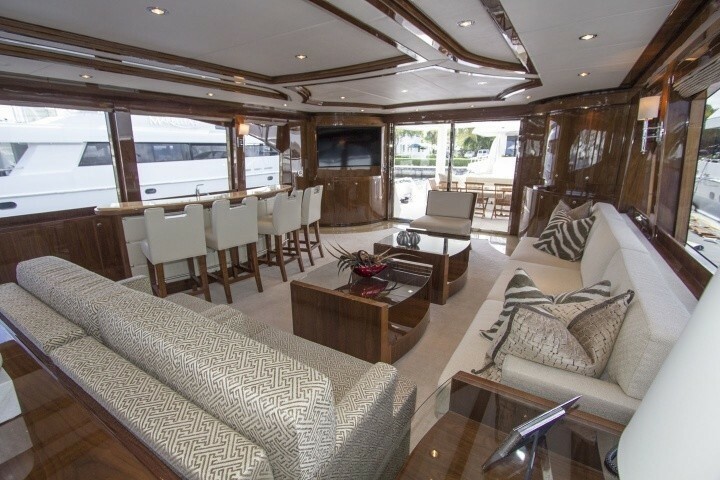 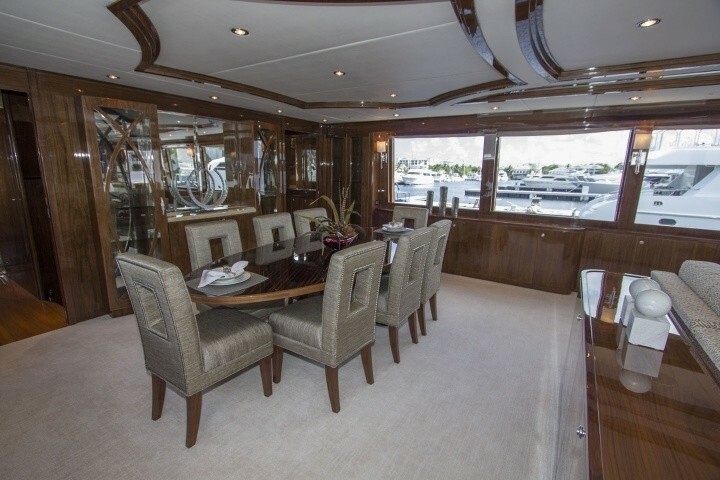 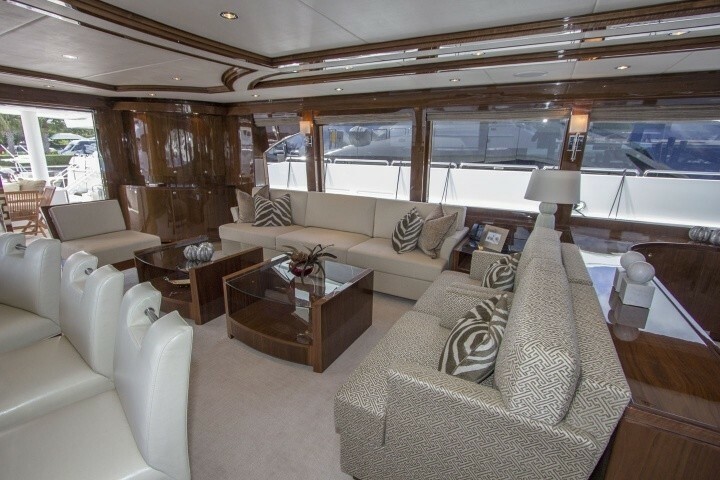 Exterior living aboard the Hargrave yacht is spacious. 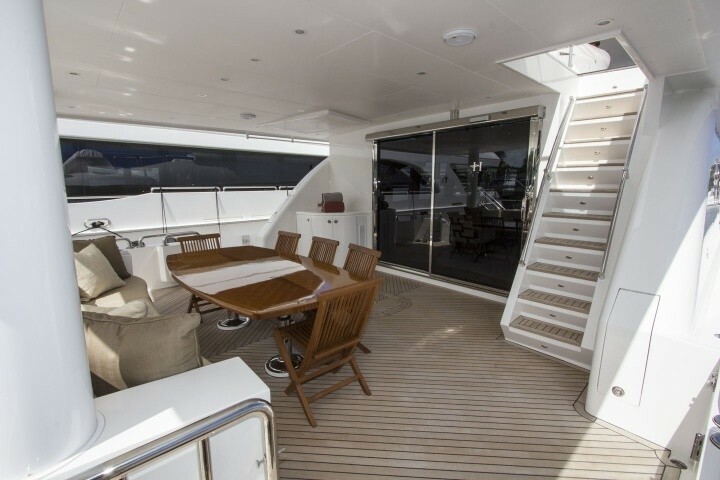 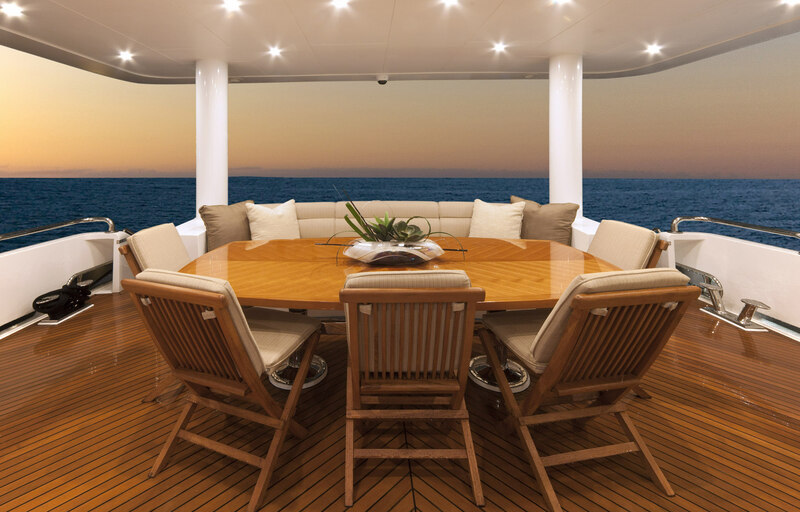 The aft deck is adjacent to the main salon boasting a shaded alfresco dining table and plenty of seating, perfect for socialising and relaxing. 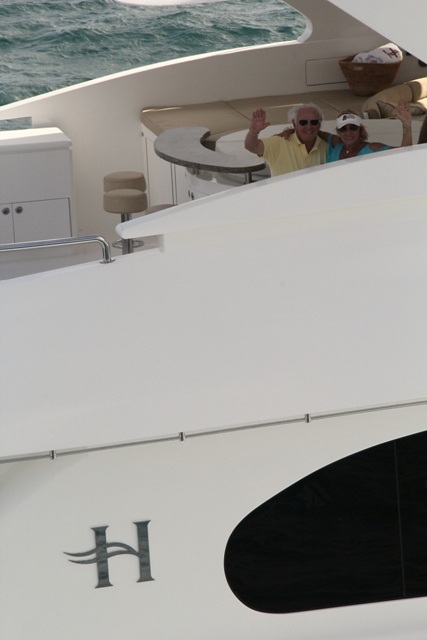 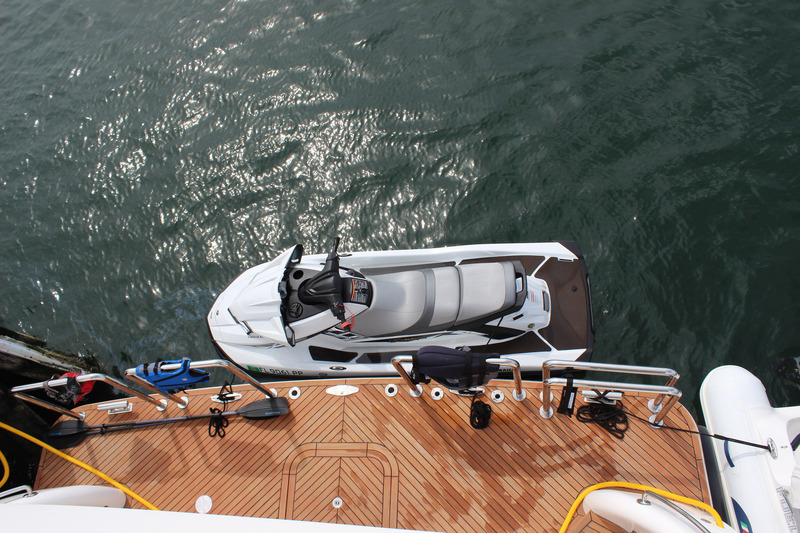 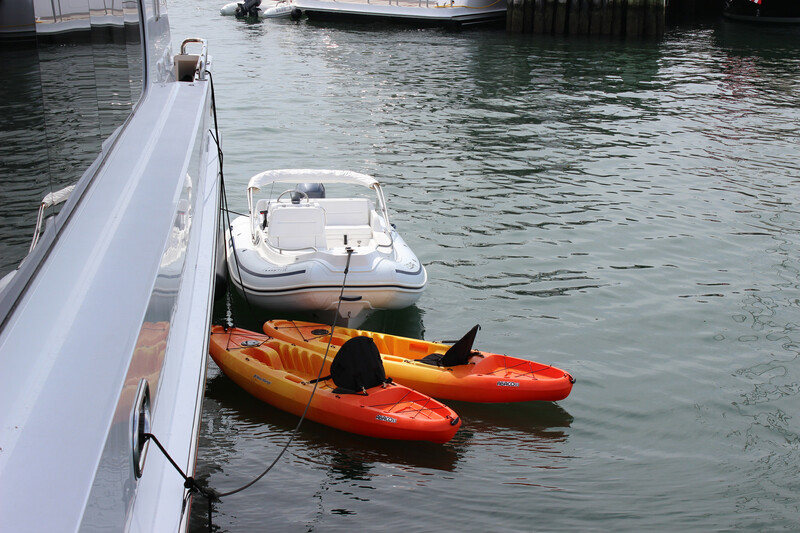 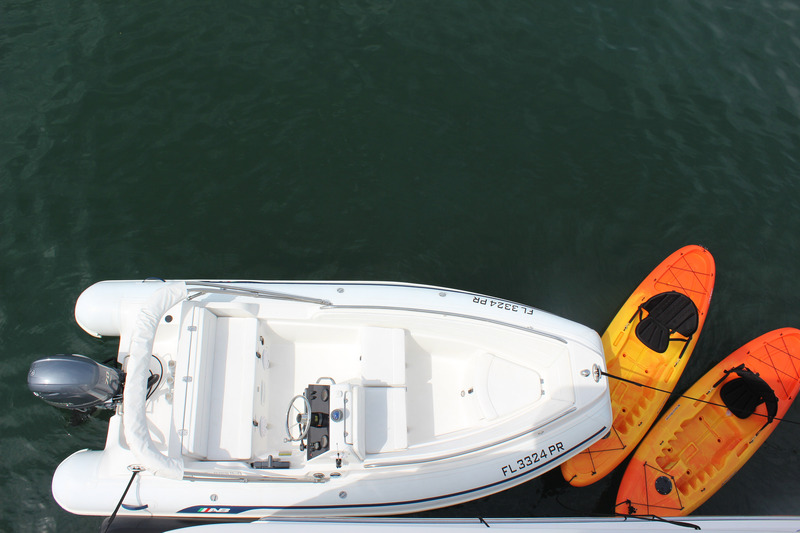 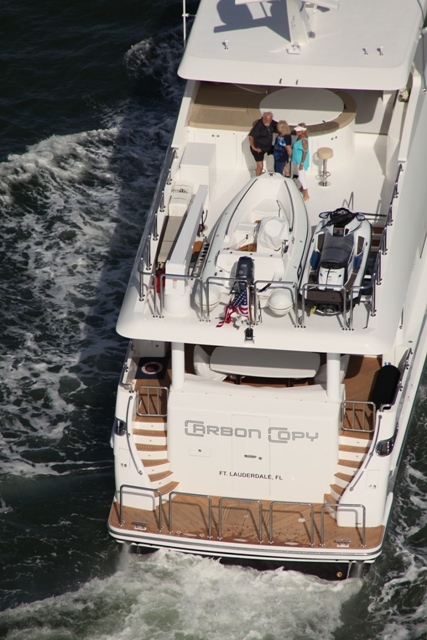 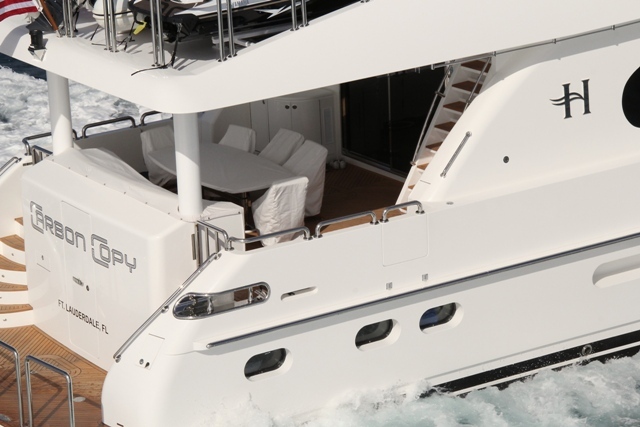 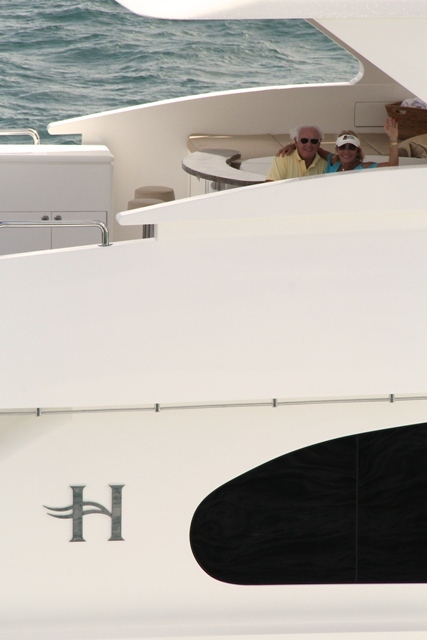 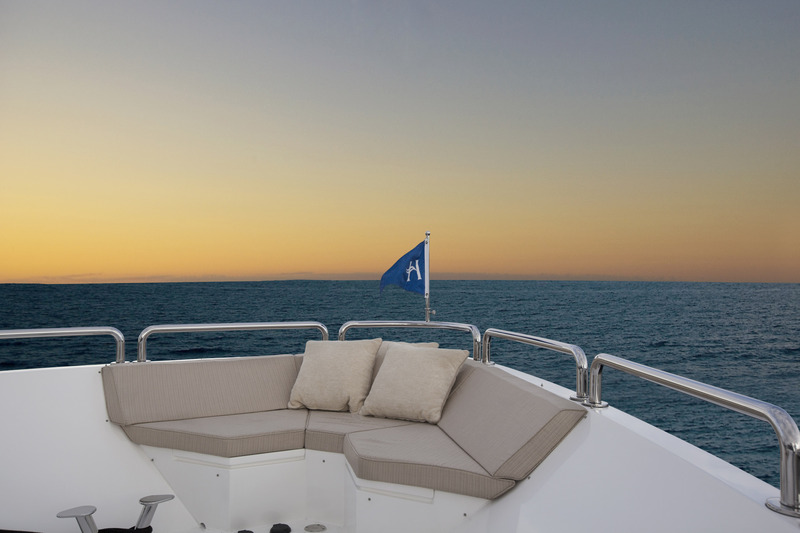 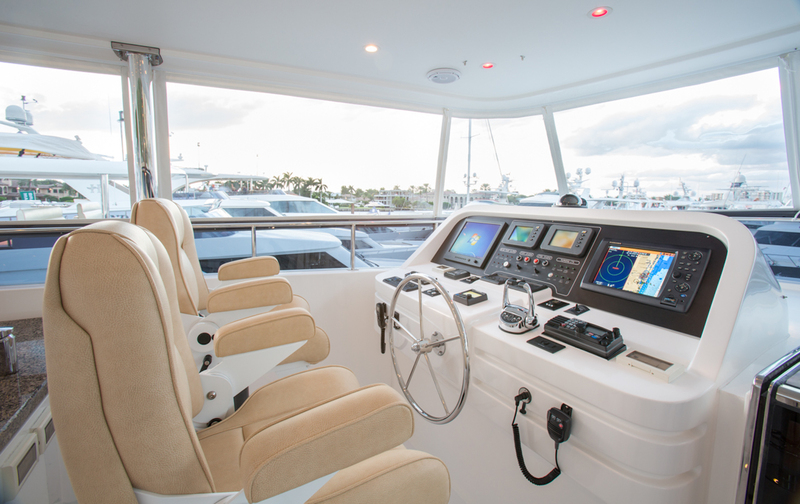 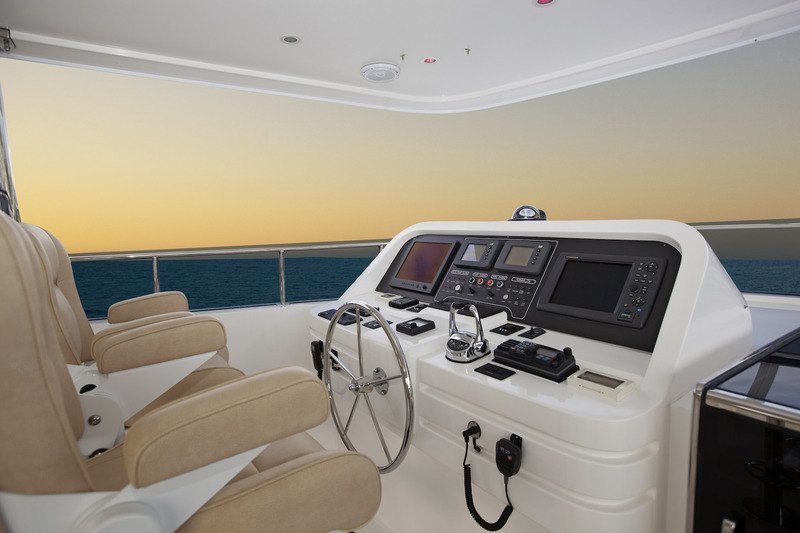 An extended swim platform on the transom ensures effortless water access to the good array of sea toys on offer. 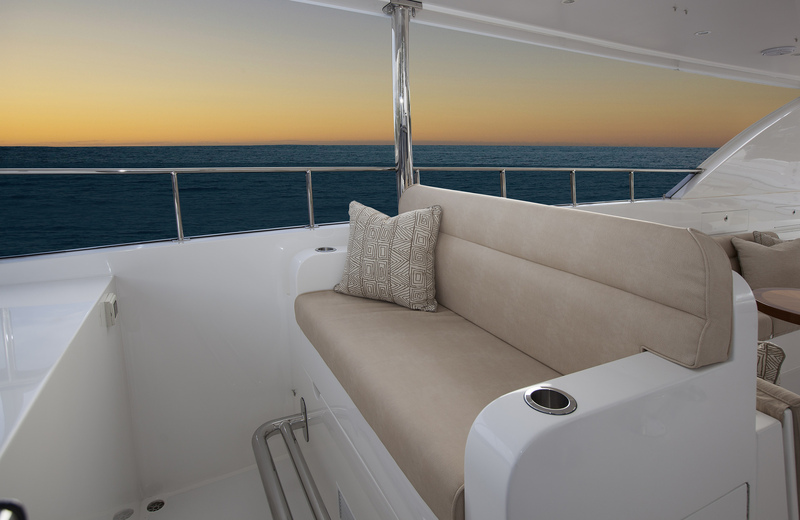 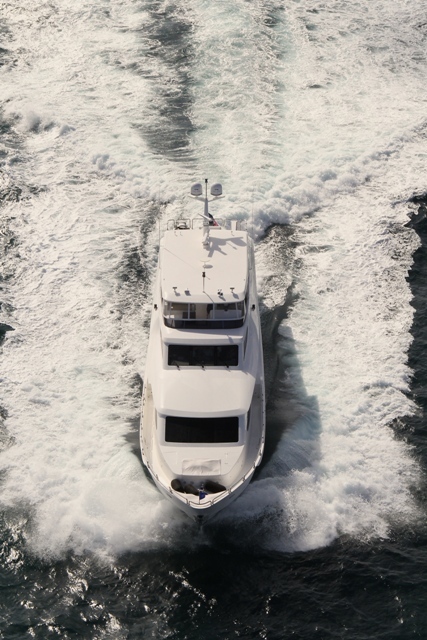 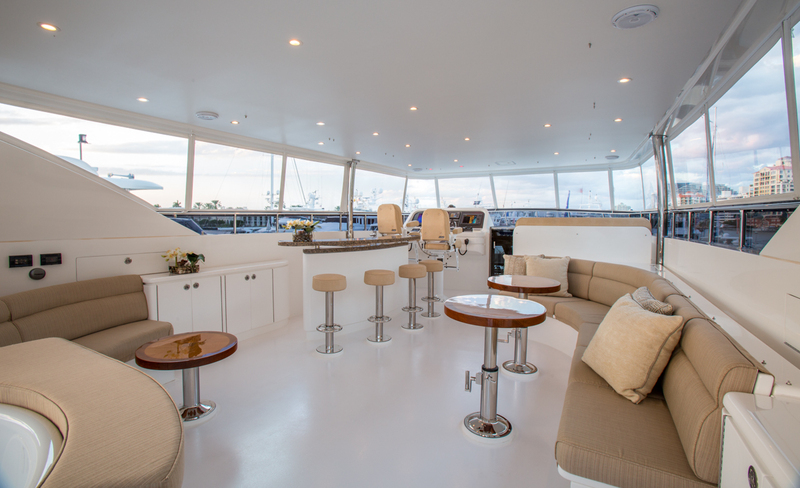 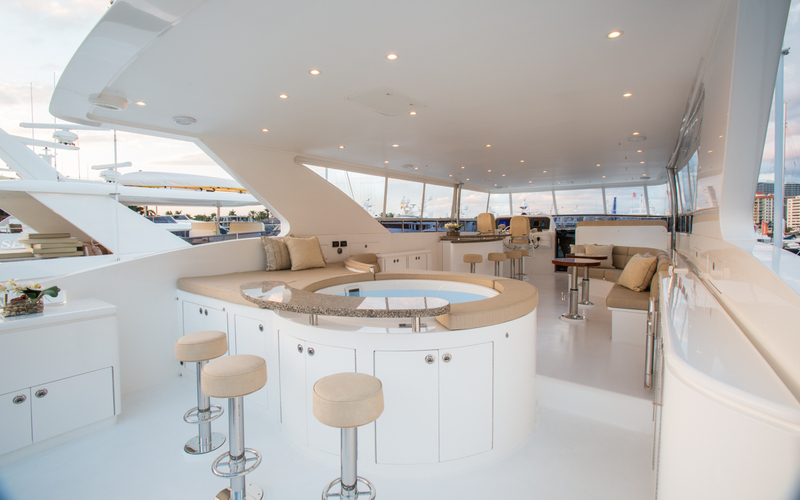 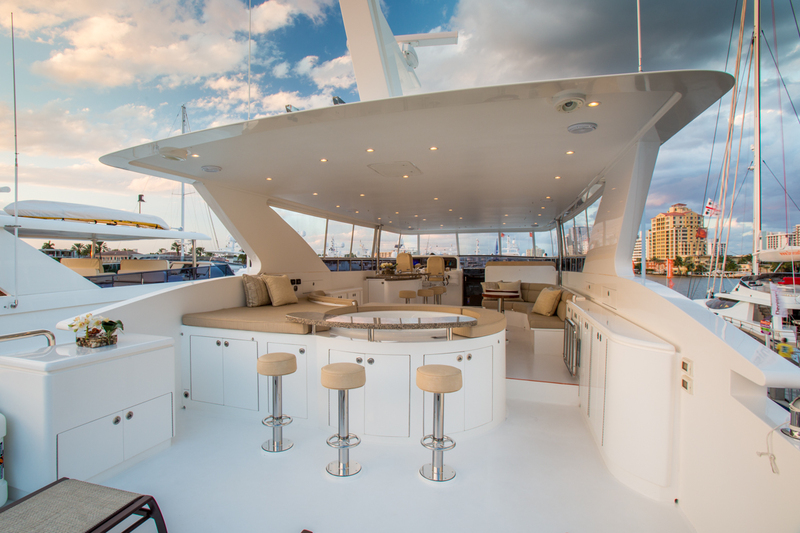 With 360° wraps around main decks, guests can walk forward safely while at anchor or under way, to make the most of the intimate forward seating area. 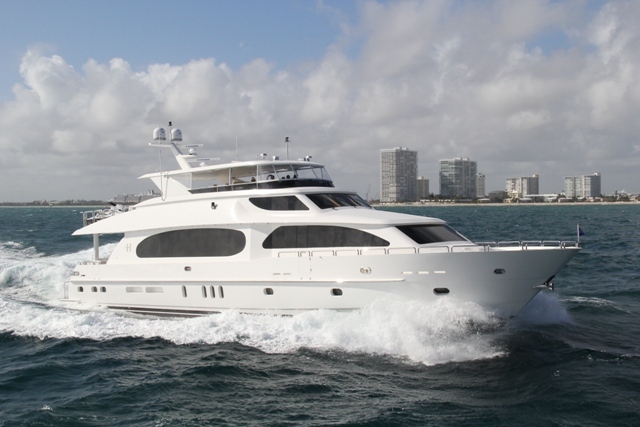 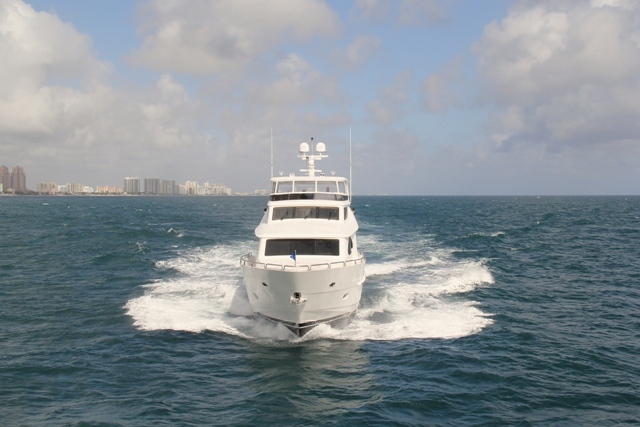 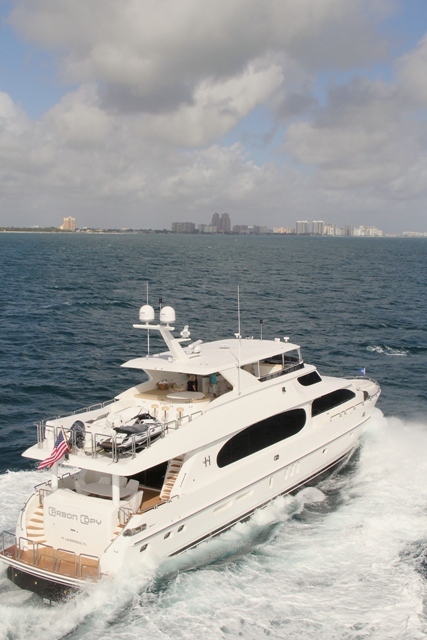 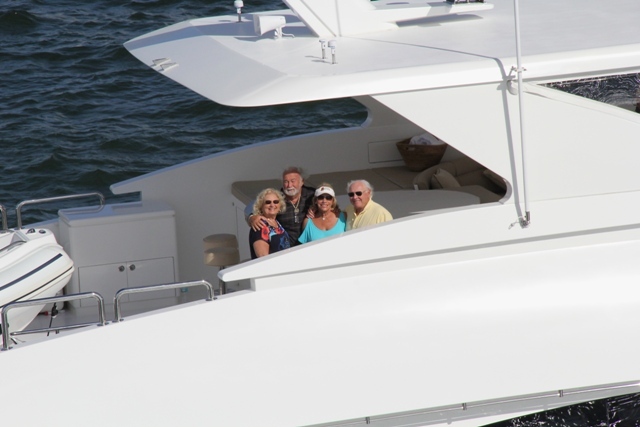 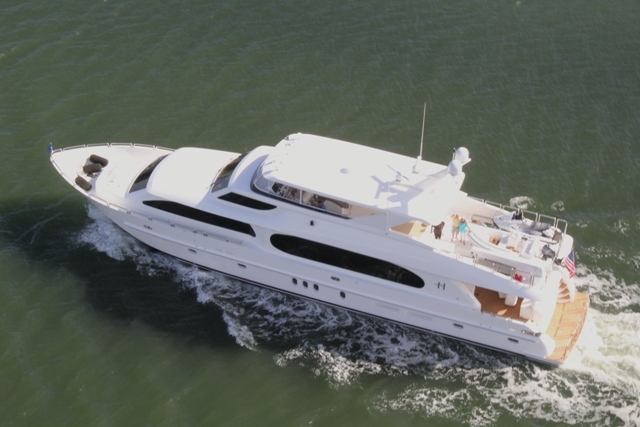 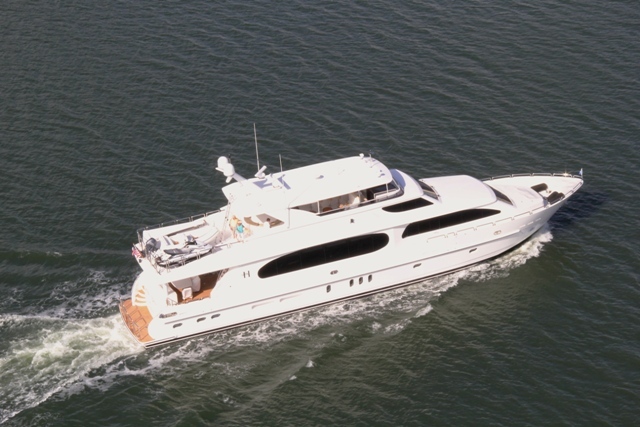 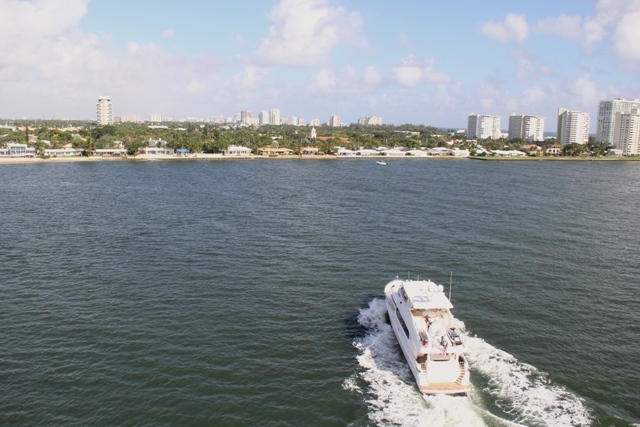 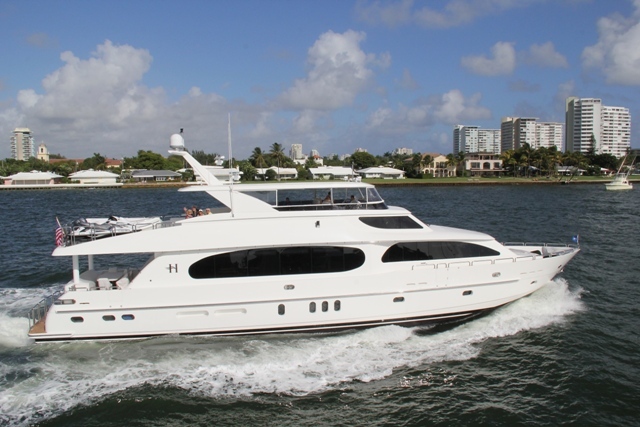 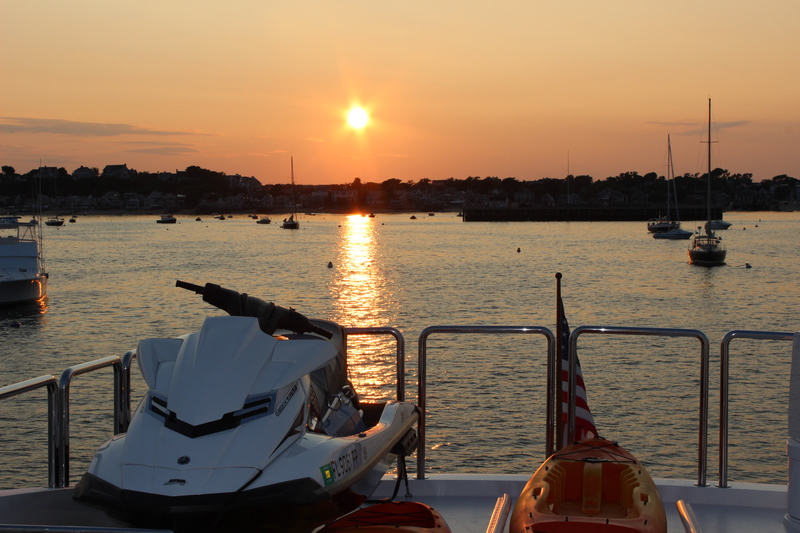 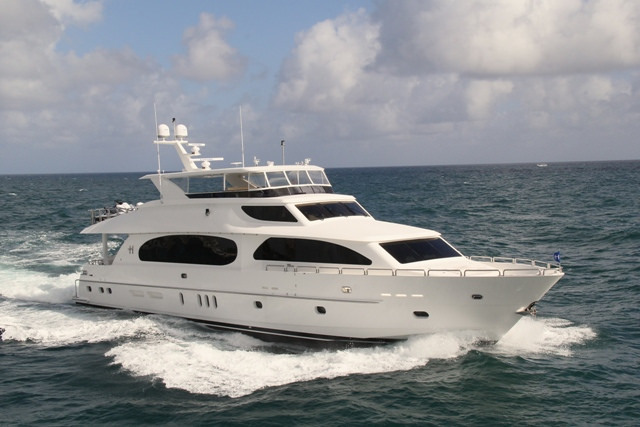 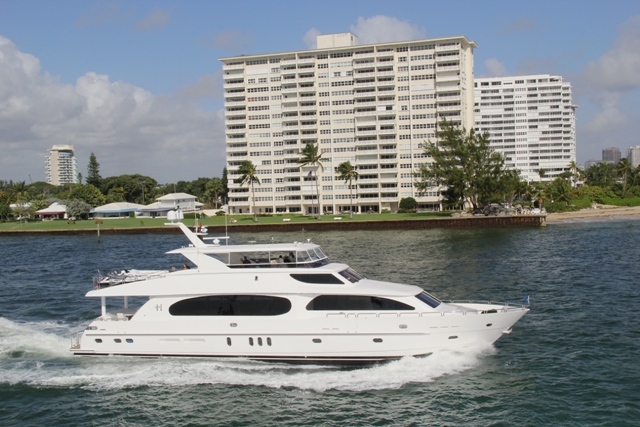 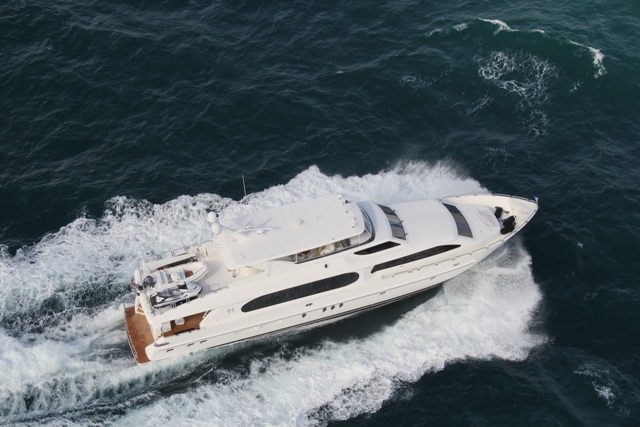 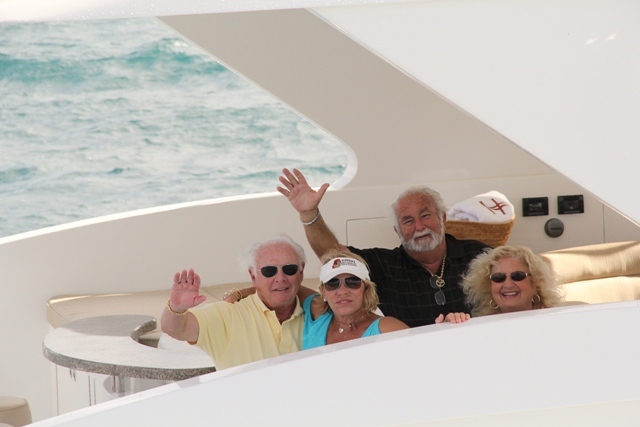 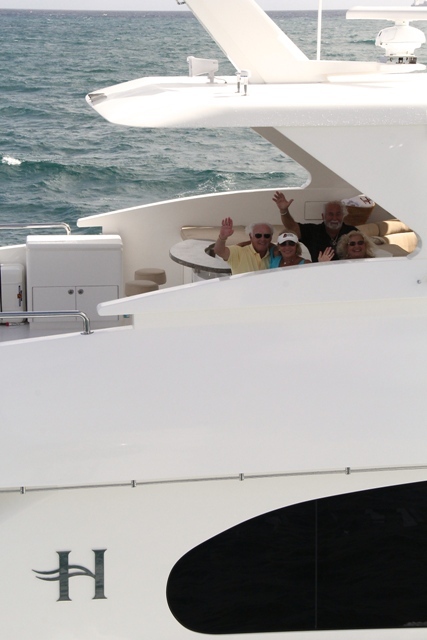 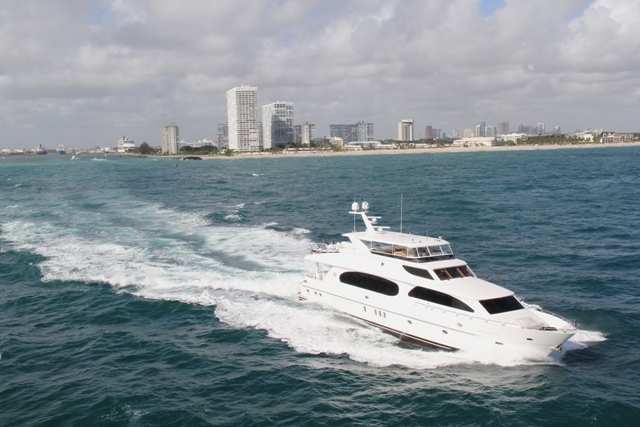 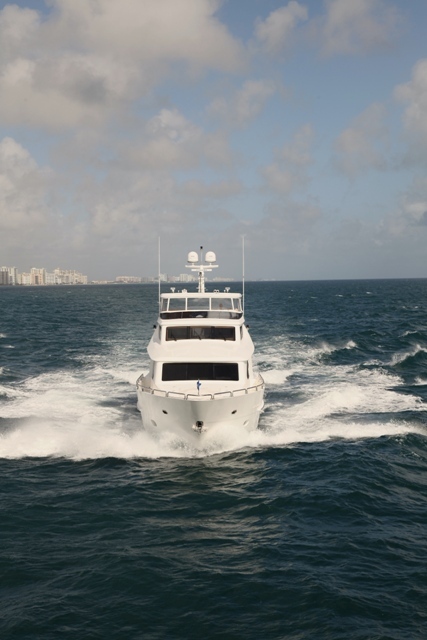 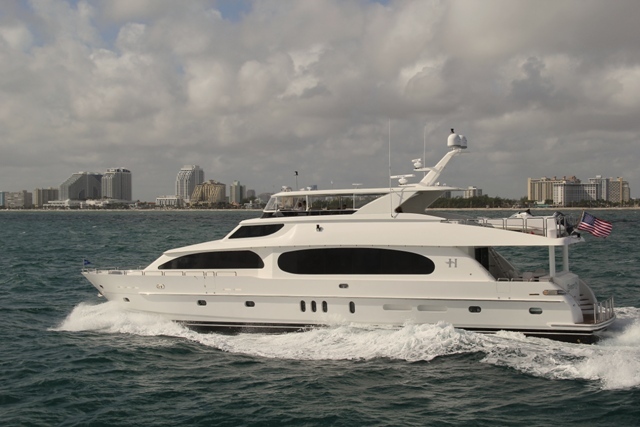 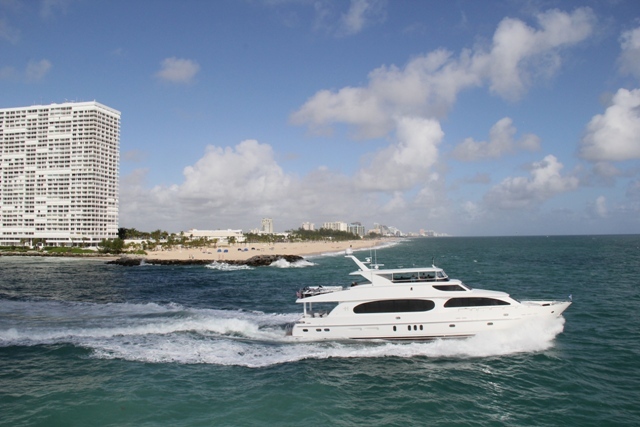 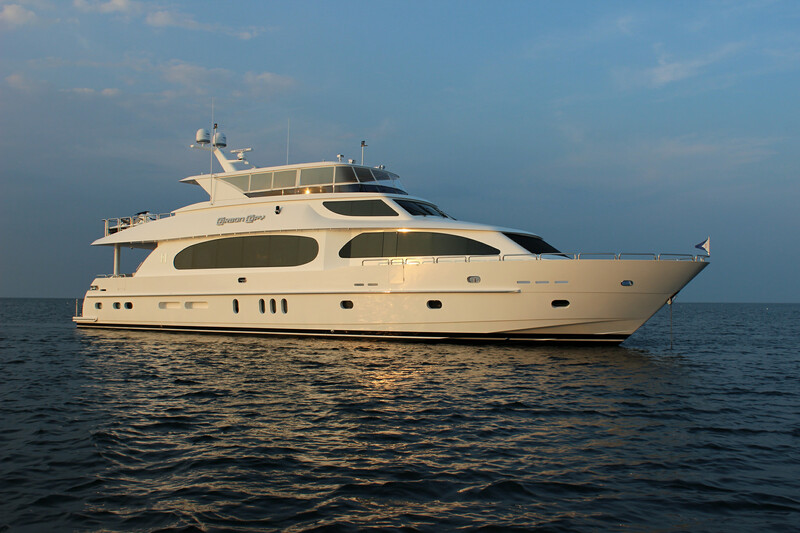 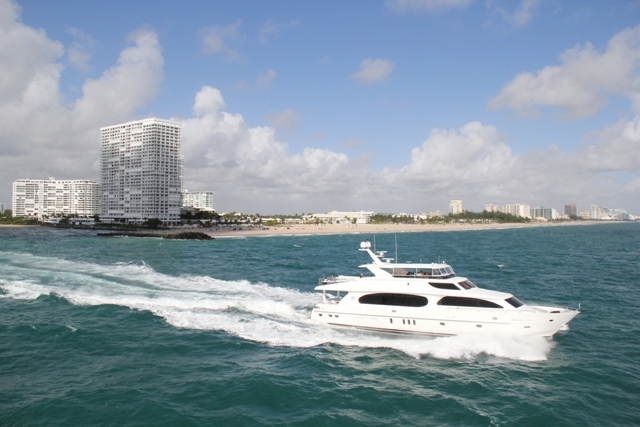 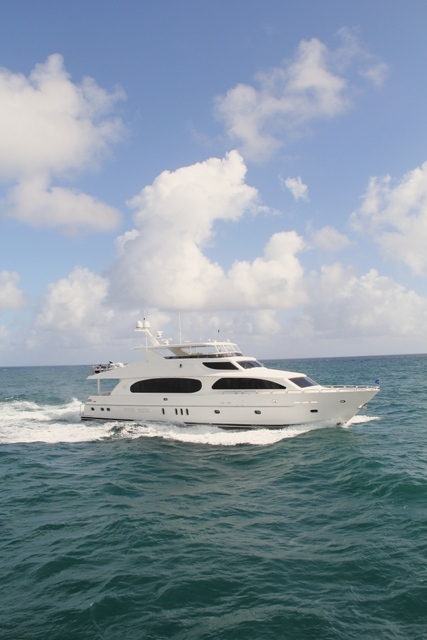 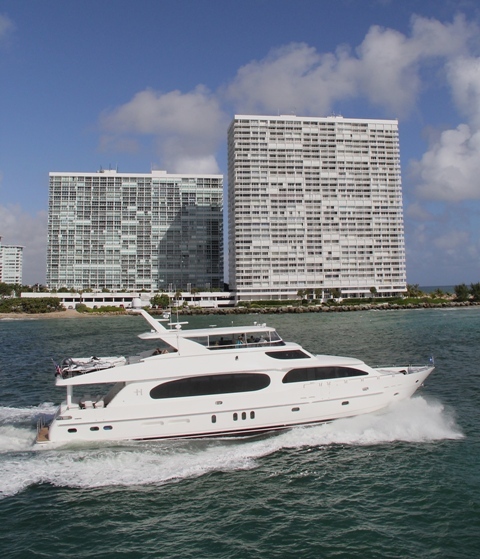 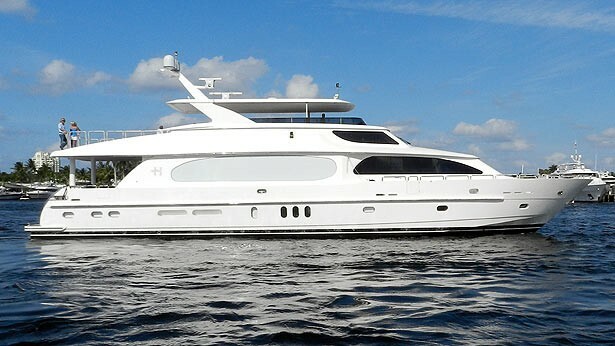 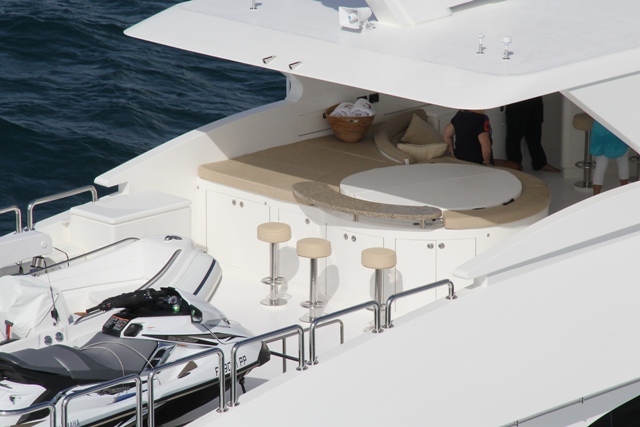 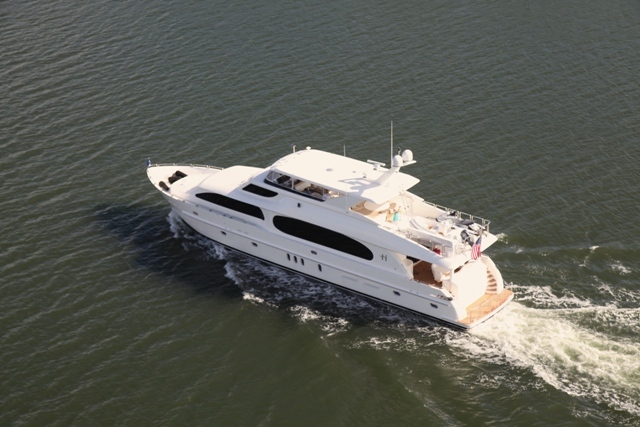 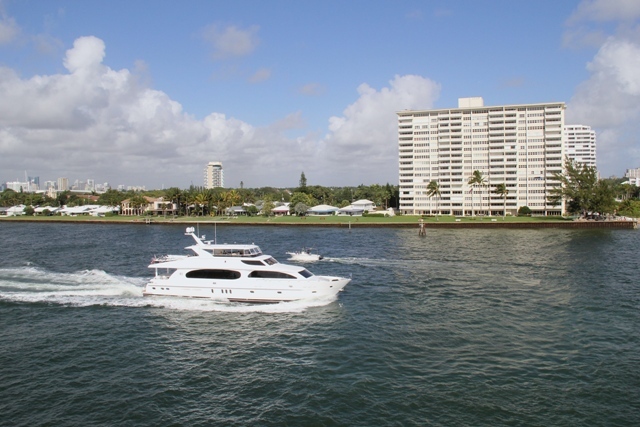 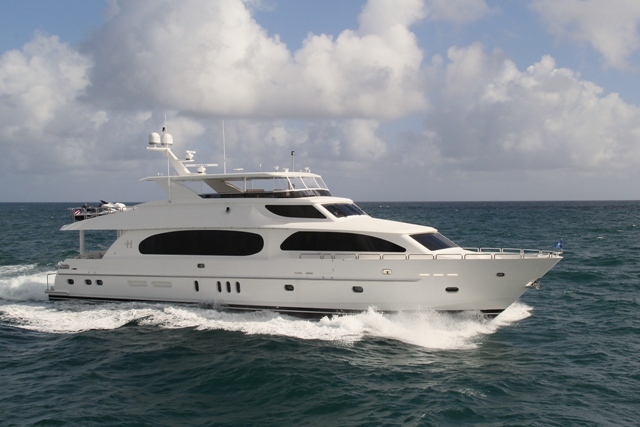 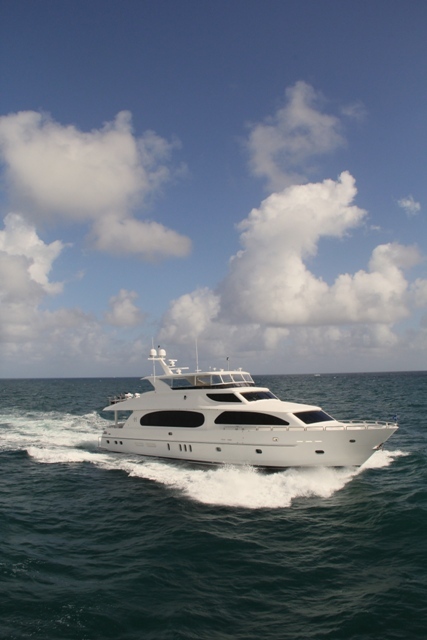 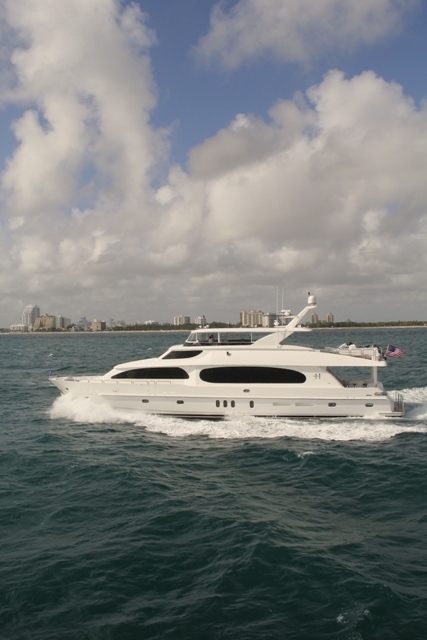 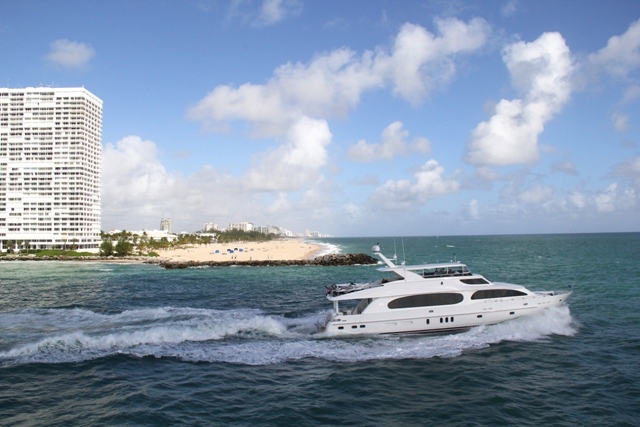 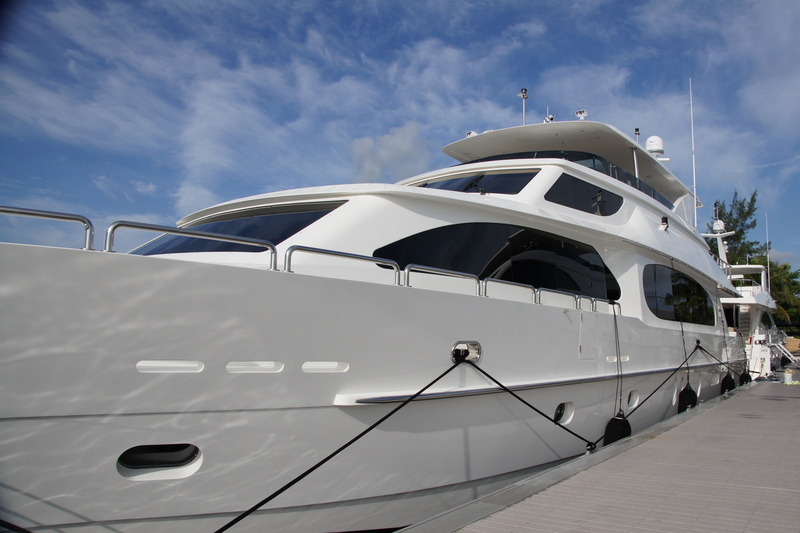 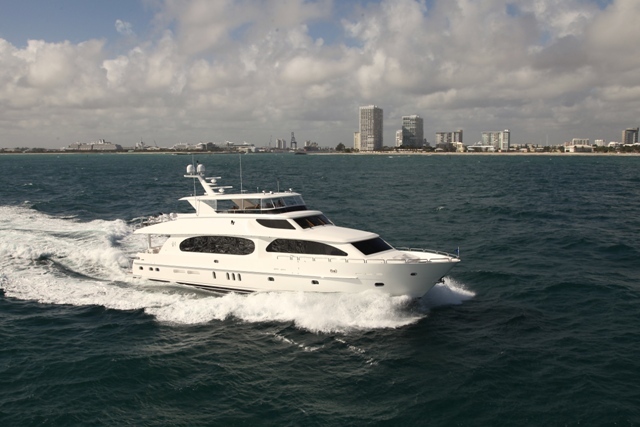 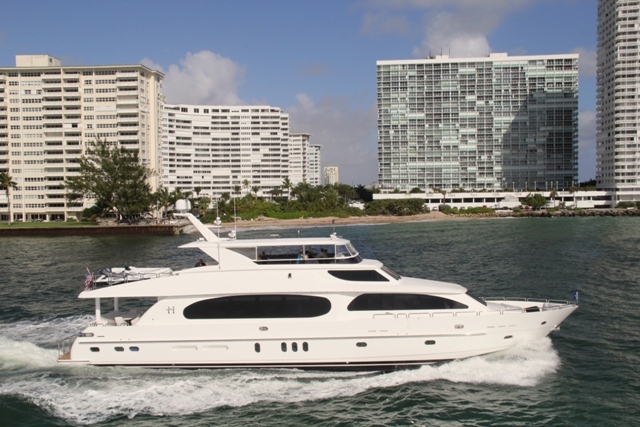 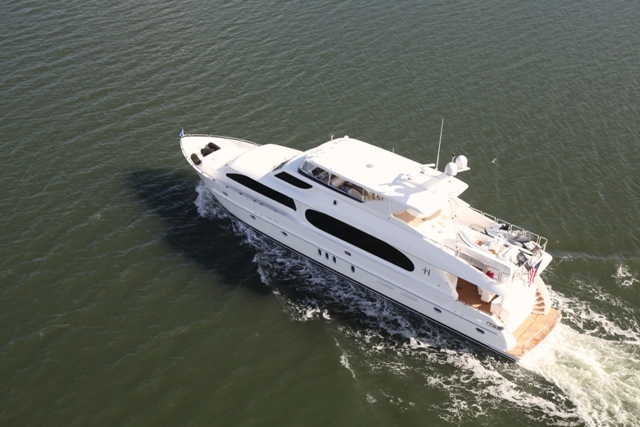 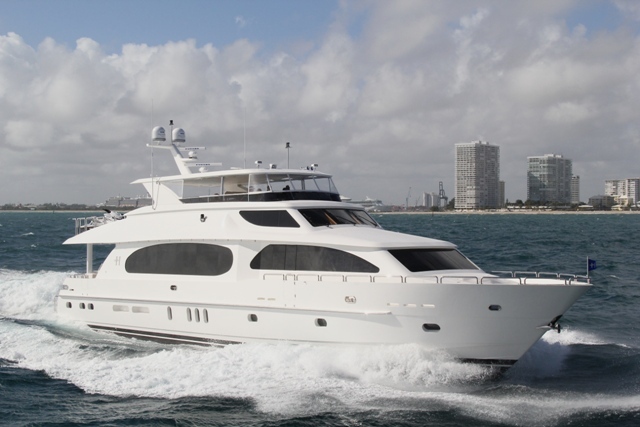 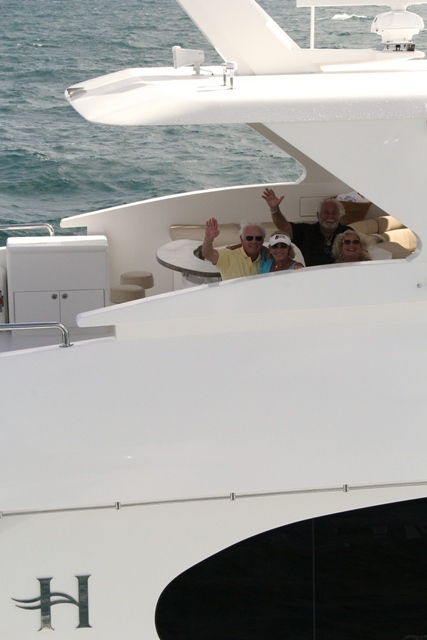 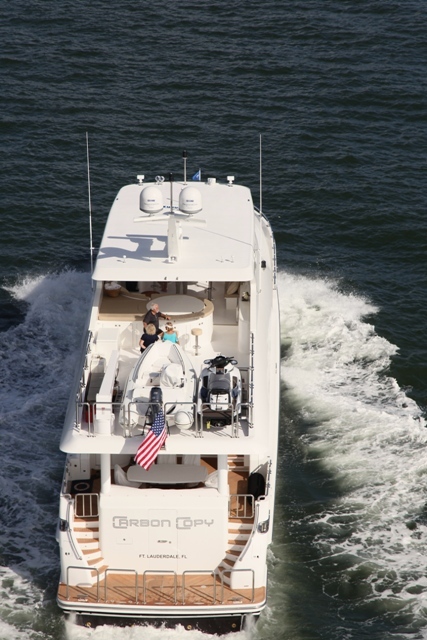 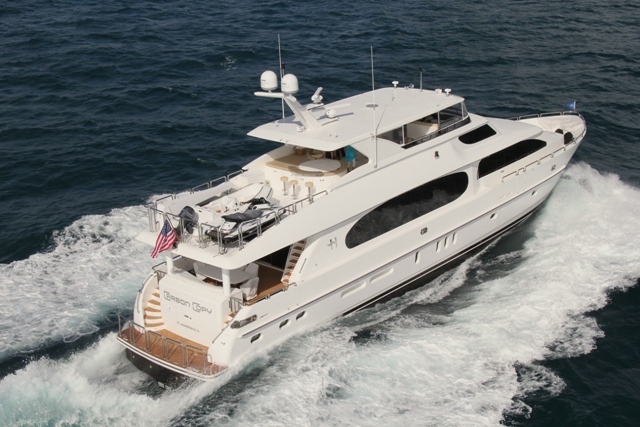 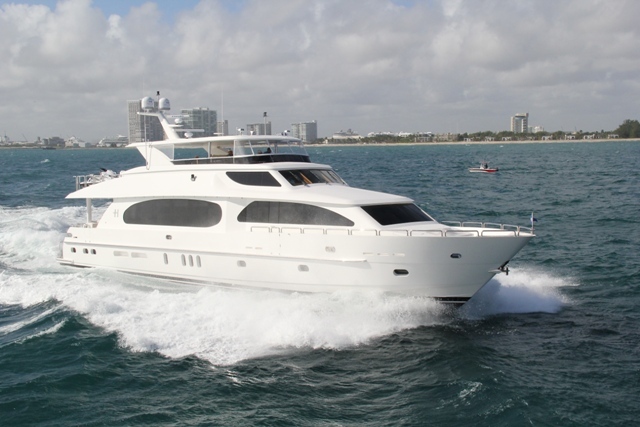 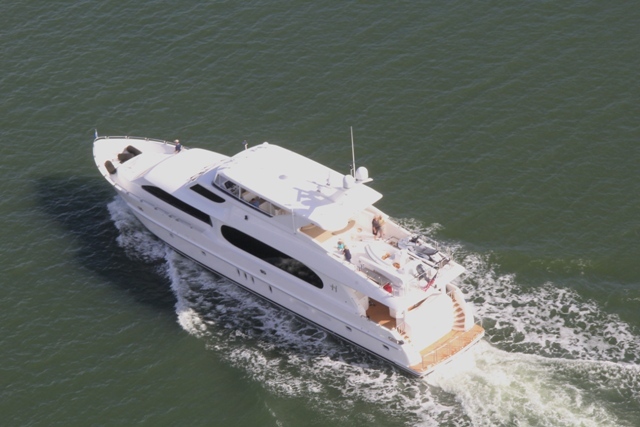 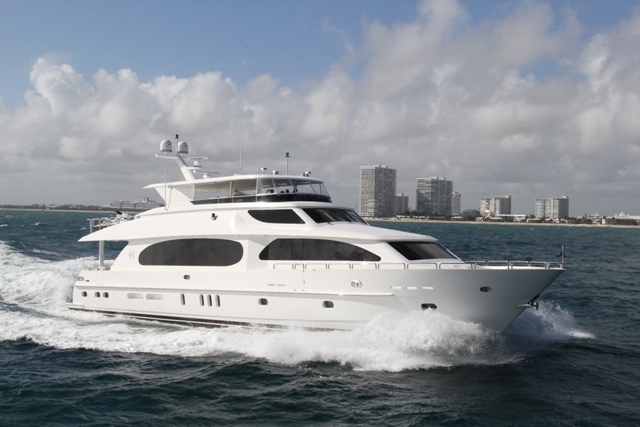 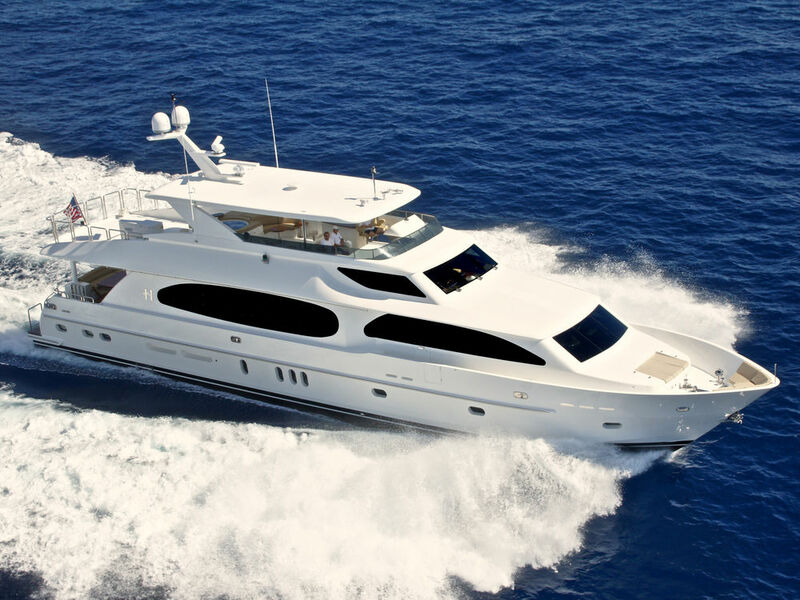 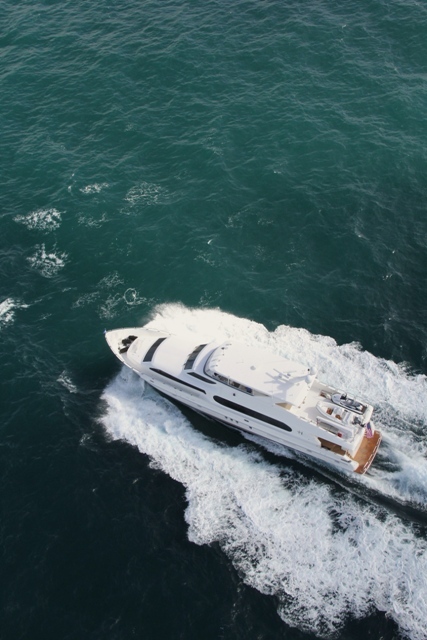 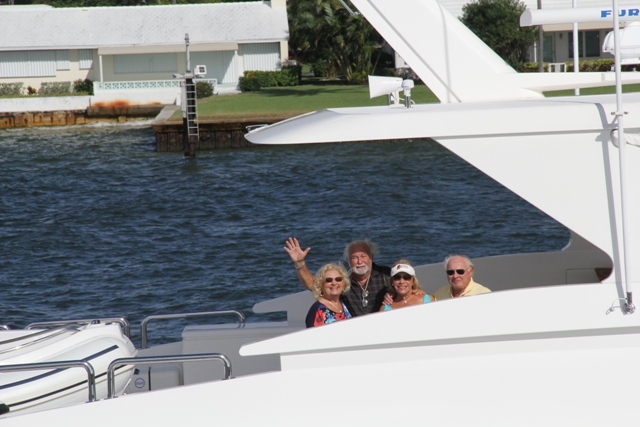 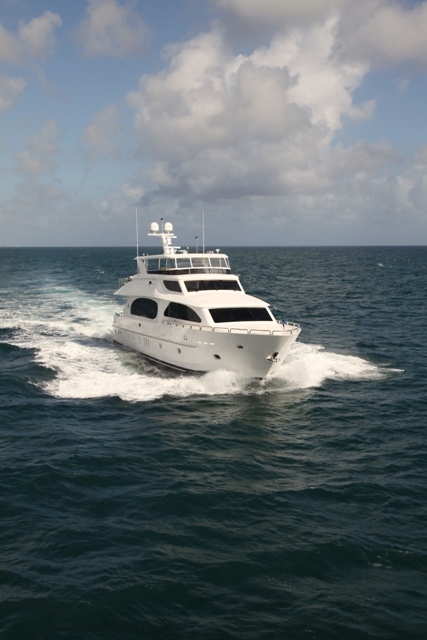 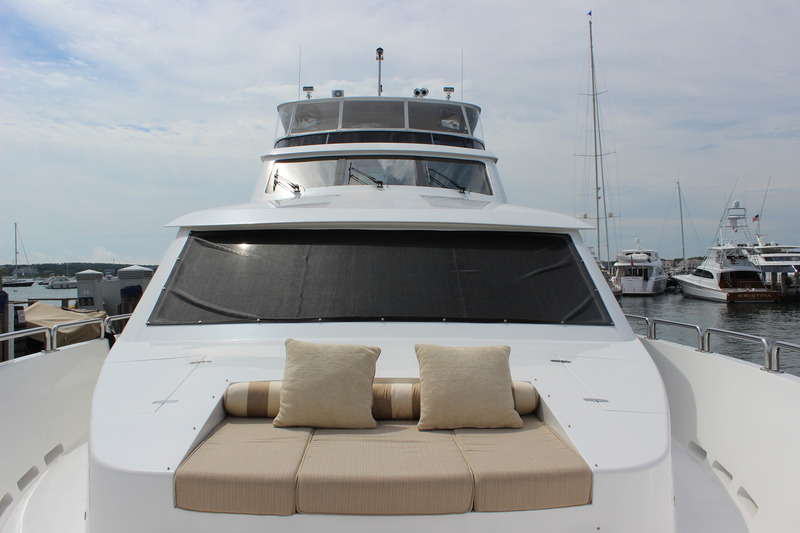 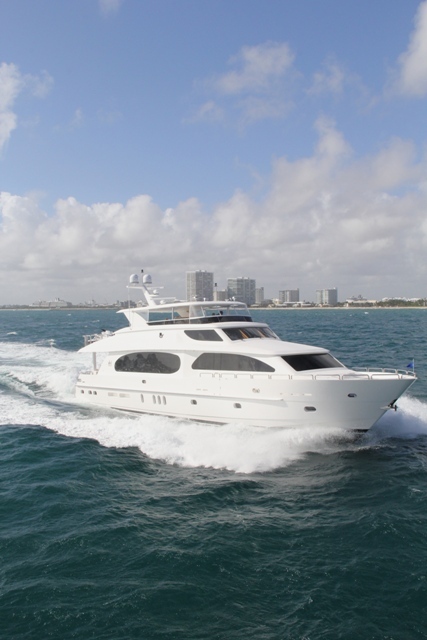 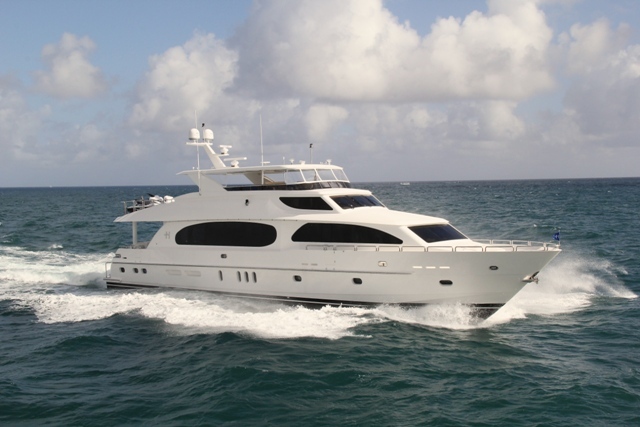 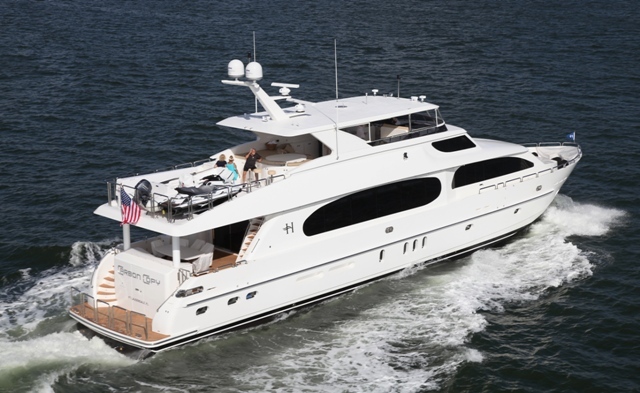 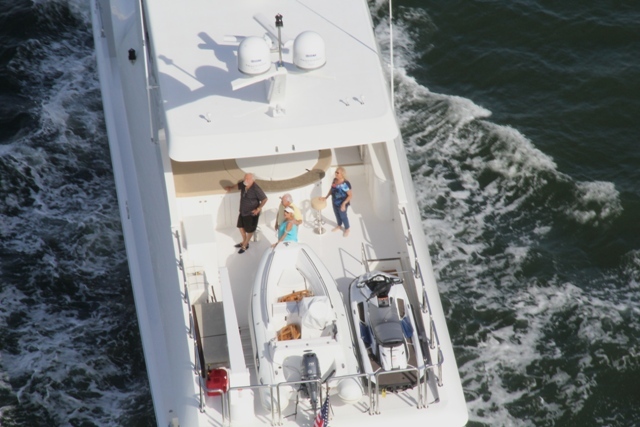 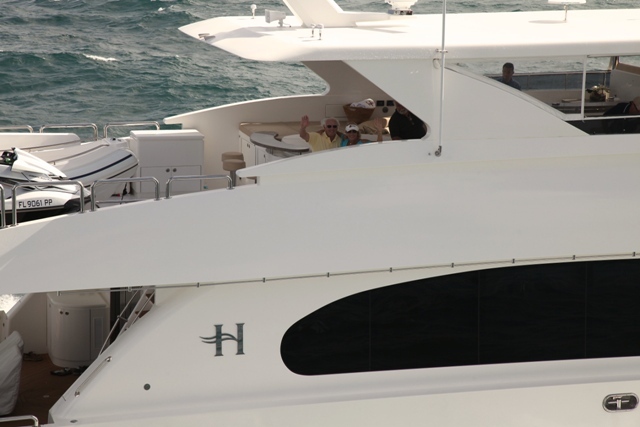 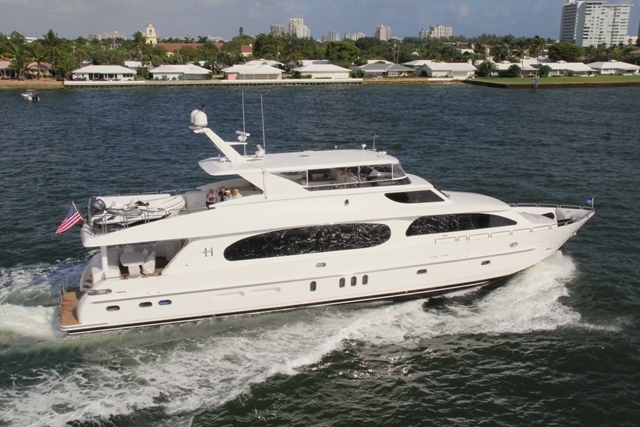 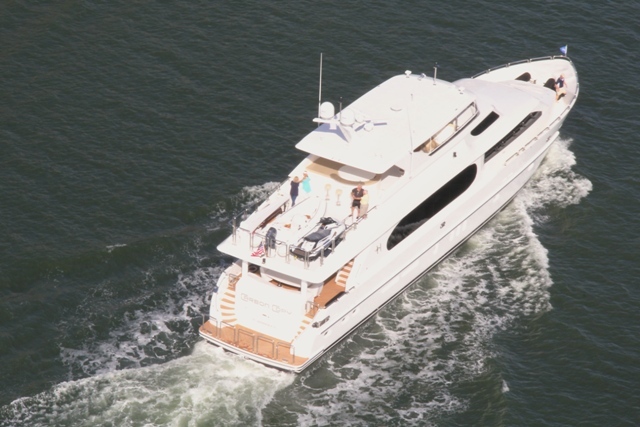 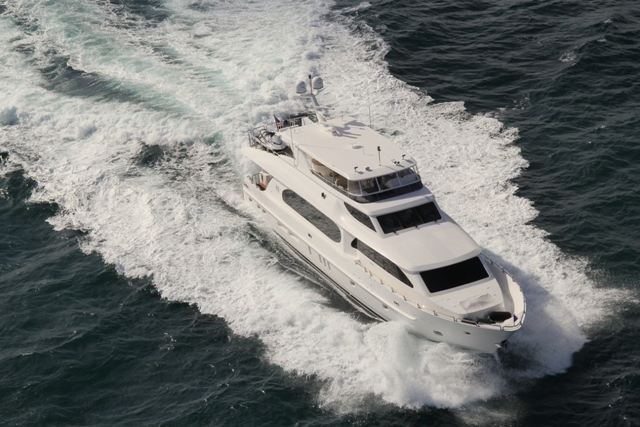 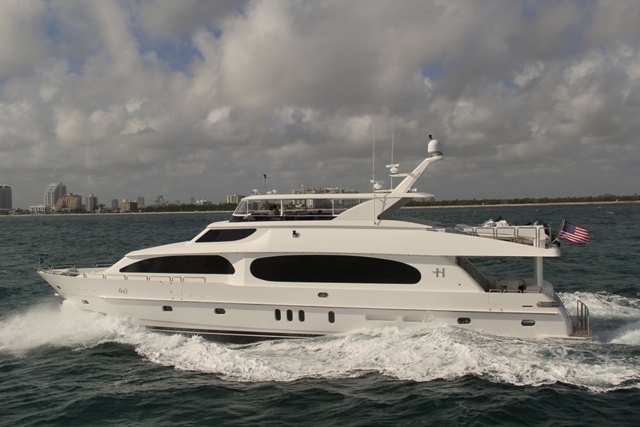 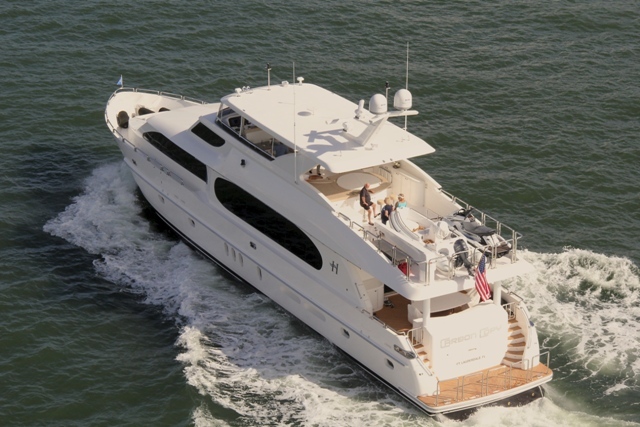 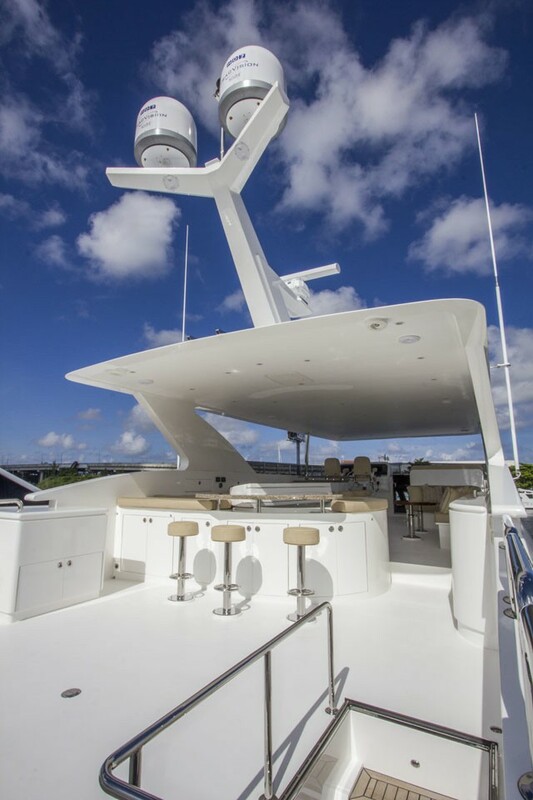 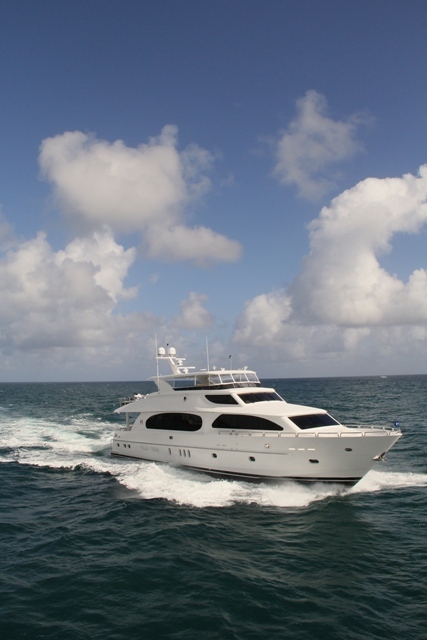 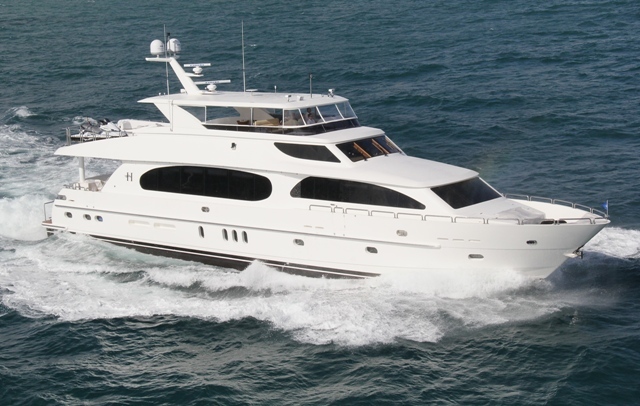 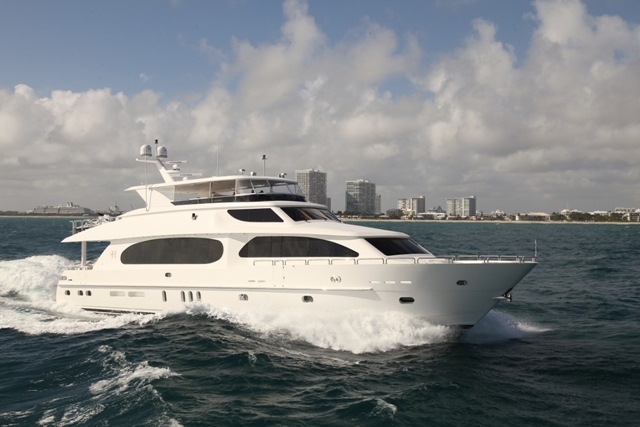 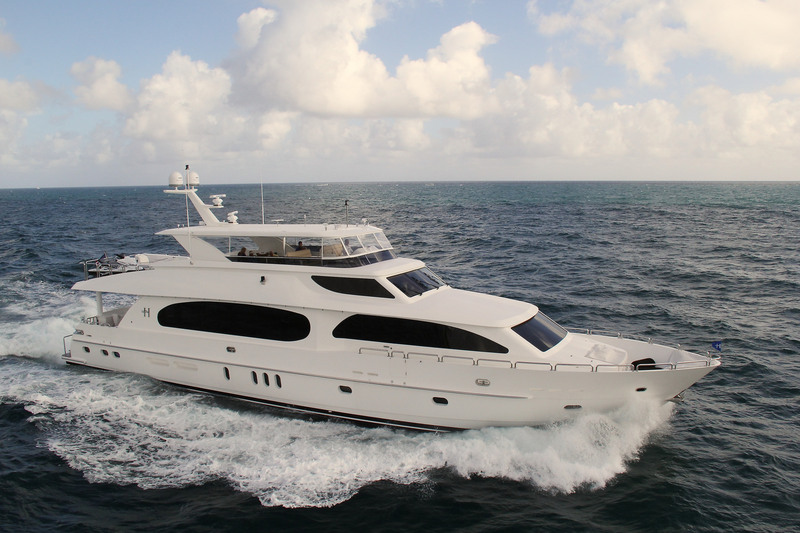 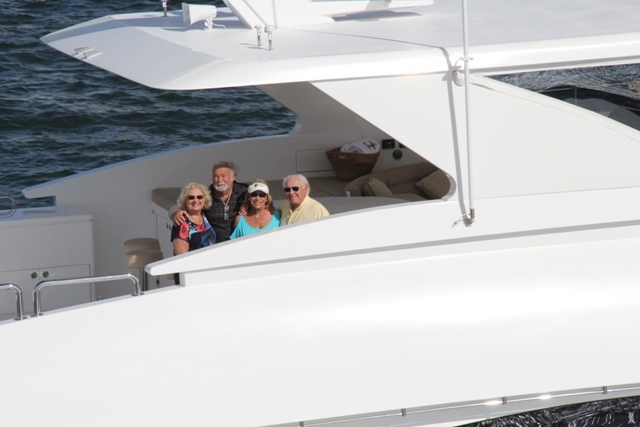 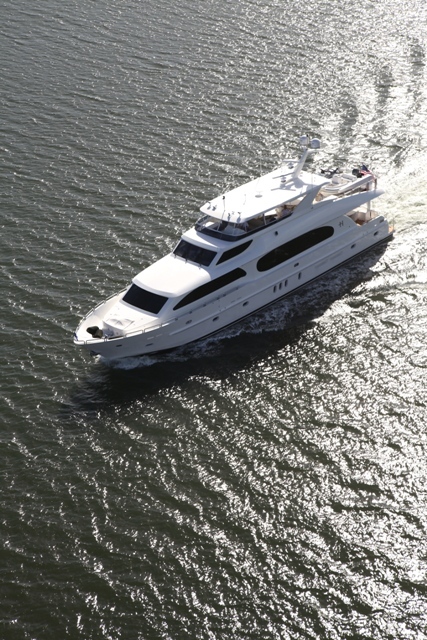 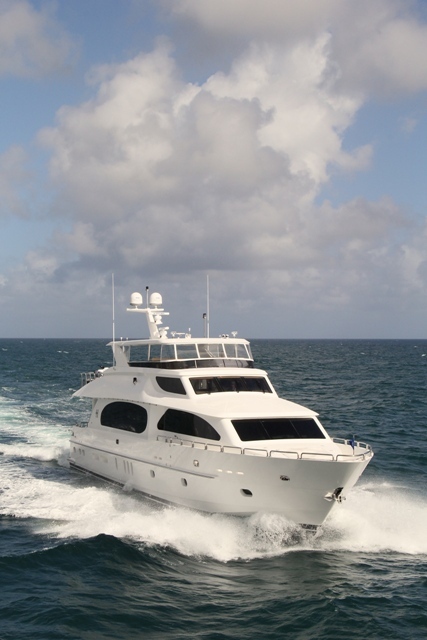 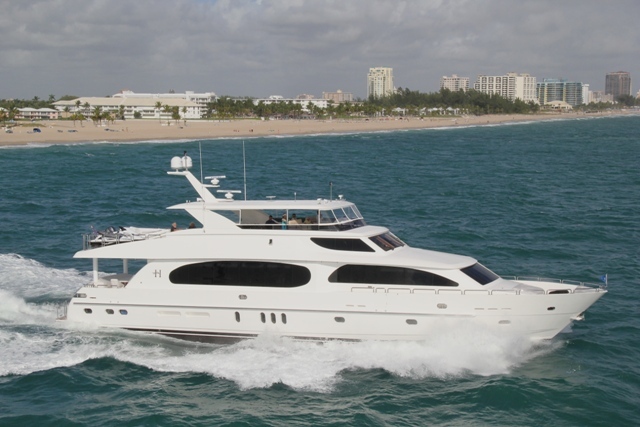 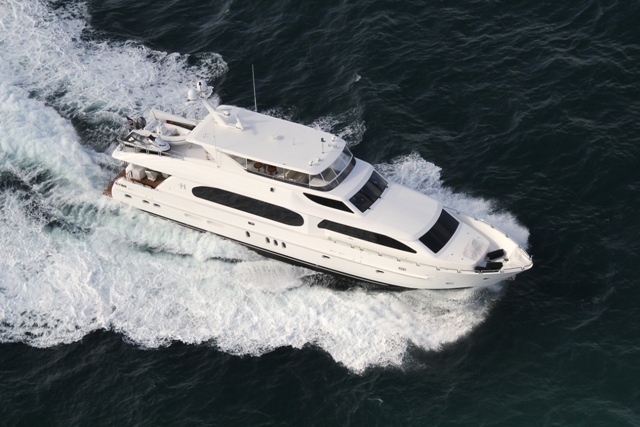 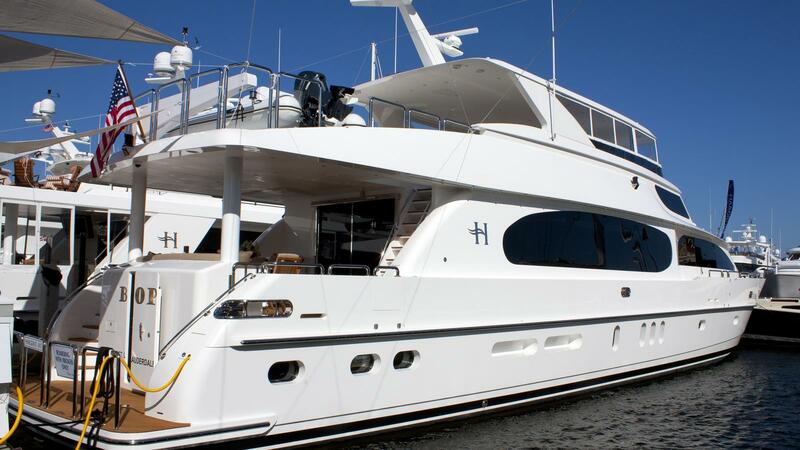 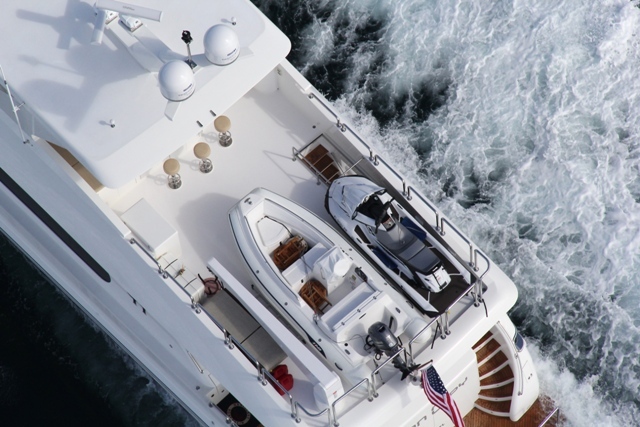 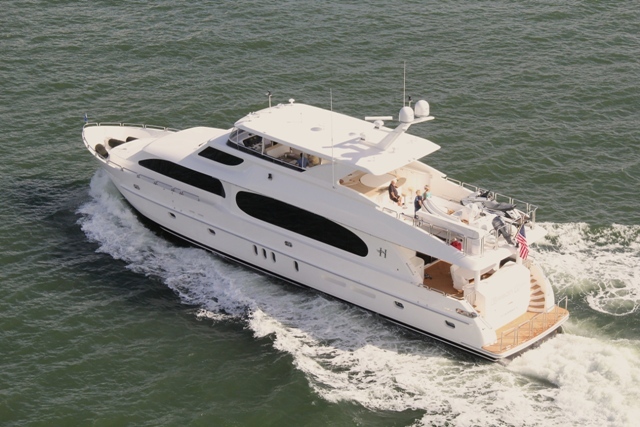 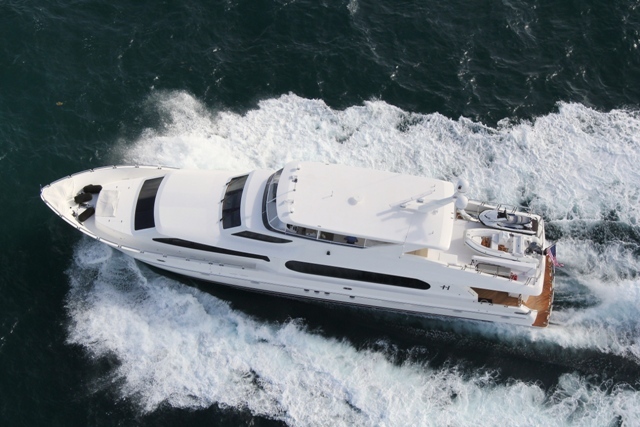 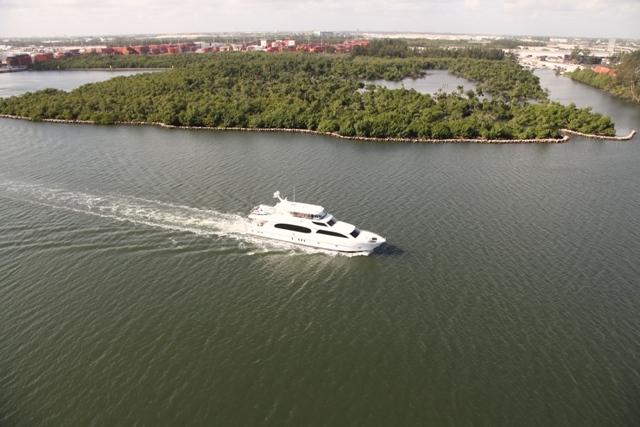 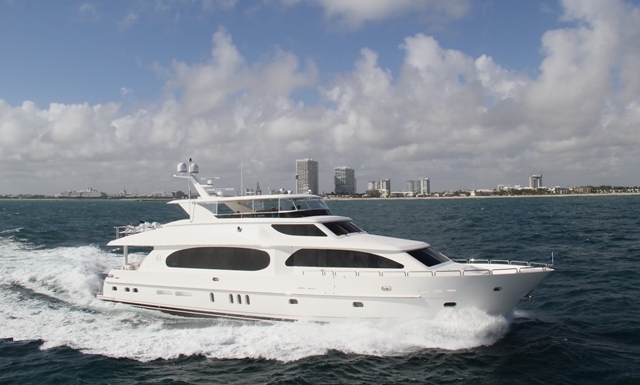 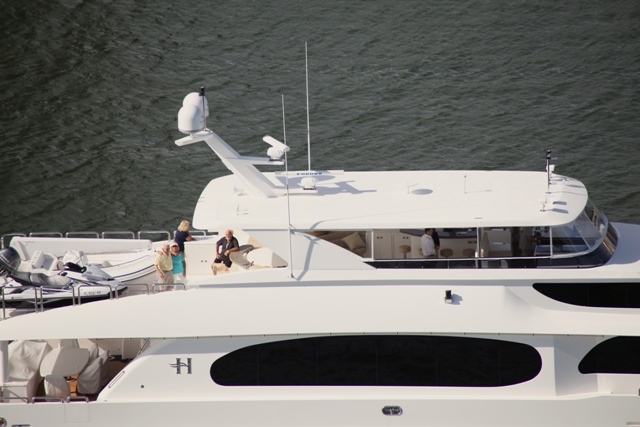 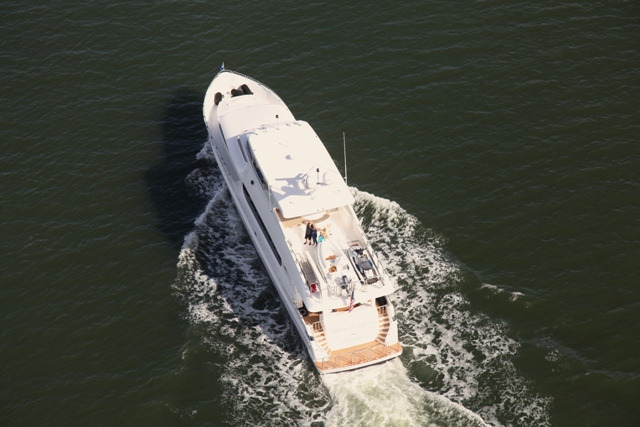 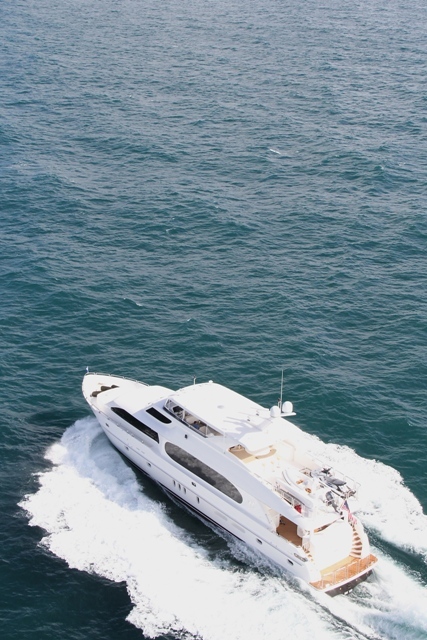 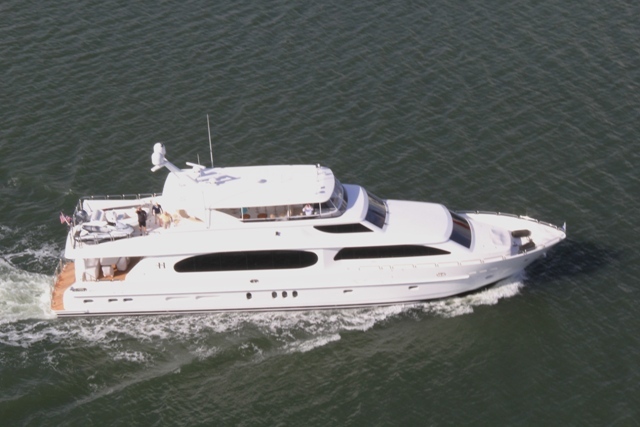 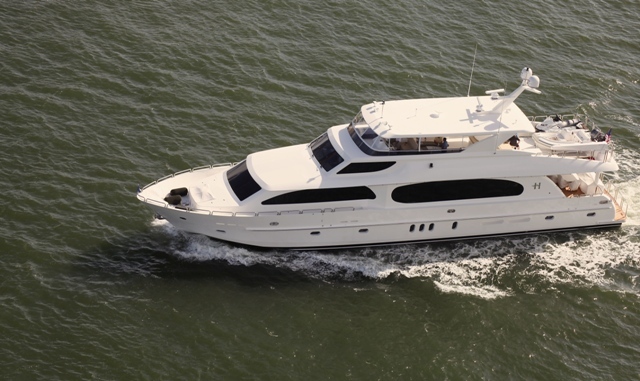 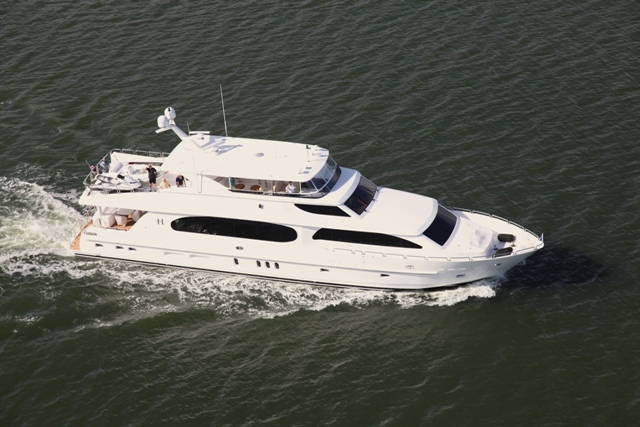 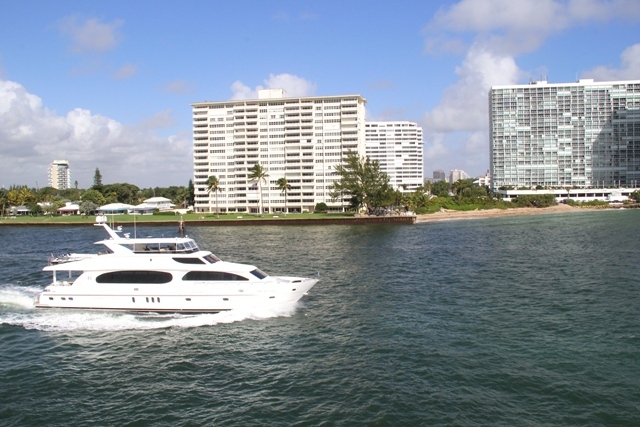 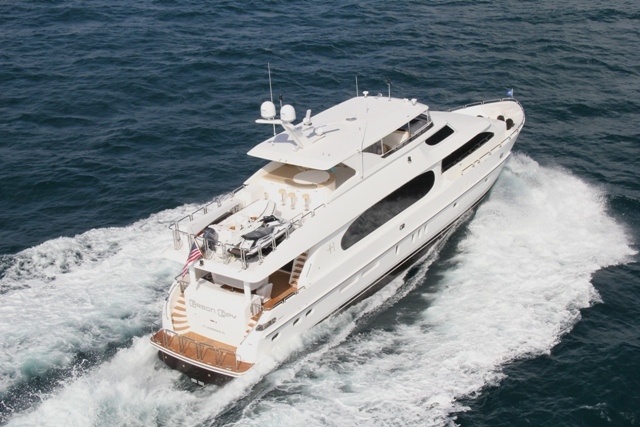 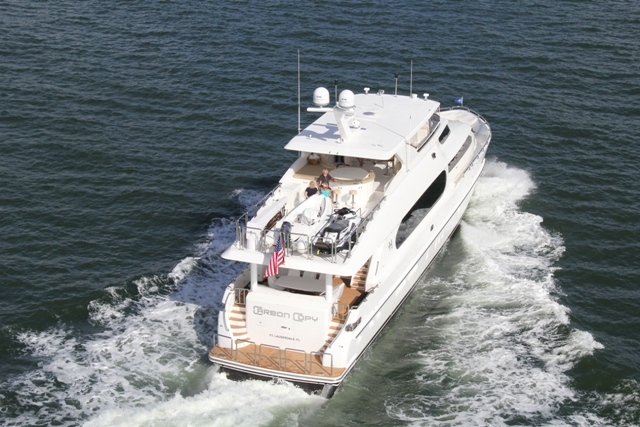 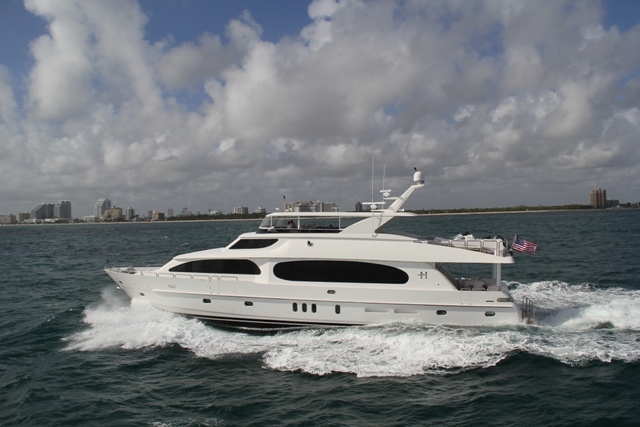 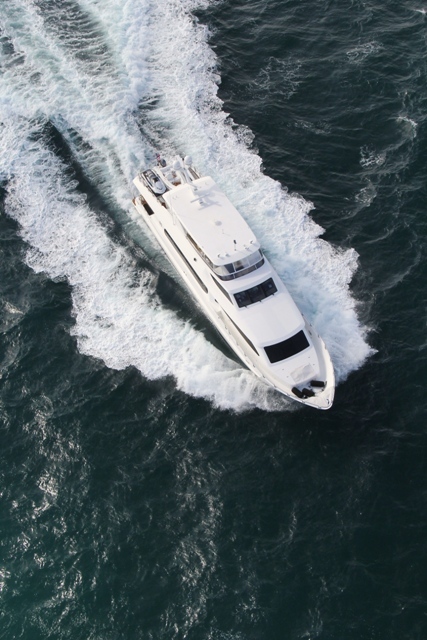 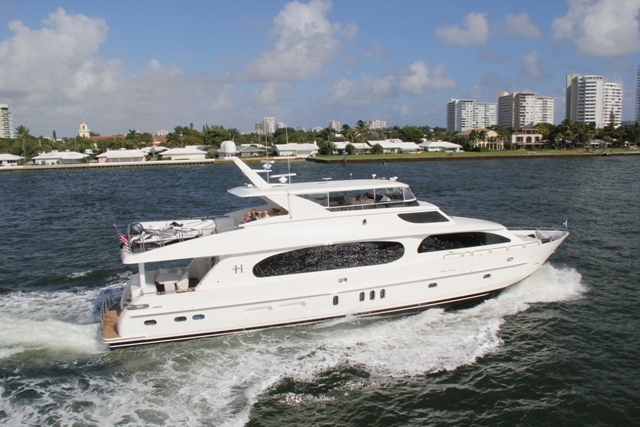 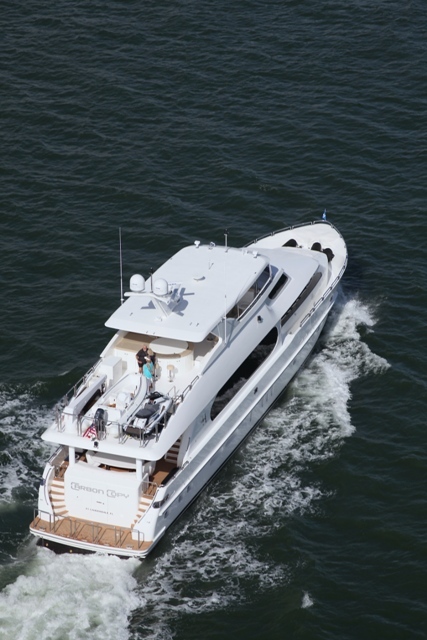 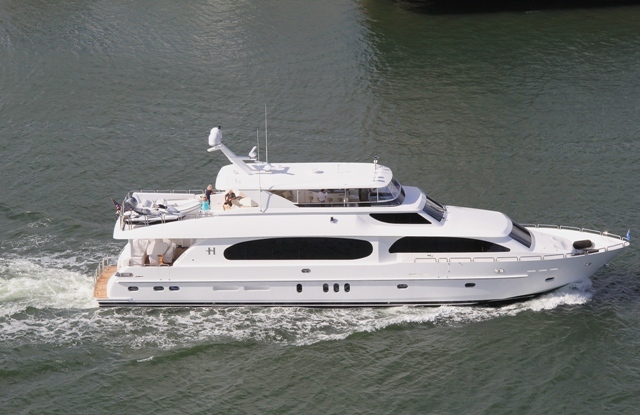 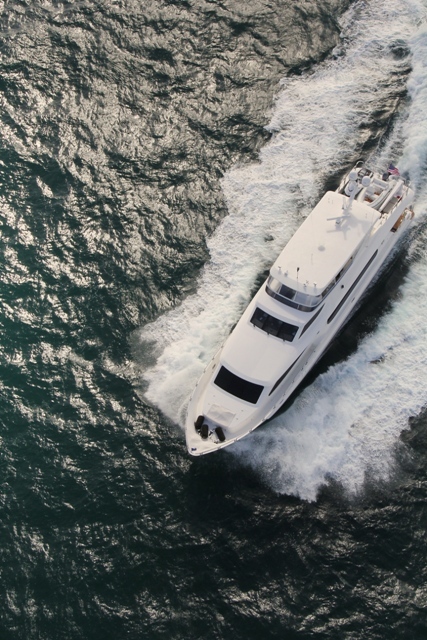 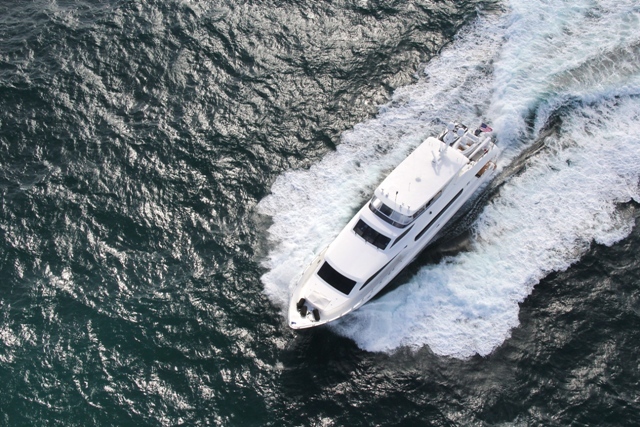 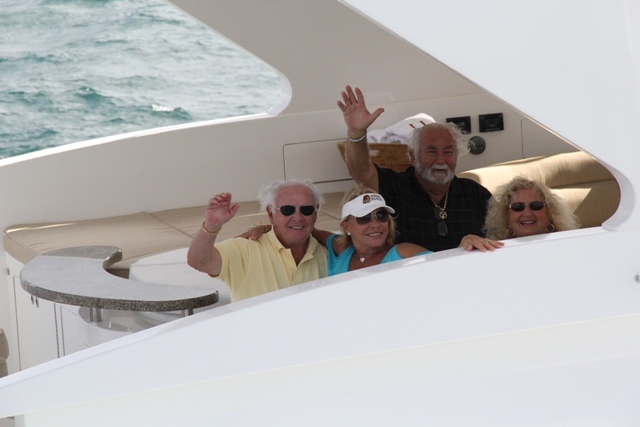 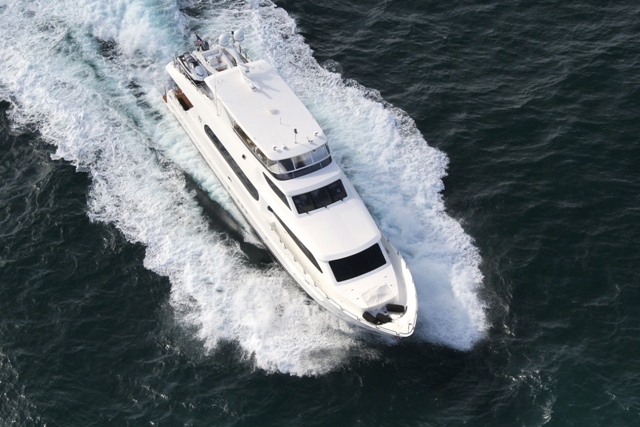 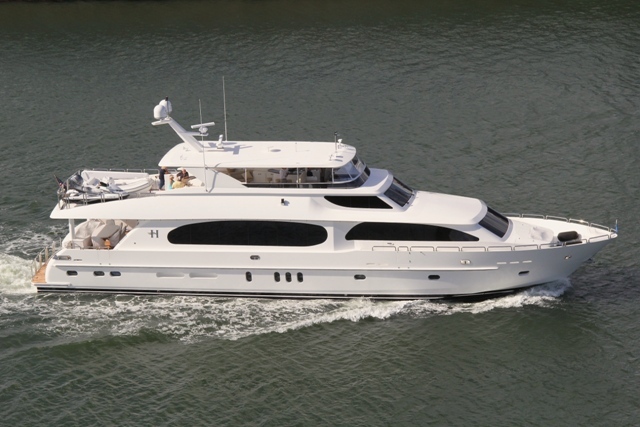 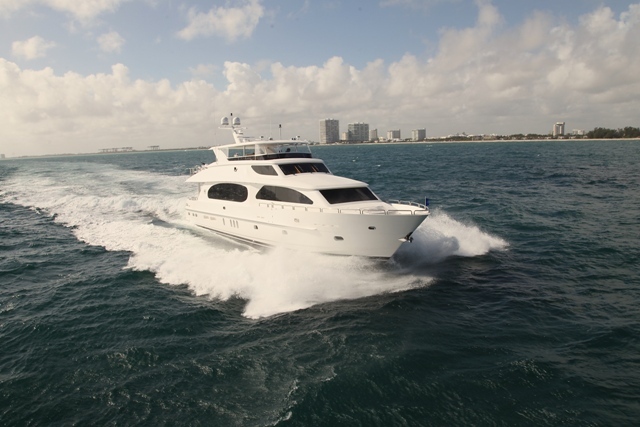 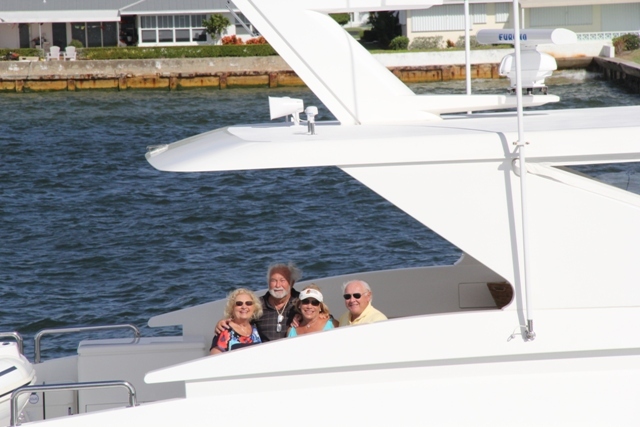 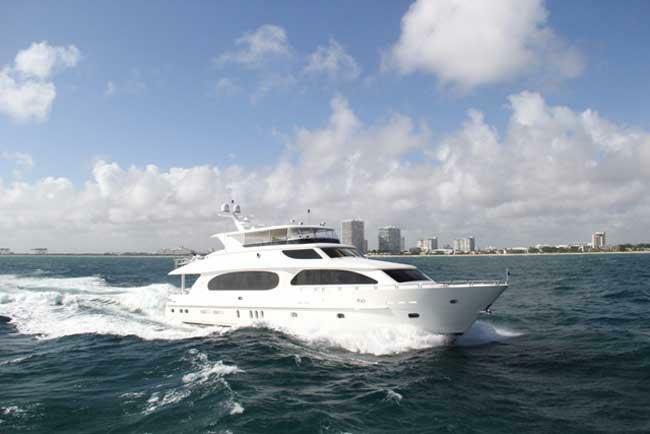 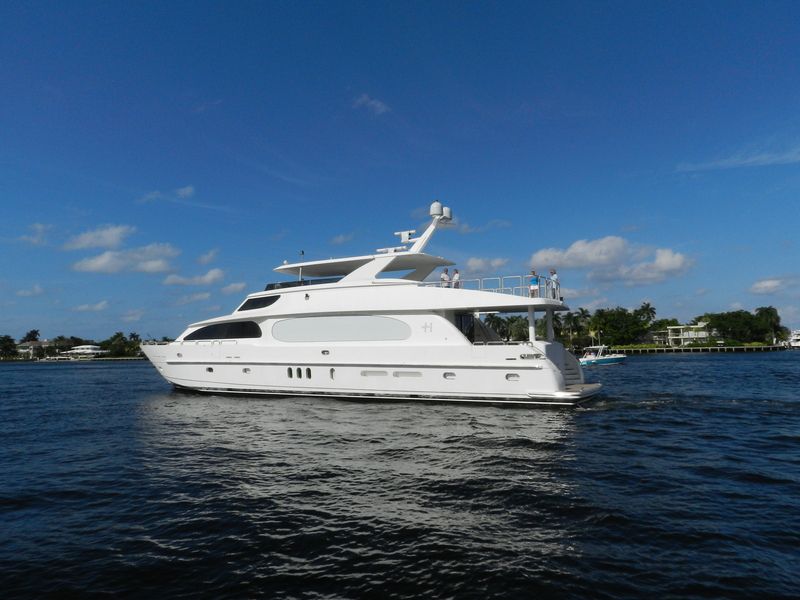 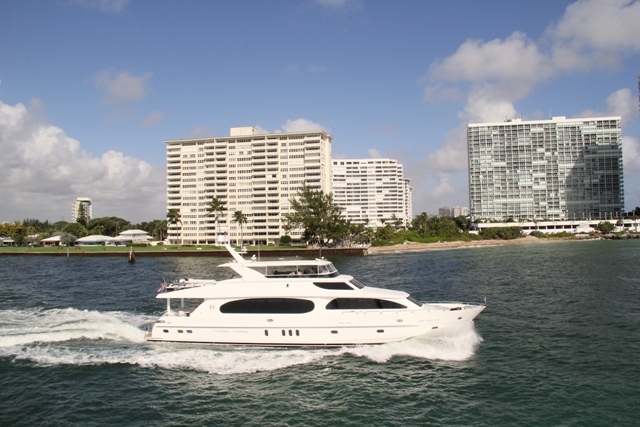 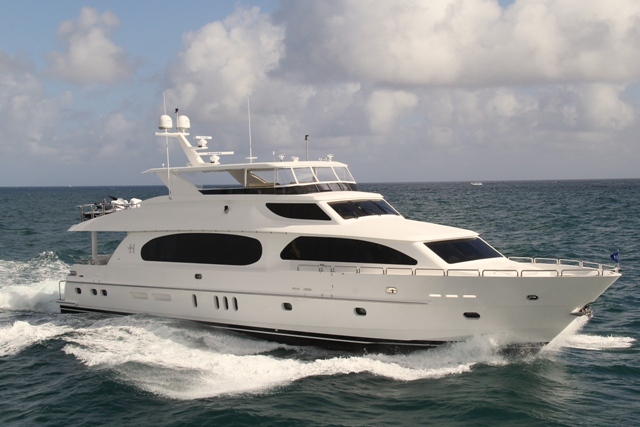 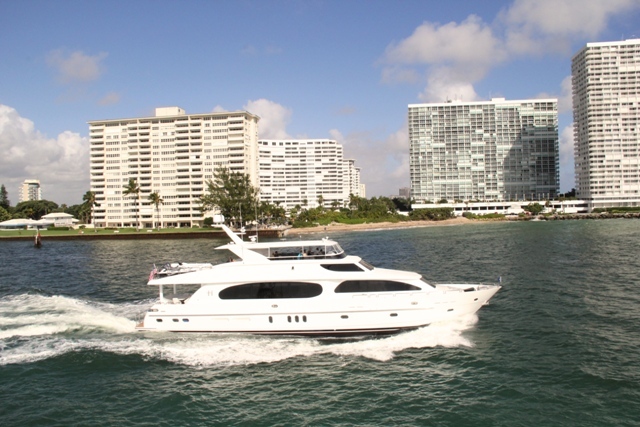 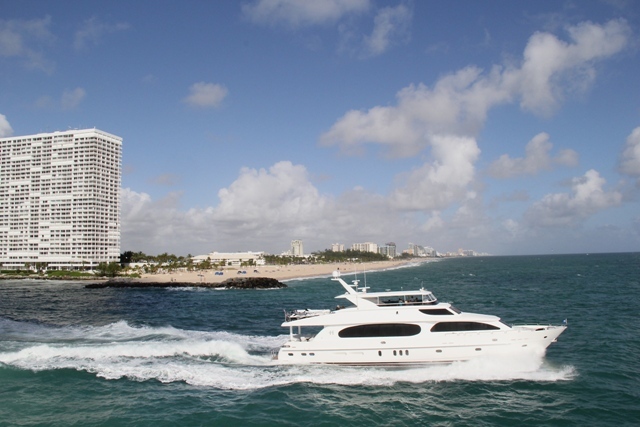 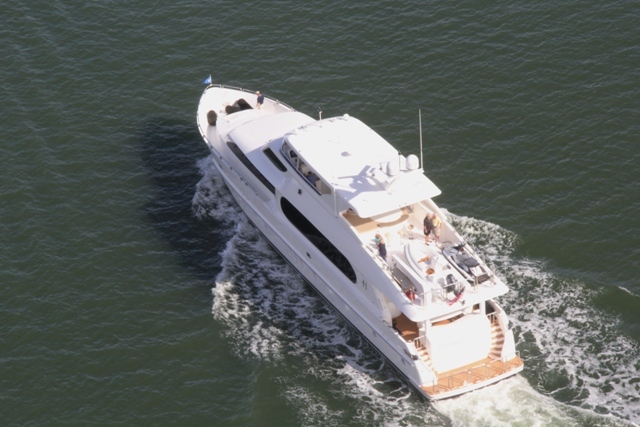 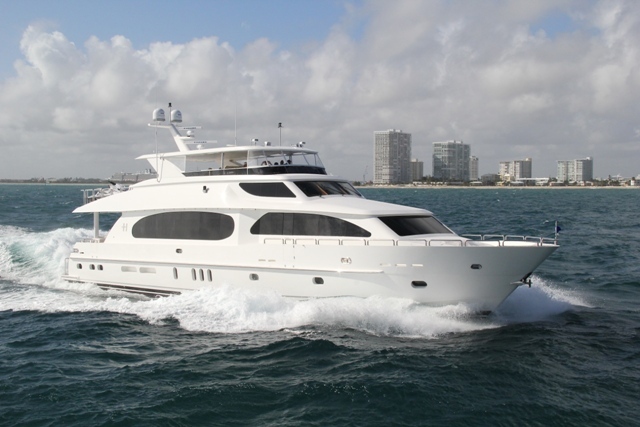 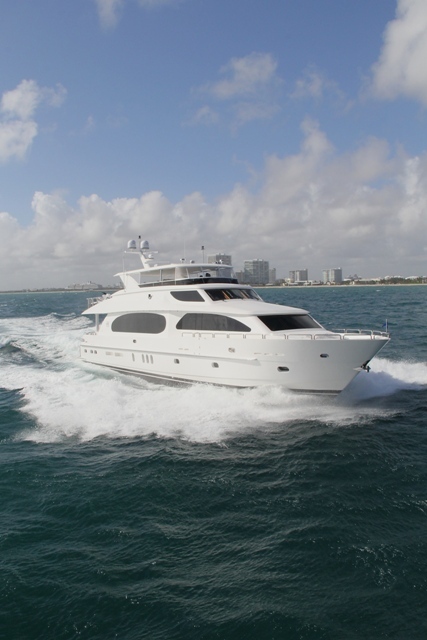 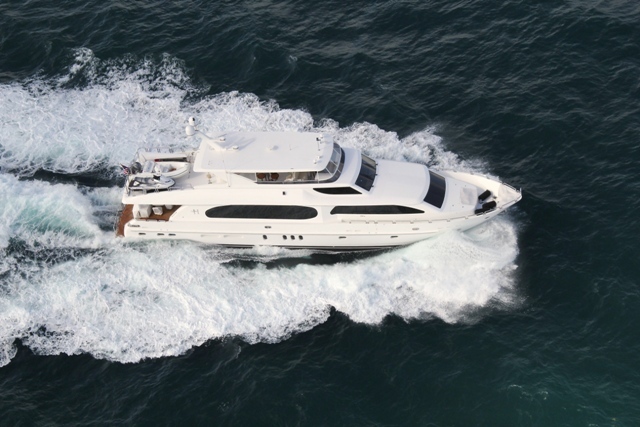 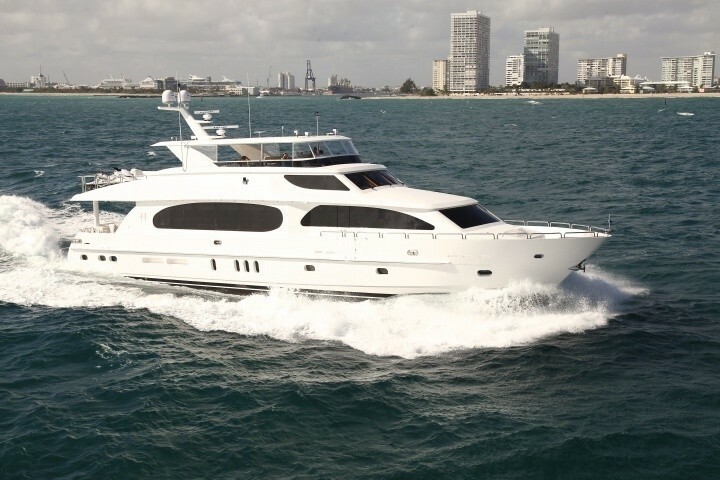 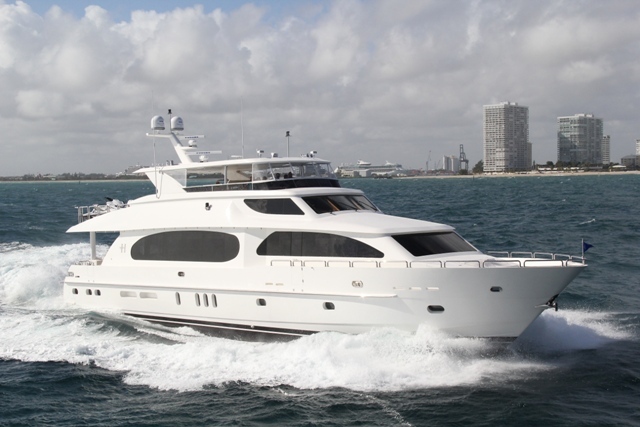 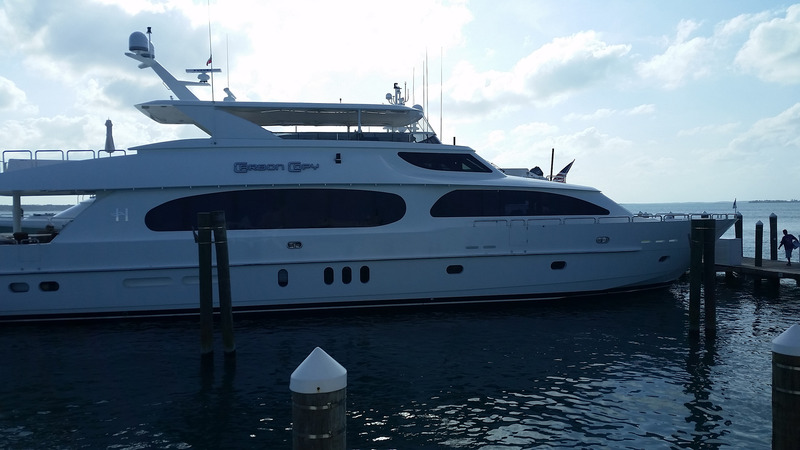 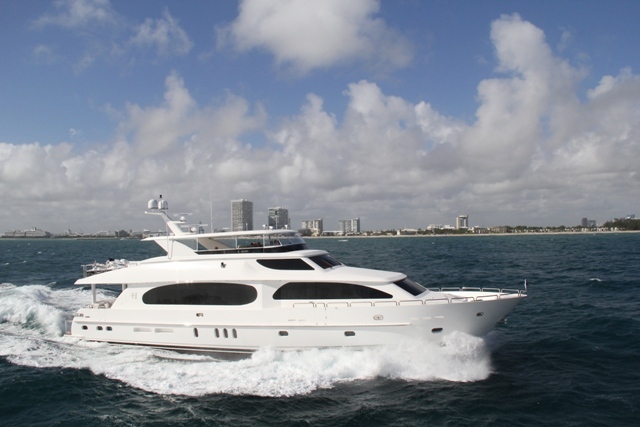 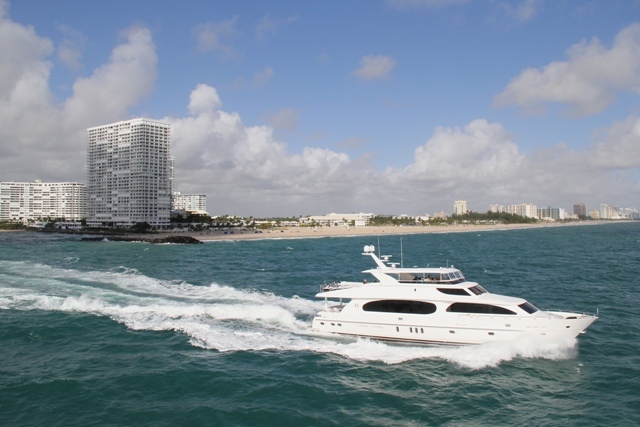 On the upper deck, features both sun and shaded areas, a deluxe Jacuzzi tub with attached marble wet bar, ample seating and fully equipped wet bar and service area. 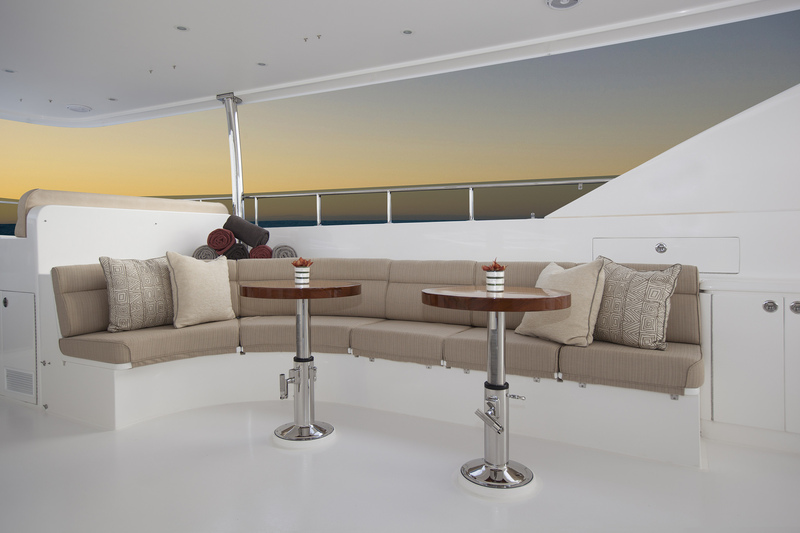 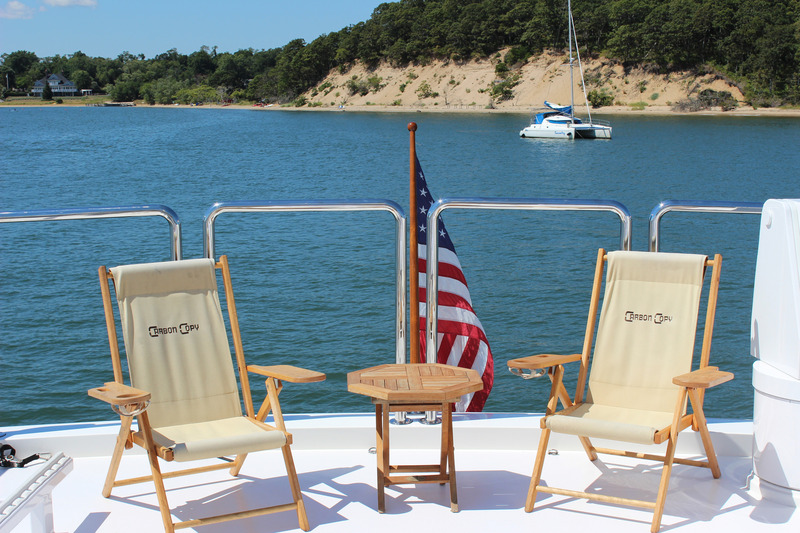 Further aft, teak chairs and a cocktail table are the ideal places to sit back and soak up the sun in style. 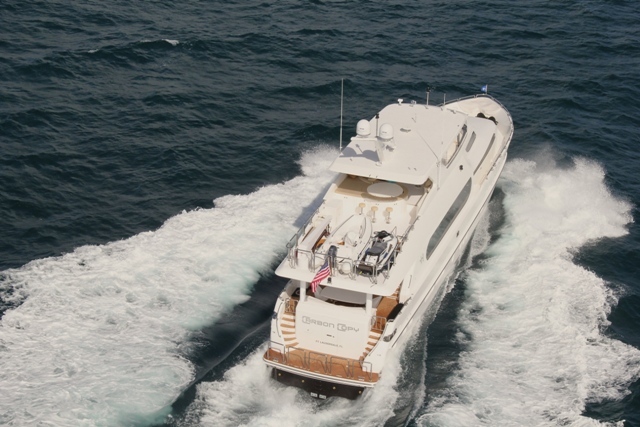 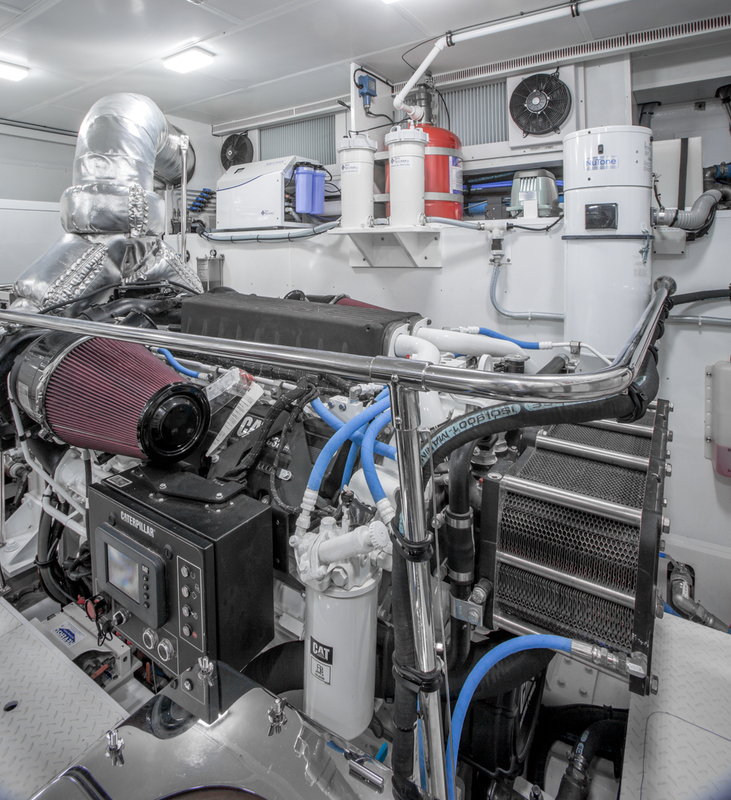 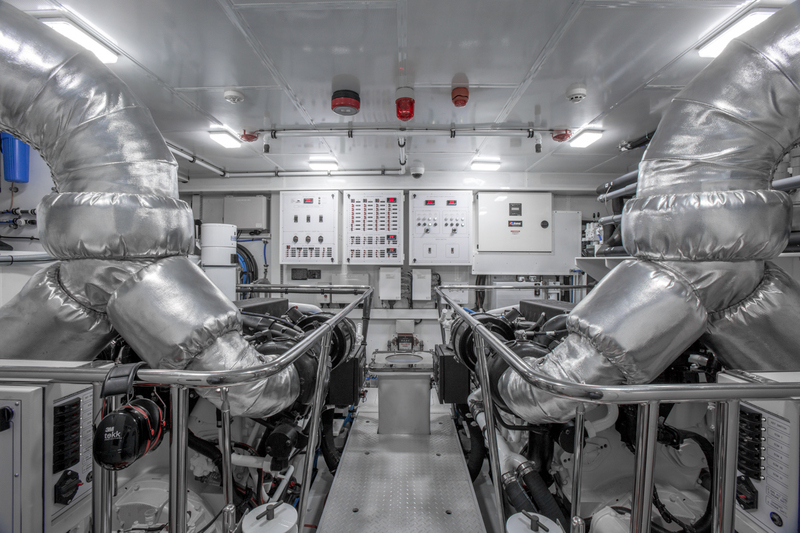 She is run by dependable CAT C-32 1700hp diesel engines, reaching a top speed of 22 knots and a cruising speed of 18 knots. 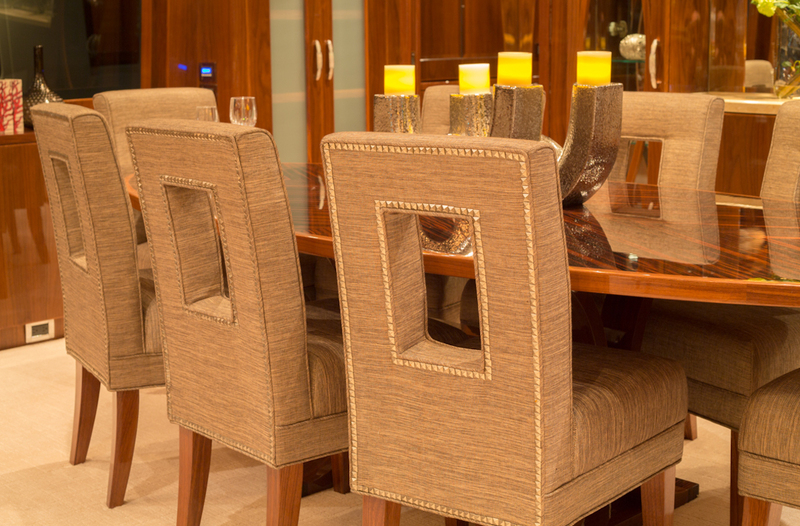 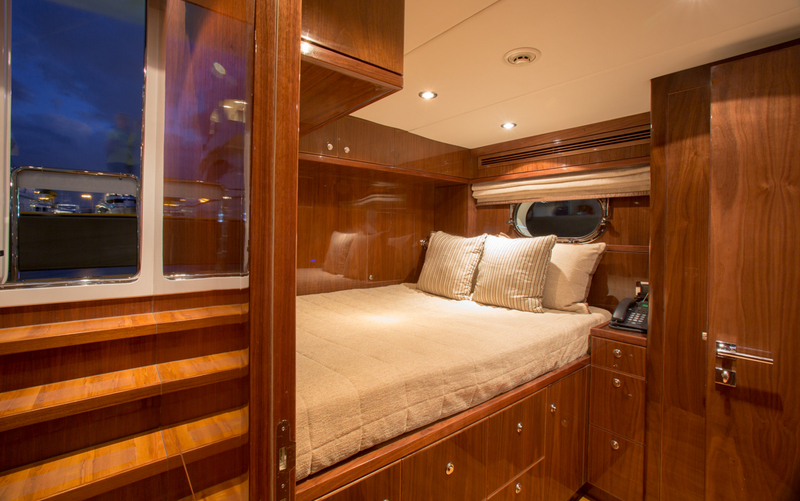 CARBON COPY can easily sleep eight guests in total, looked after by a professional crew of 5. 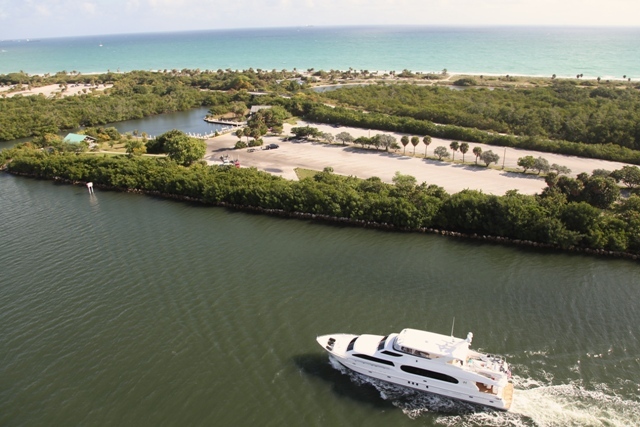 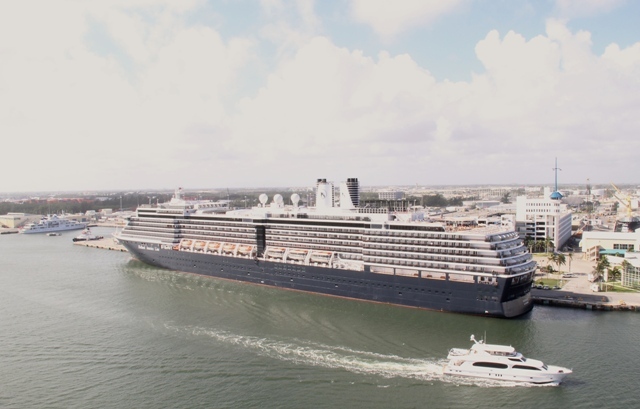 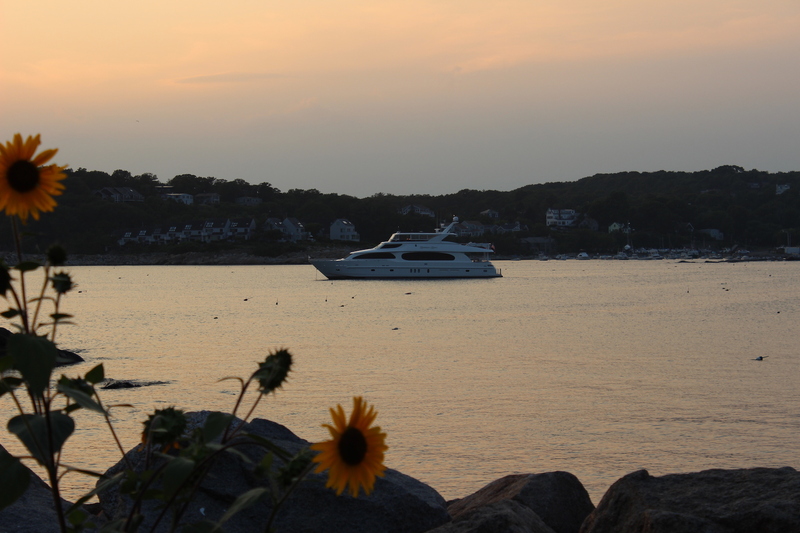 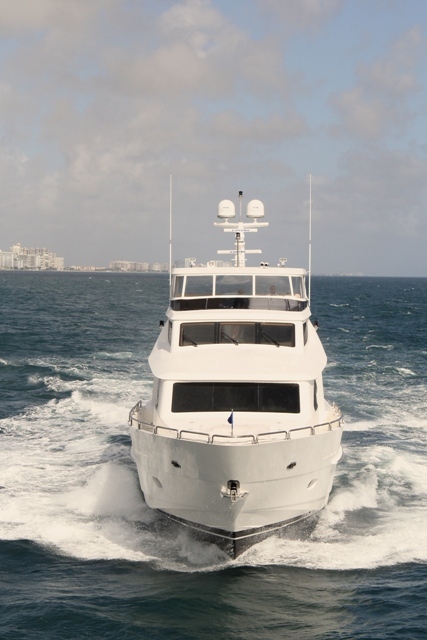 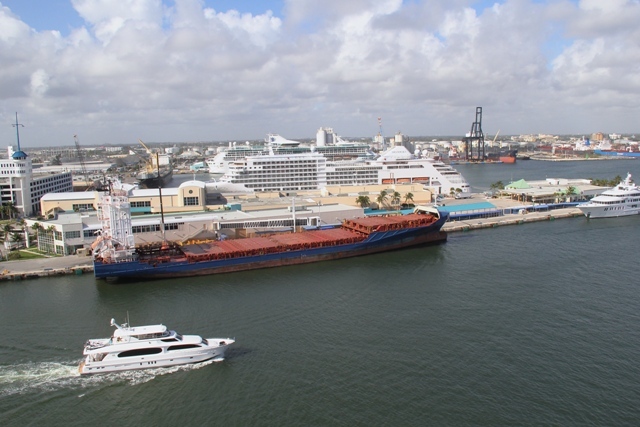 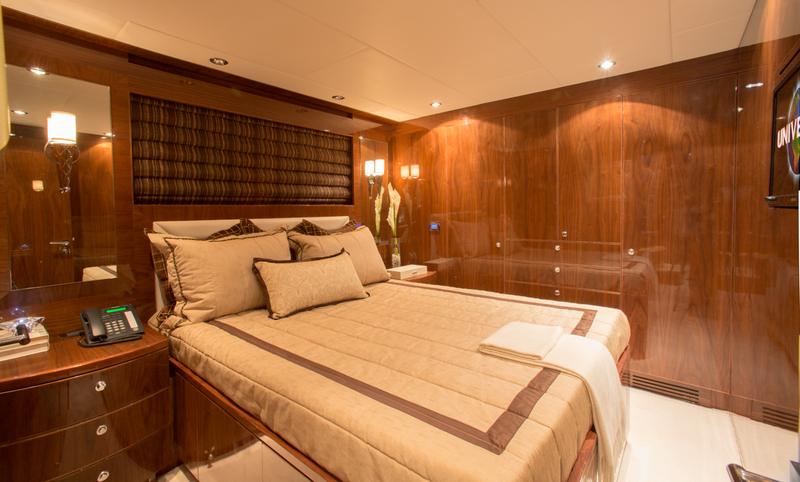 She offers four lovely staterooms, including a full beam master suite and completely private VIP suite forward. 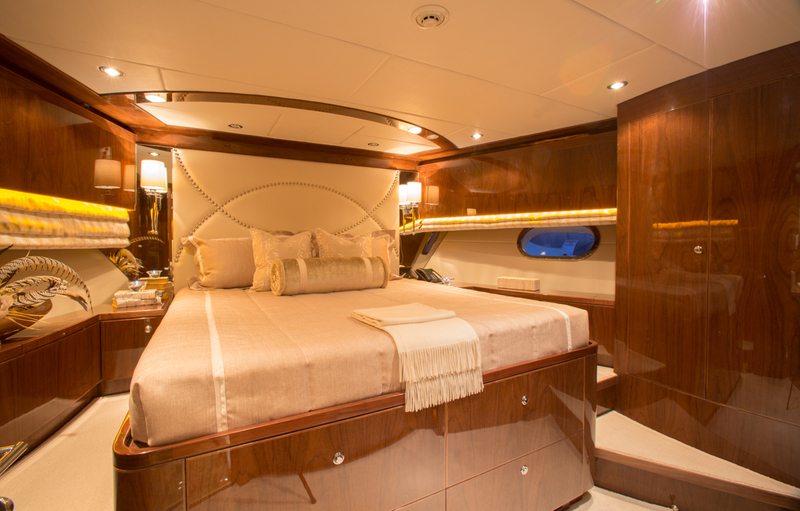 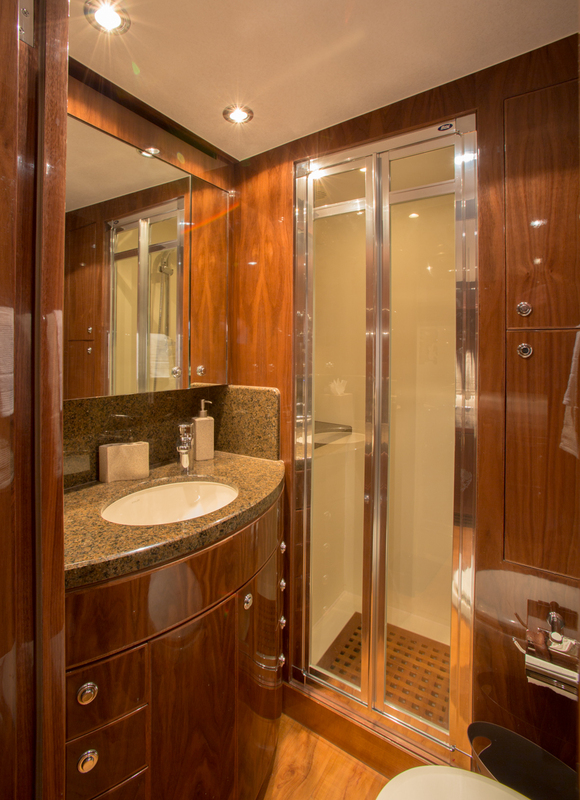 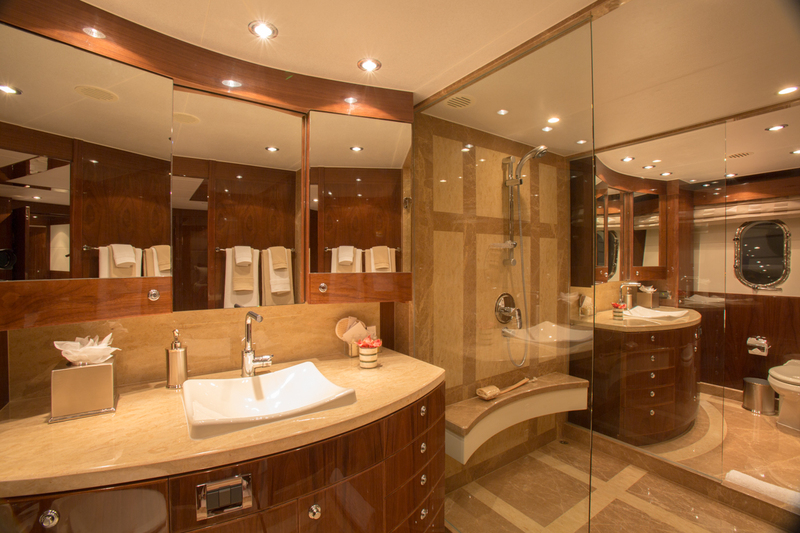 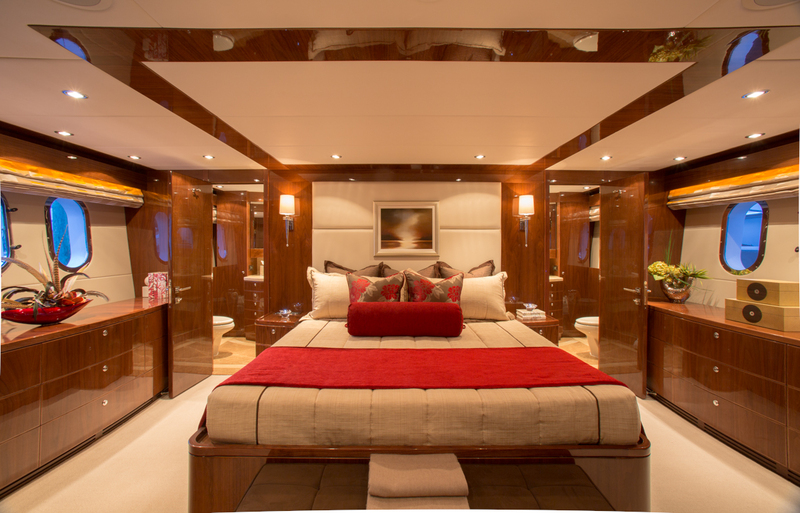 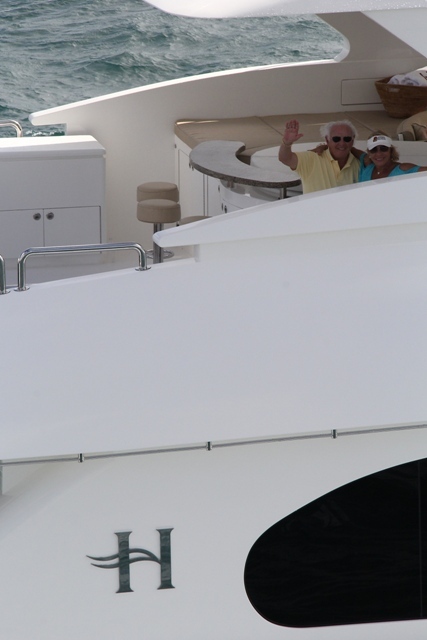 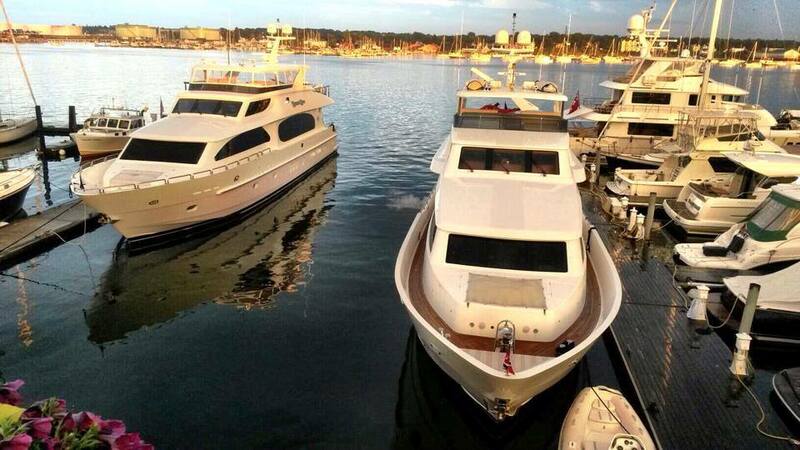 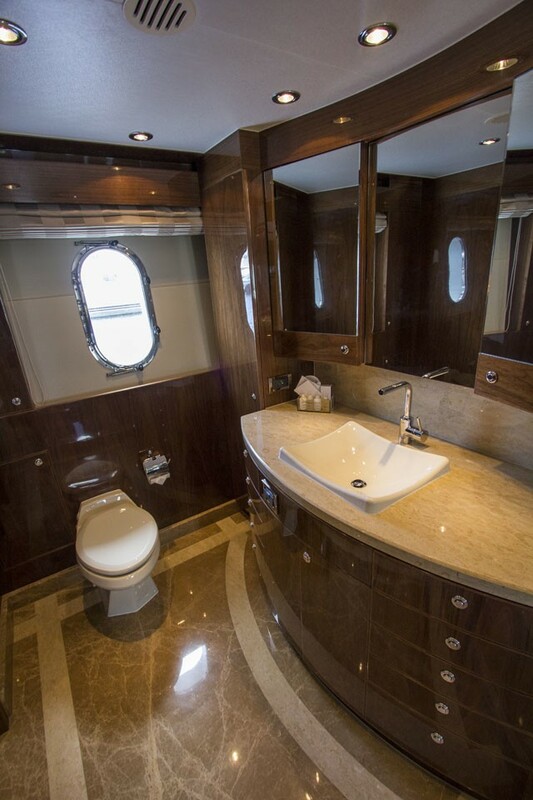 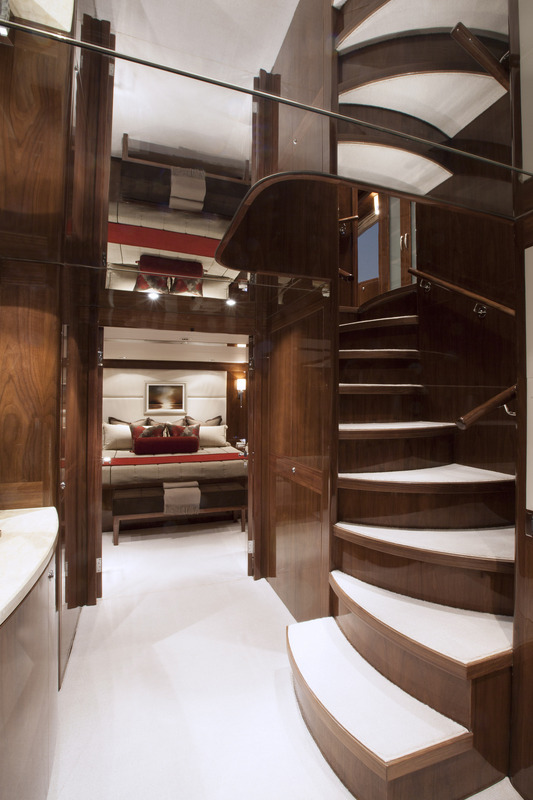 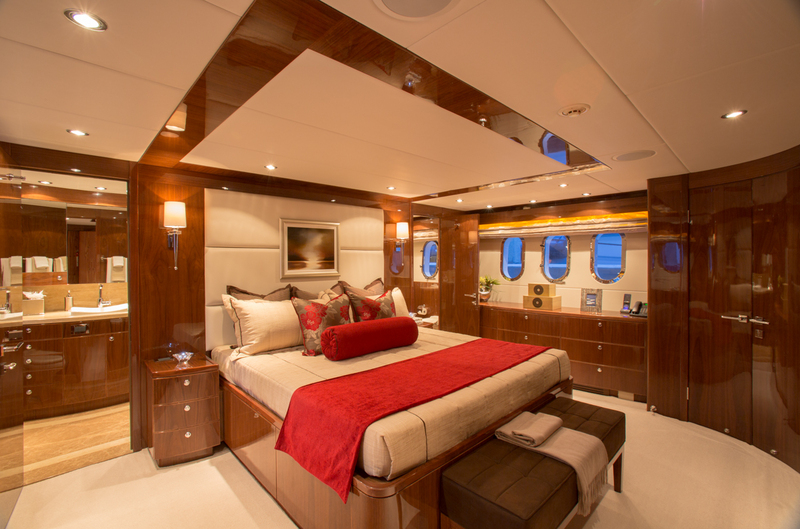 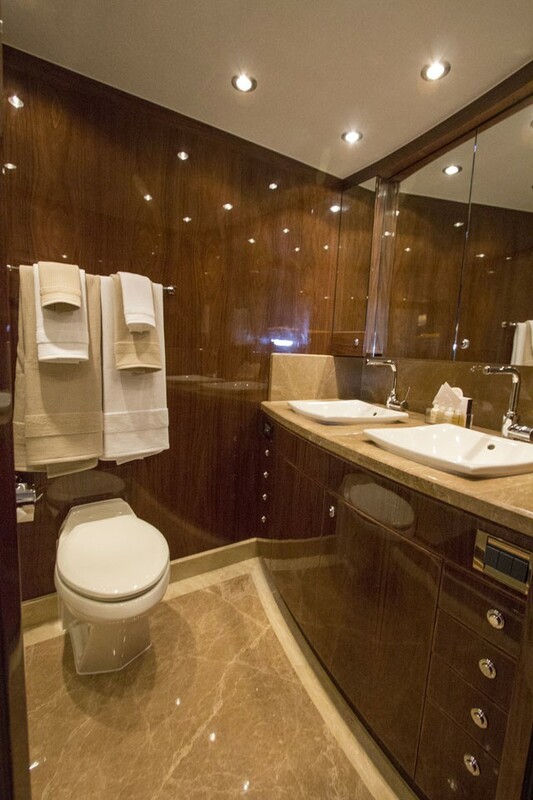 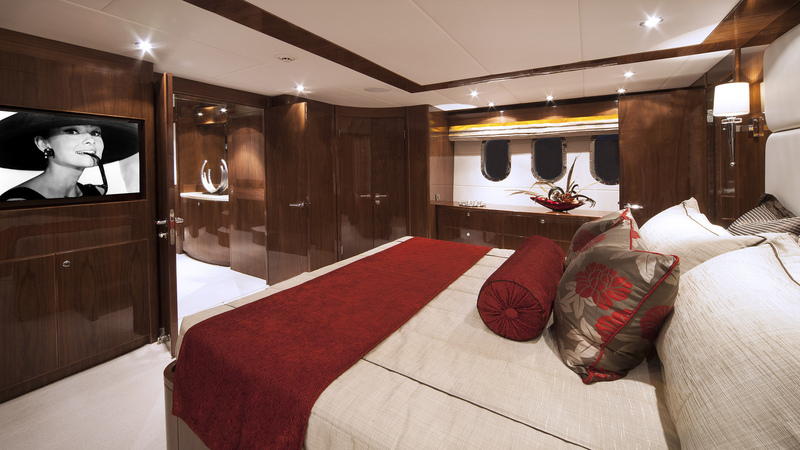 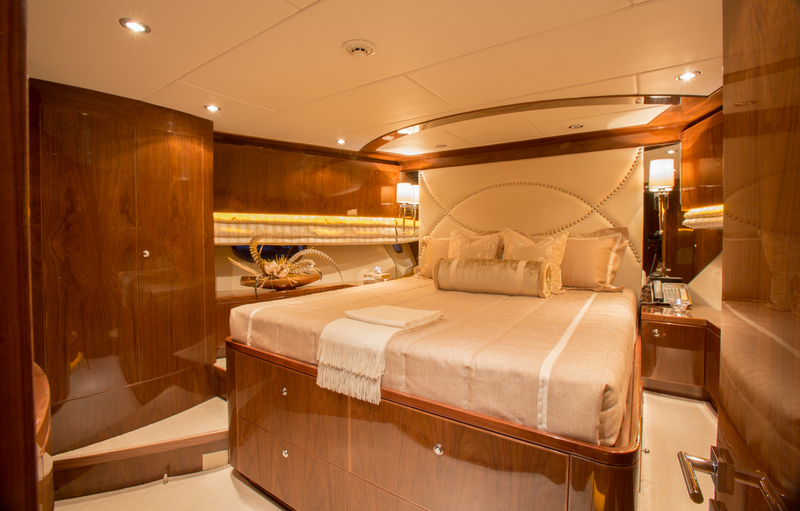 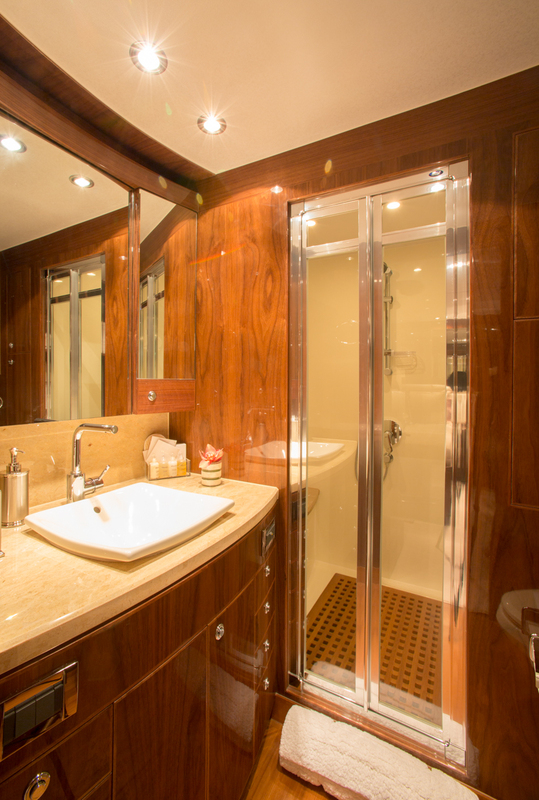 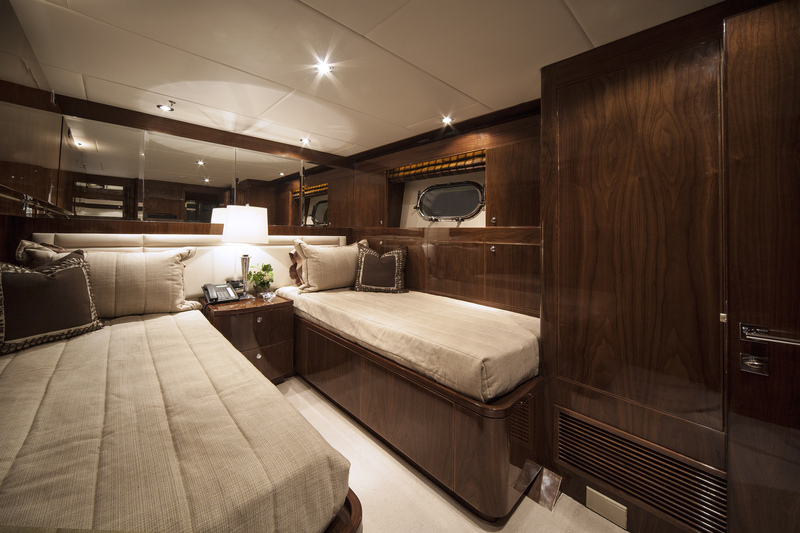 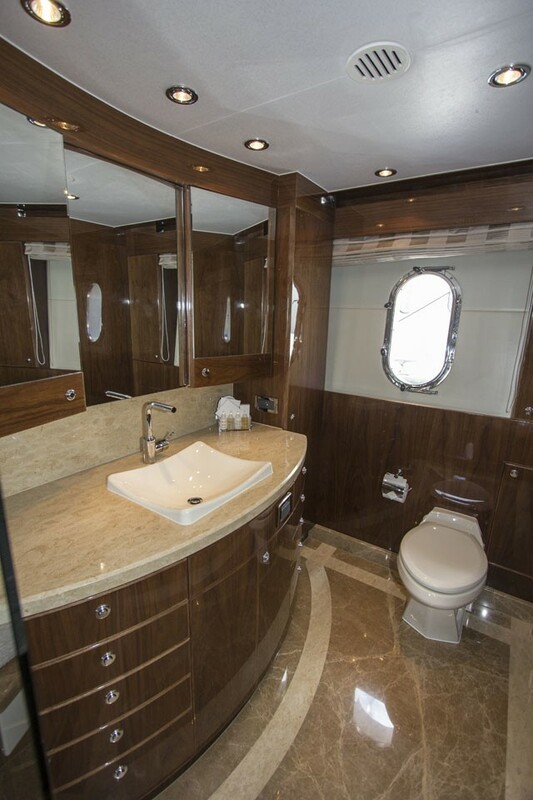 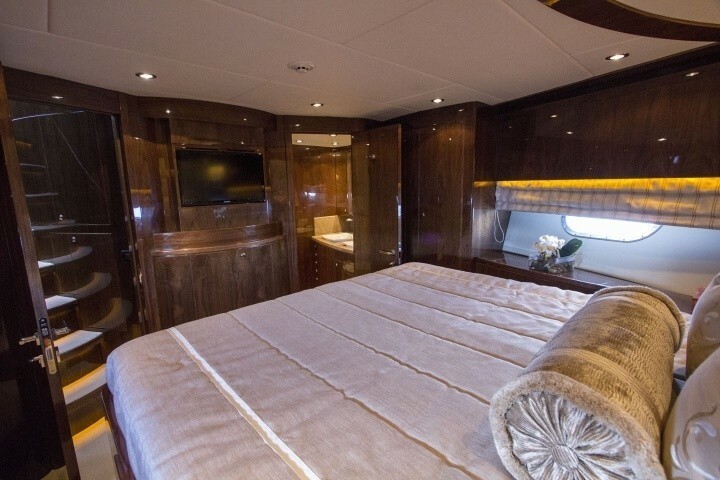 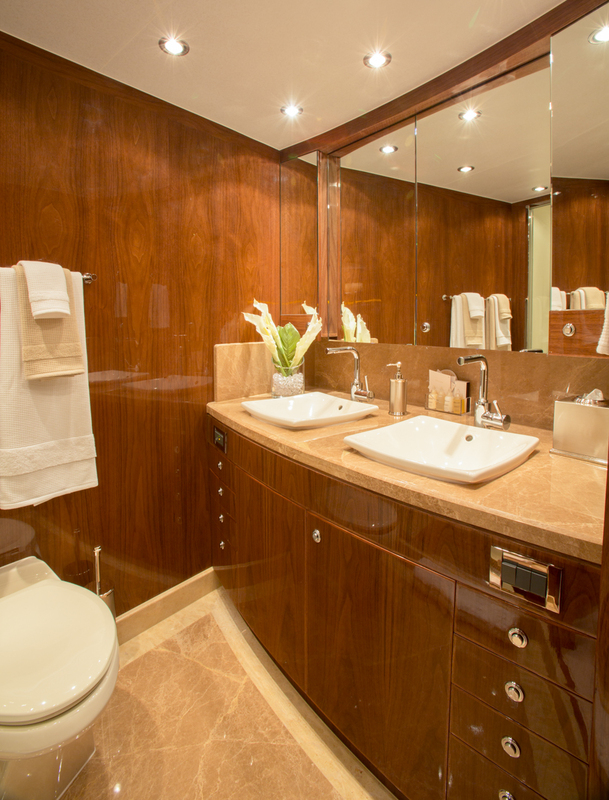 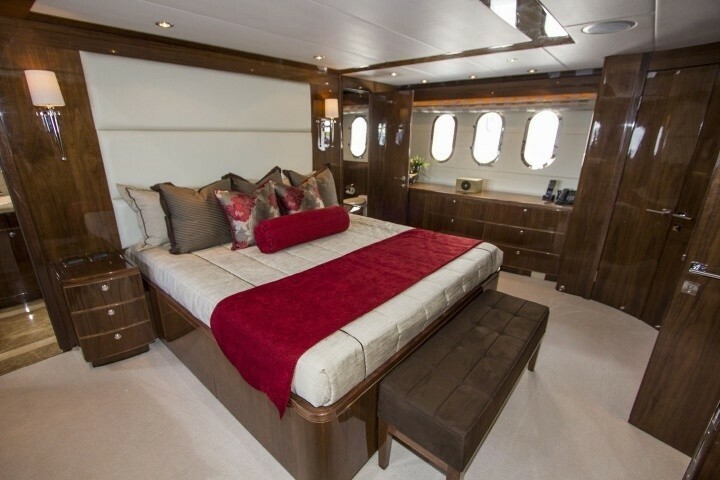 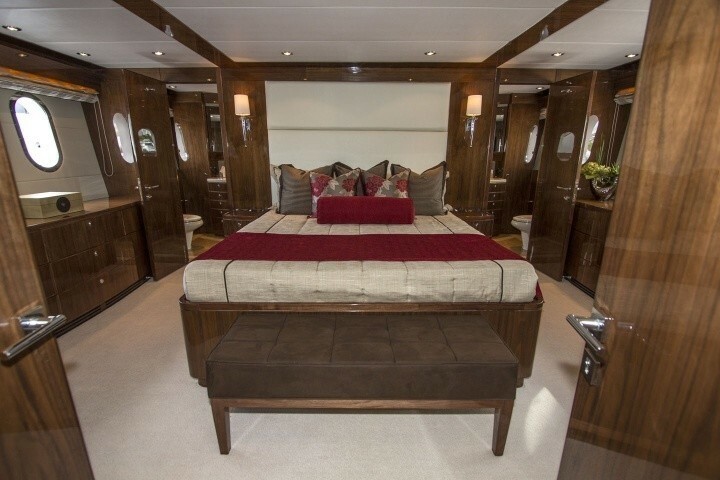 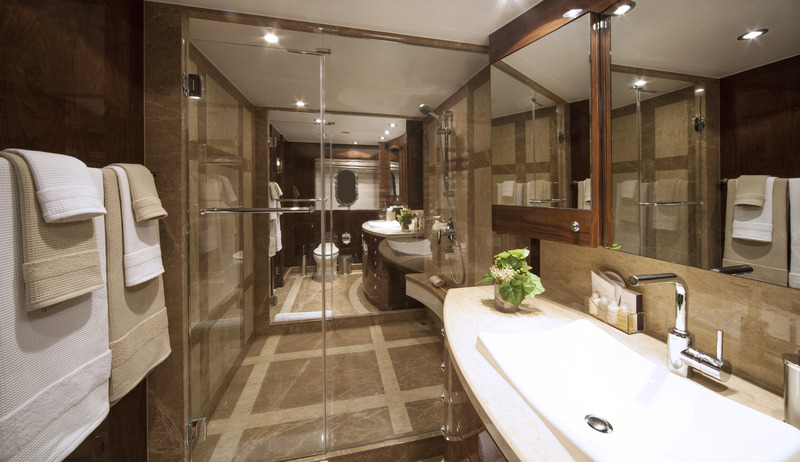 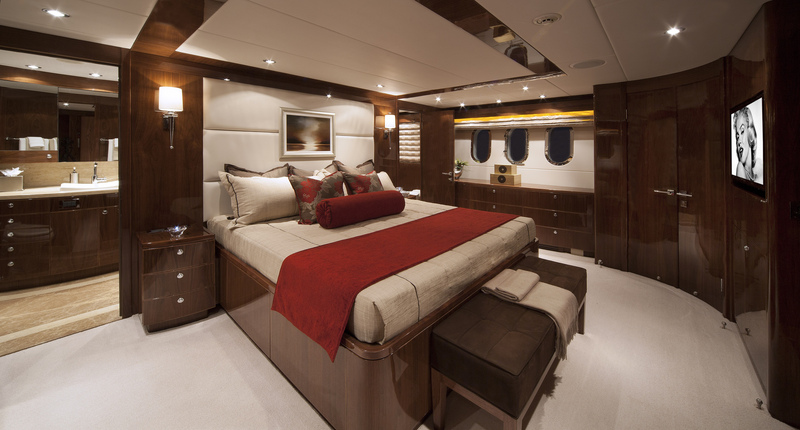 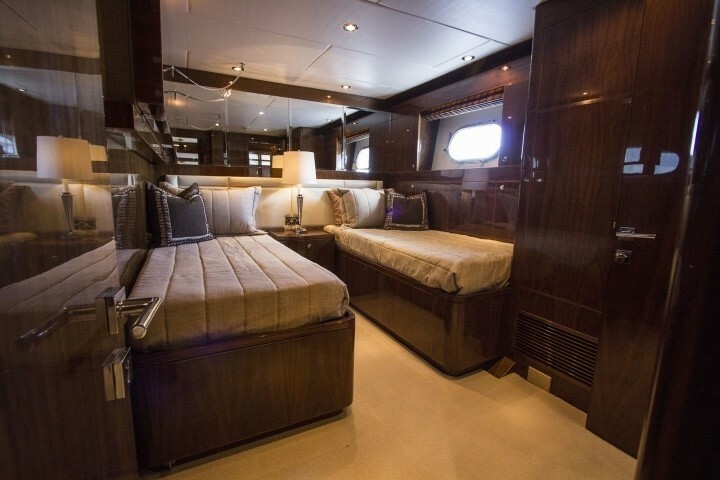 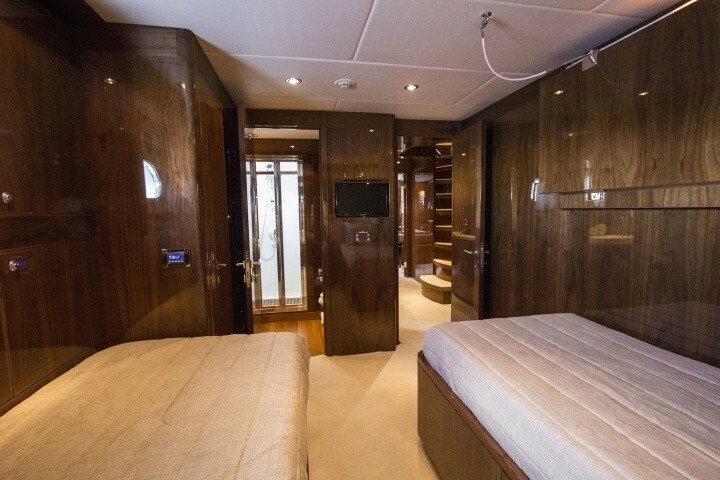 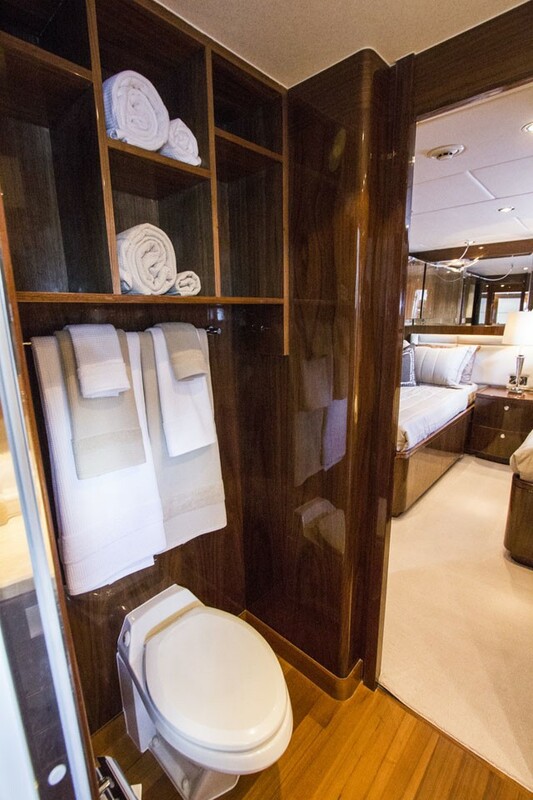 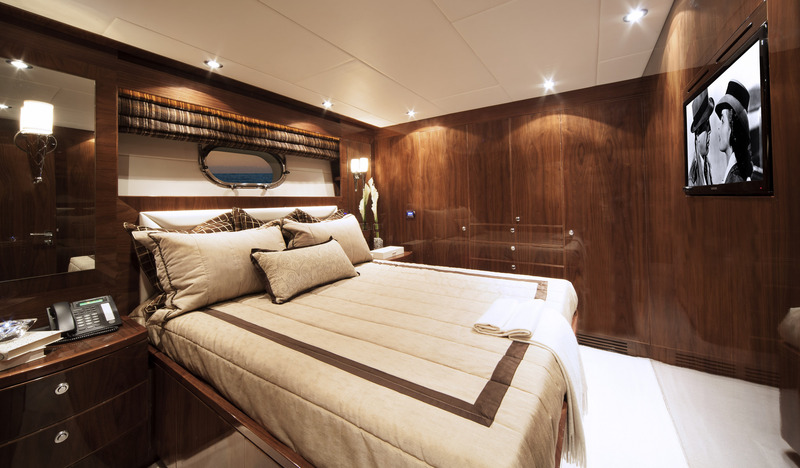 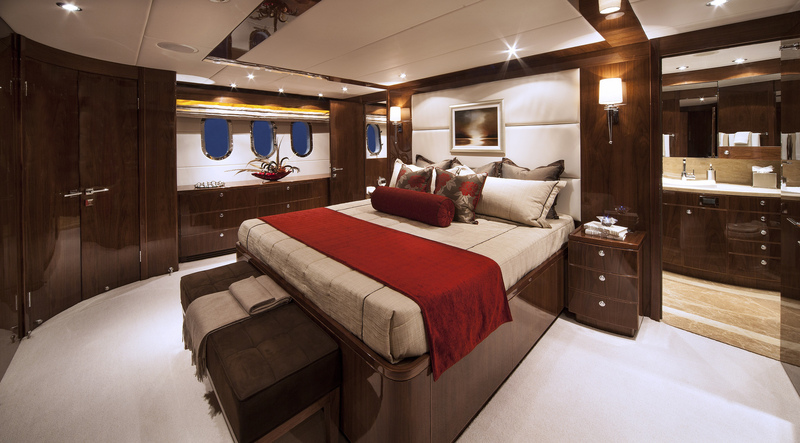 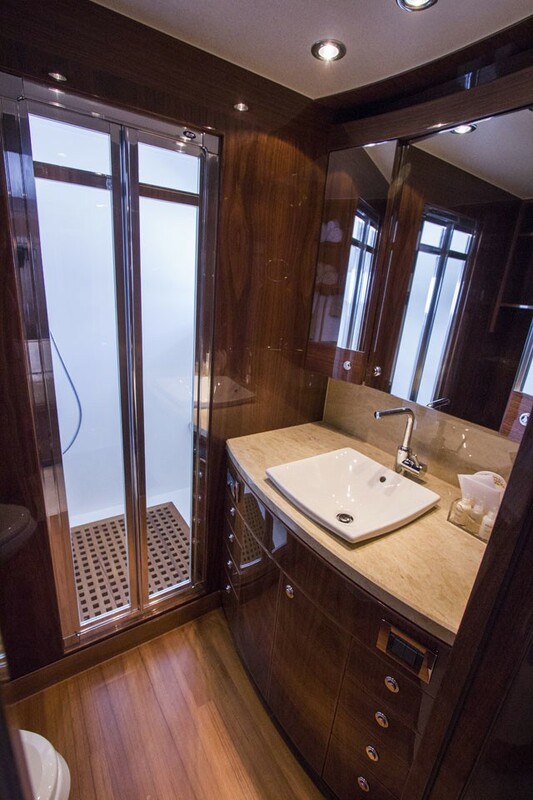 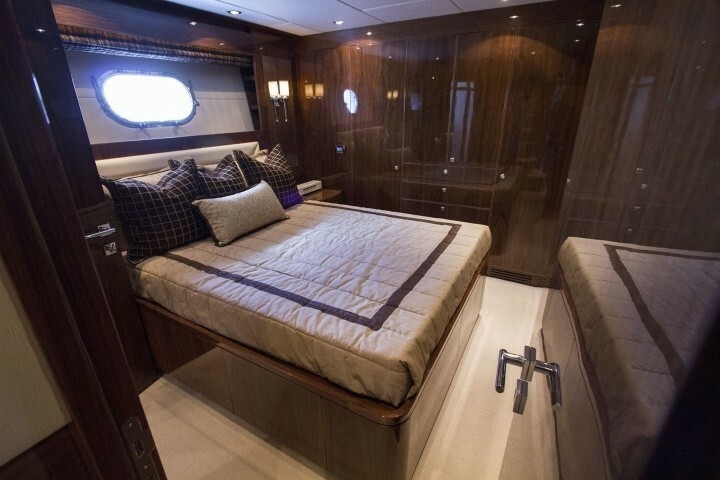 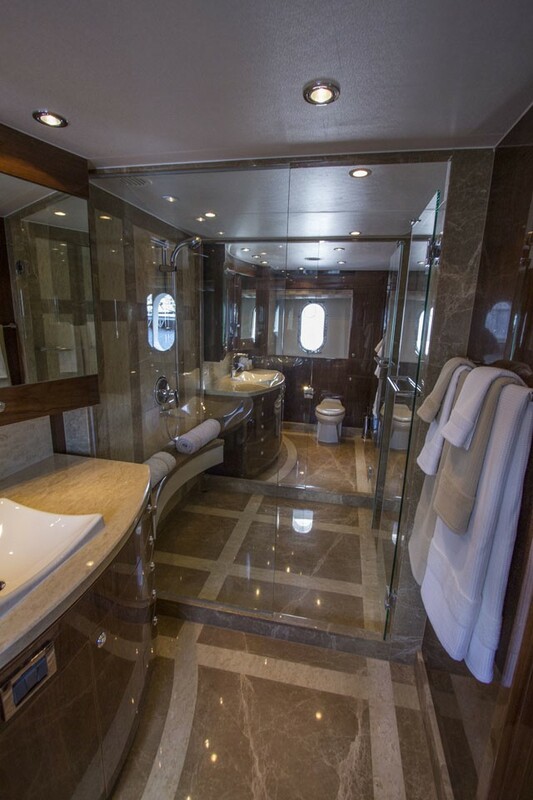 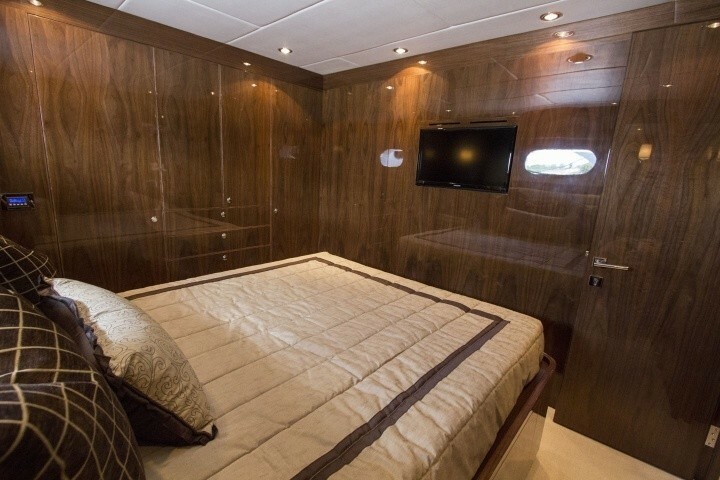 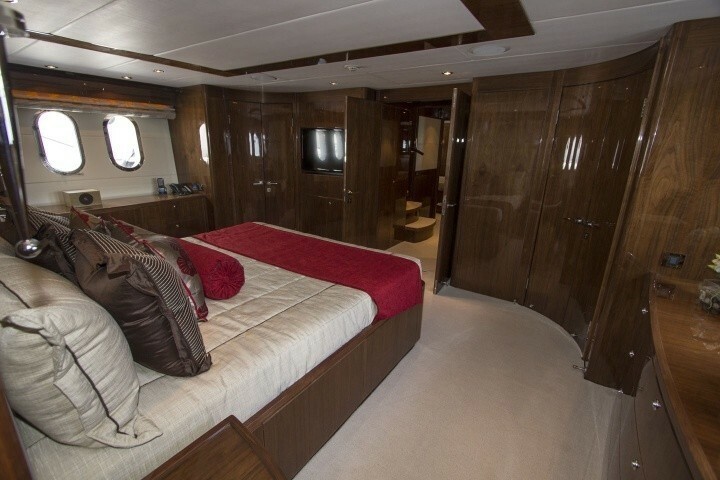 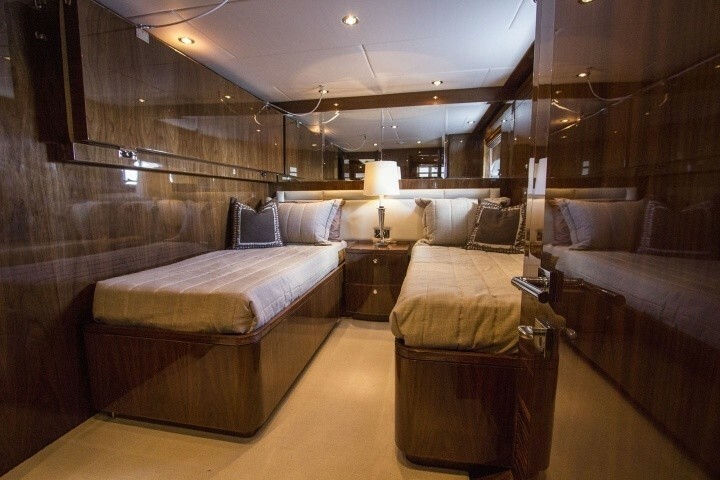 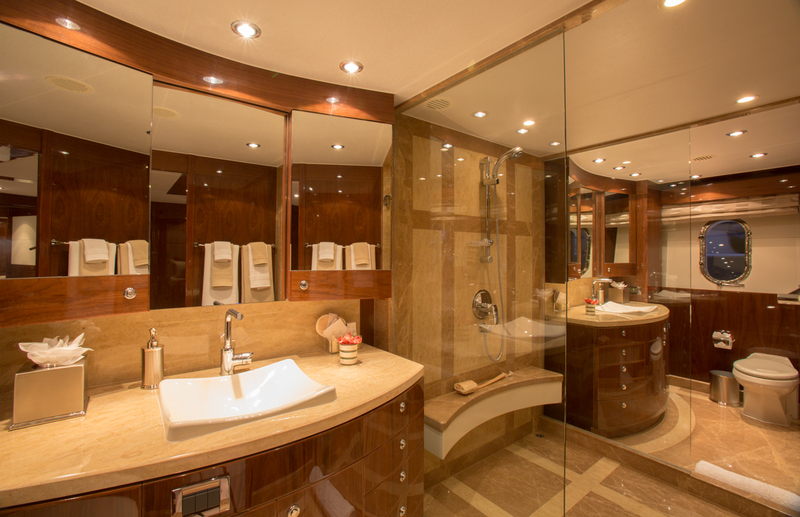 The master suite is amidships, providing a centre lined king size bed and his and hers toilets. 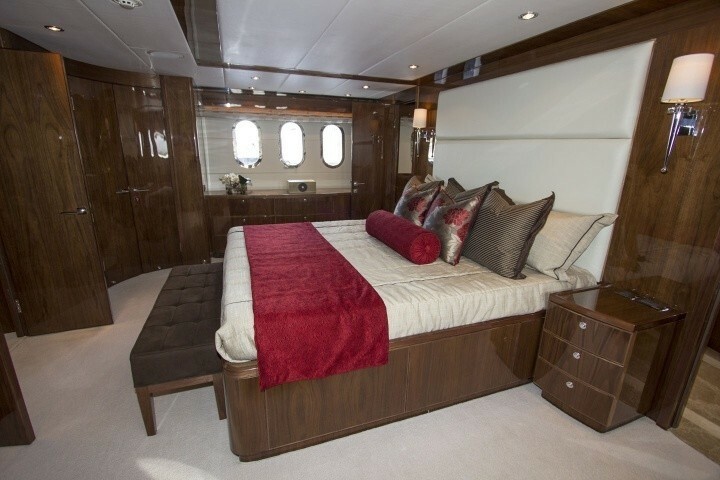 The VIP cabin is forward, with a centre lined queen size bed. 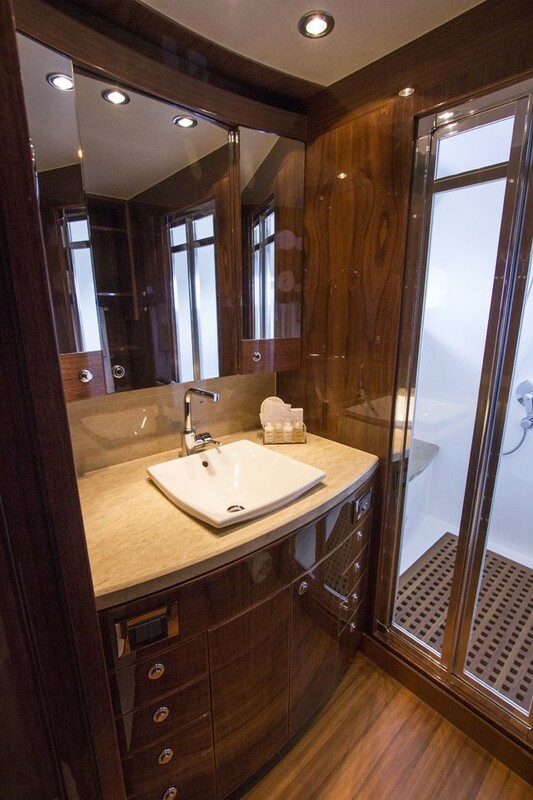 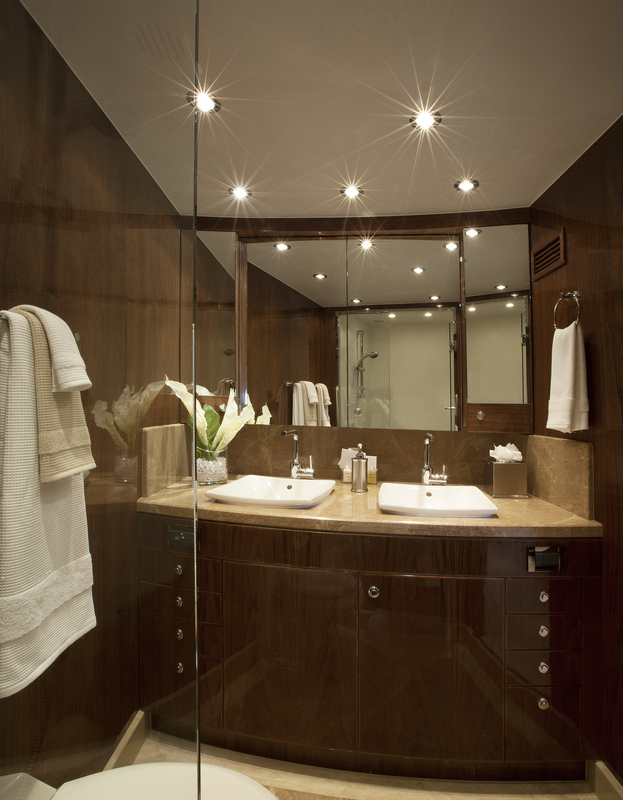 A further two guest cabins consist of one double and one twin cabin, each with private en-suite facilities.